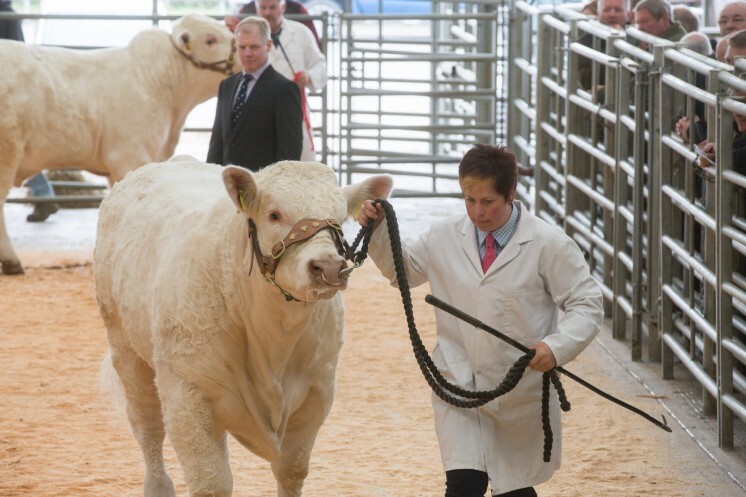 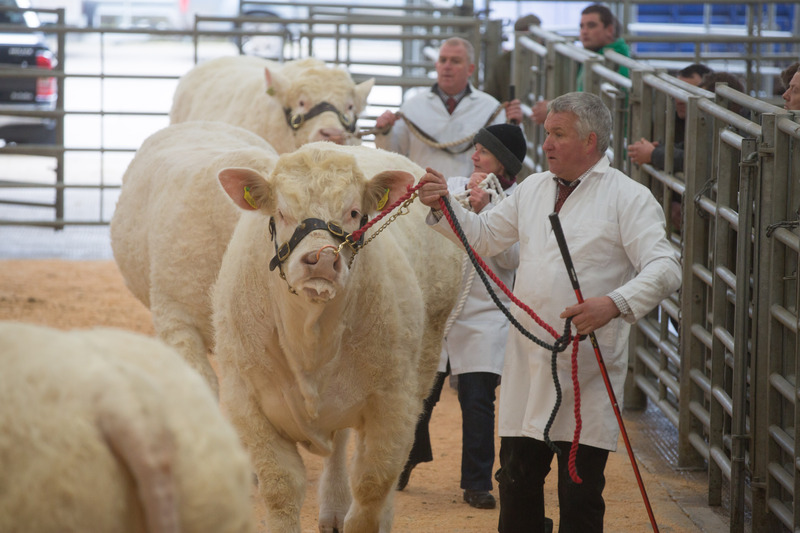 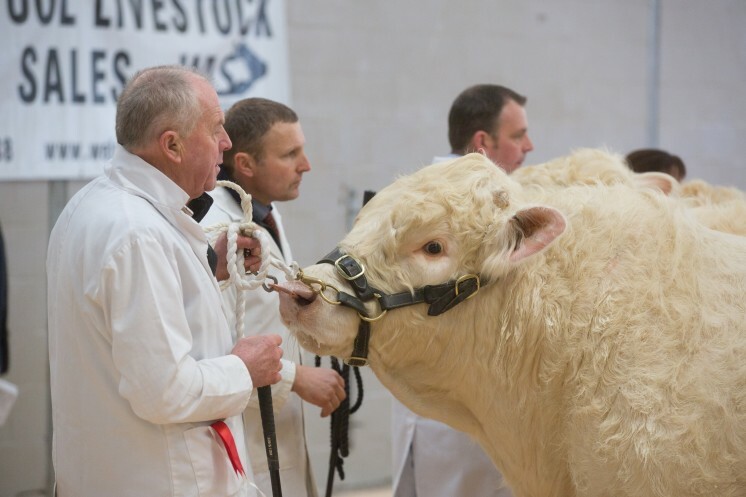 The top priced bull at 6,500gns was an 18-month-old entry from the Barker family, Caylers Charolais, Nuthampstead, Hertfordshire, who stood first in his class at the pre-sale show. Caylers Mclaren who is sired by Gretnahouse Ultimate and out of the homebred Caylers Jemma who goes back to Thrunton Dominator, went home with ER Hollinsworth and son, to work in Middleton, Manchester. 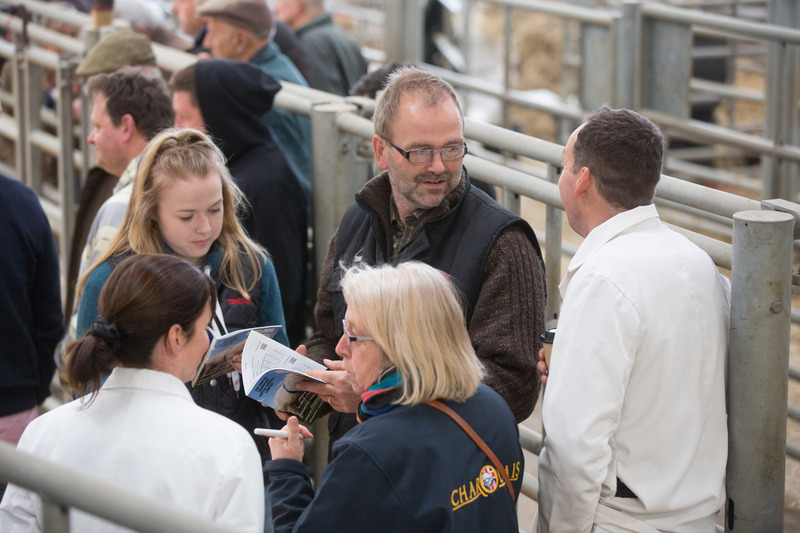 The Caylers family bulls were in demand and they sold a total of three to average £5,530, including the next highest priced lot Caylers Minstrel. R Napper, West Hagbourne, Oxfordshire, was the purchaser this time and paid 5,800gns for the blue-ticket winner and November 2016-born Minstrel, a son of the Irish-born Rosanna Jupiter and the Thrunton Dominator-sired Caylers Gigi. Another breeder who enjoyed success on the day was Flintshire vet Esmor Evans from Mold, who not only bagged the pre-sale show championship but also secured four bull sales making an average of £4,331. His highest priced lot and champion was the 19-month-old Maerdy Mauard, out of the Vald’or-Ra-sired Maerdy Hwylus and by the easy calving, high scanning, 10,000gns Stirling reserve senior male champion Blelack Fabulous, who has previously sold sons to 22,000gns and 28,000gns. 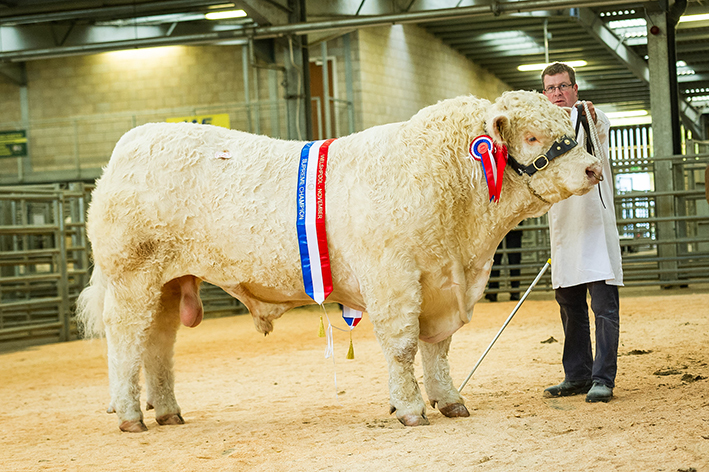 This champion lot was purchased at 5,500gns by DL and LE Davies, Llanegryn, Gwynedd. 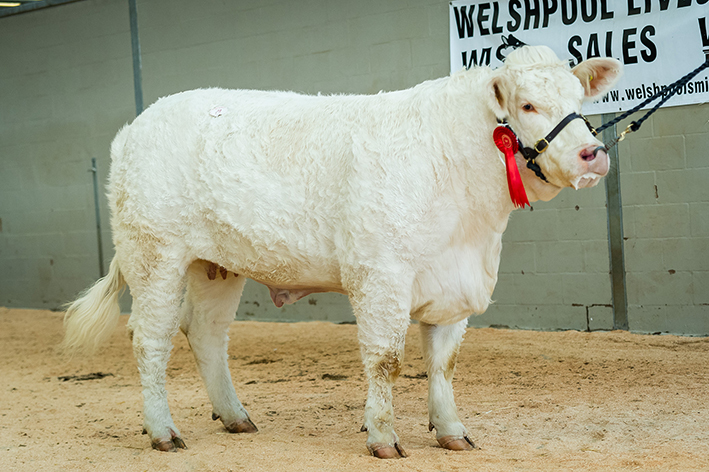 Priced at 5,200gns and selling to WT Jones and Co, Tywyn, Gwynedd, was the December 2016-born Esgob Majestic from Gareth Jones, Cwntrimnach, Gwynedd. 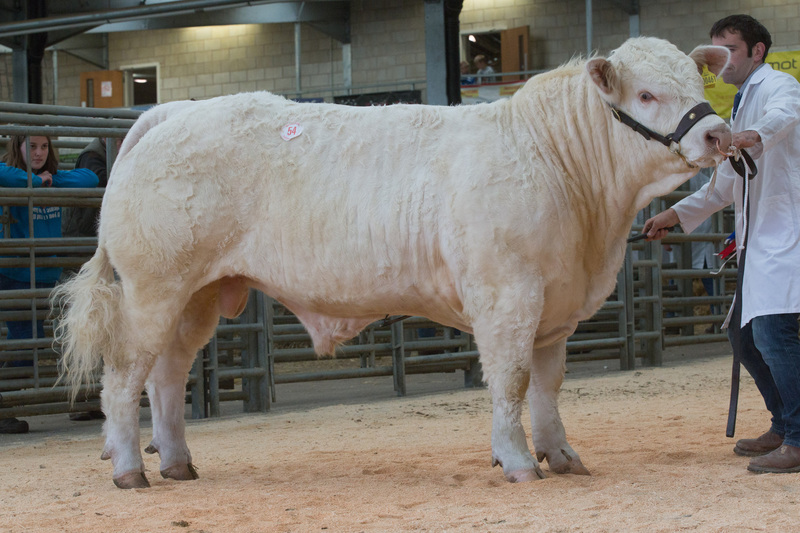 Majestic is sired by the 26,000gns Carlisle junior champion Anside Excalibur and out of Esgob Diva who goes back to the 18,000gns Thrunton Virginian. 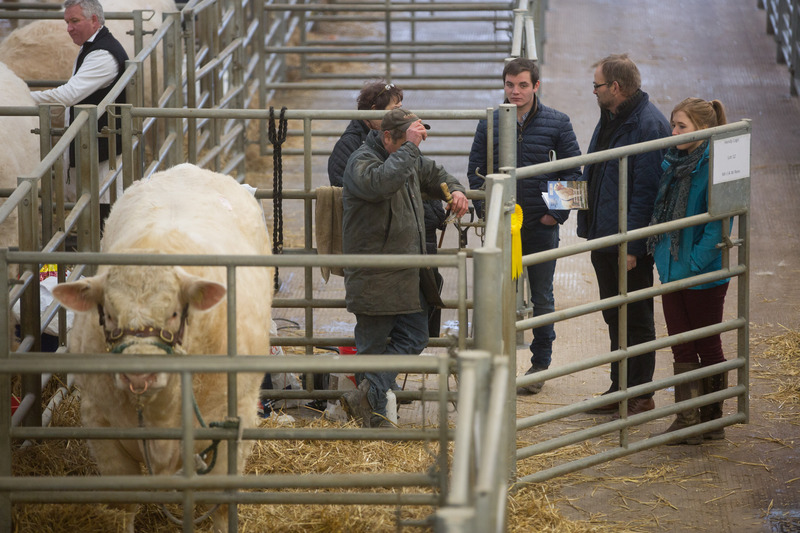 Two lots secured the next highest price of 5,000gns a piece and the first was a 19-month-old Wesley Evolution son, Trannon Montgomery from John Williams, Caersws, Powys. Montgomery’s home-bred dam Trannon Hanna is sired by Wernvale Chico and he caught the eye of GE Davies and Sons, Llanrhaeadr, Shropshire. 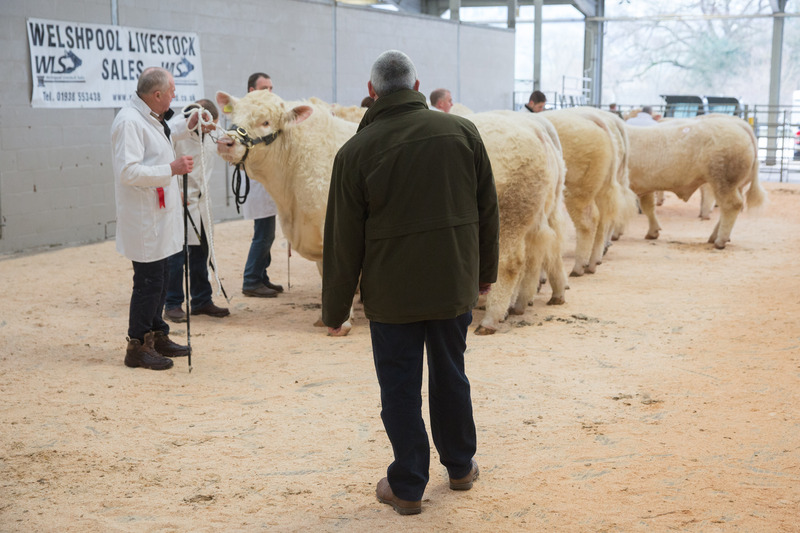 Also at 5,000gns and this time selling to Mr A Jones, Bettws Y Coed, Gwynedd, was a 17-month-old offering from Kevin Thomas, Capel Iwan, Carmarthenshire. 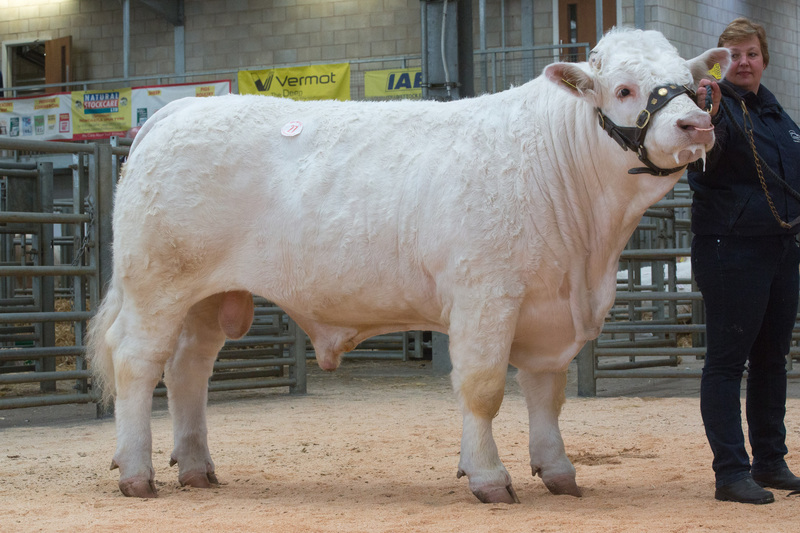 Moelfre Morgan is sired by the 12,500gns Stirling class winner Balmyle Impression, who has proved to be a shrewd purchase for Mr Thomas, already producing four sons whose sales have averaged 7,500gns a piece and the Royal Welsh show junior male champion Moelfre Magic. 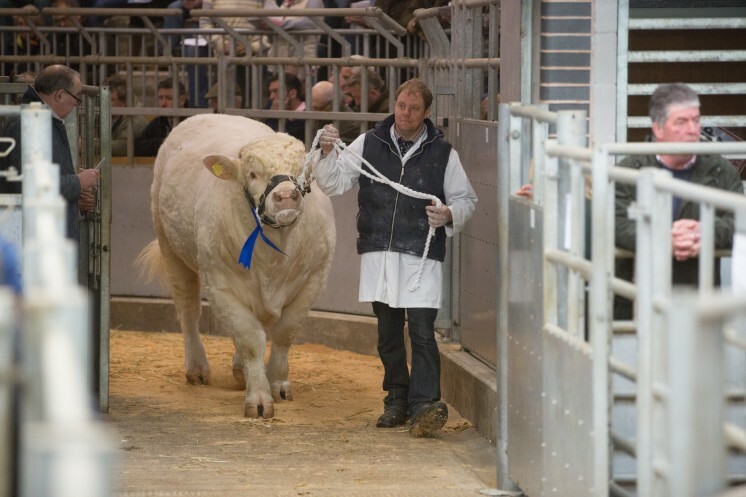 His dam Moelfre Forgetmenot goes back to the French-bred Texan. 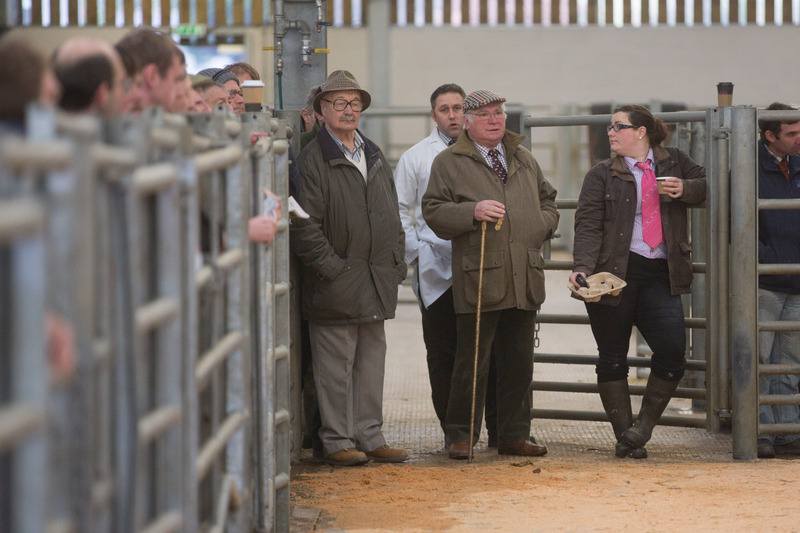 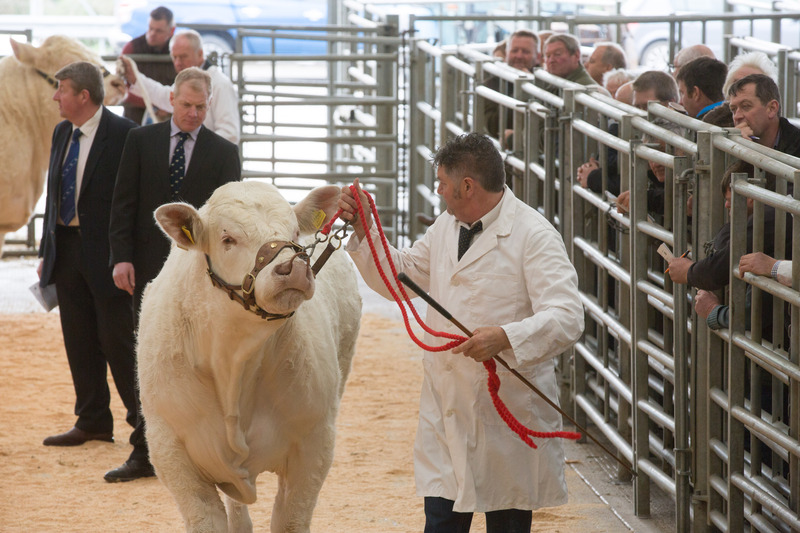 The oldest and first lot of the sale sold for the next highest price of 4,500gns. 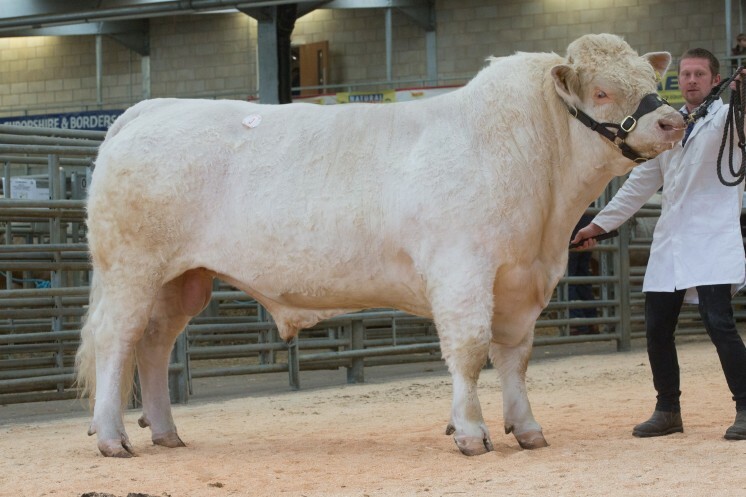 Finnwest Massey who is a July 2016-born son of the proven easy calving and short gestation Blelack Digger and Brailes Asteroid-sired Finnwest Indigo, was bred and exhibited by Paul Weston, Ashbourne, Derbyshire and sold to LF James and Son, Cilmaengwyn, Swansea. 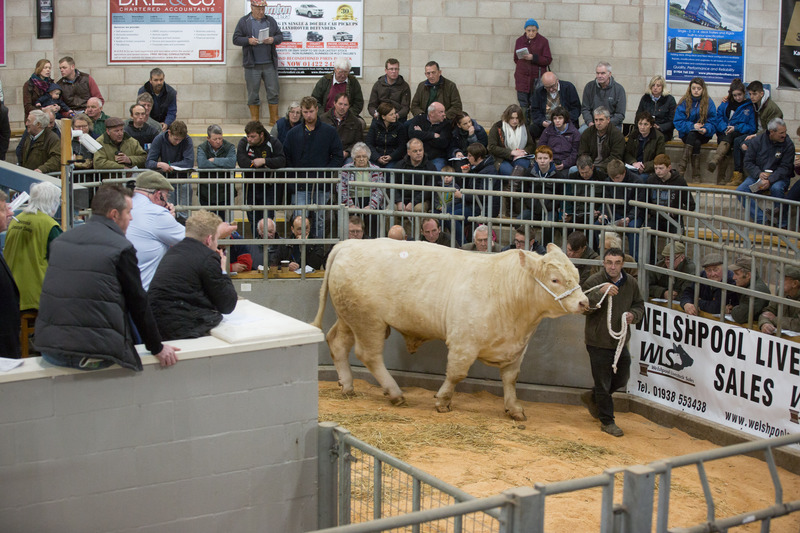 Another lot was also knocked down at 4,500gns, this time selling to Mr B Bridgewater, Rhulen, Powys. Graiggoch Magnum, a 16-month-old, who had stood third in his class earlier in the day for breeder Gerwyn Jones, Nebo, Conwy, is sired by the 16,000gns Stirling junior champion and Caithness Show champion Clyth Diplomat and out of Thrunton Starband who goes back to the 25,000gns Perth supreme champion Mowbraypark Orlando. 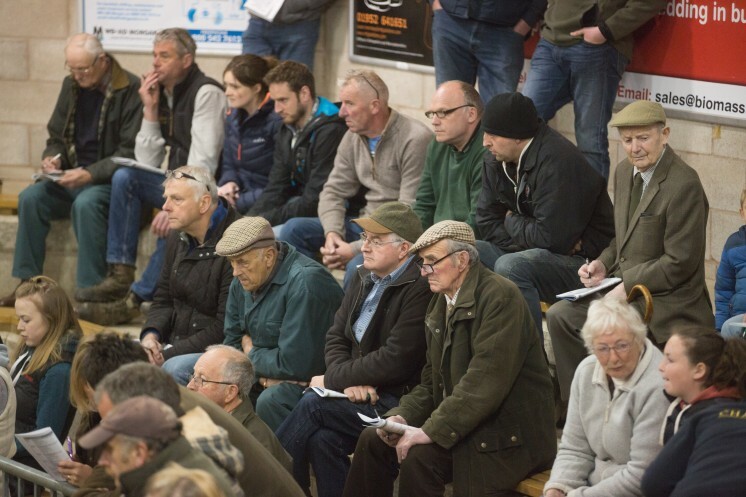 Another Derbyshire breeder was in the money when Thomas Cox from Great Longstone, secured 4,300gns for the November 2016-born Bleaklow Magnum. This son of the 12,000gns Carlisle reserve senior champion Wesley Equinox and Royal Highland Show reserve junior bull Elgin Davinci-sired Bleaklow Jlo was purchased by AJ and JM Abberley, Llandrindod Wells, Powys. 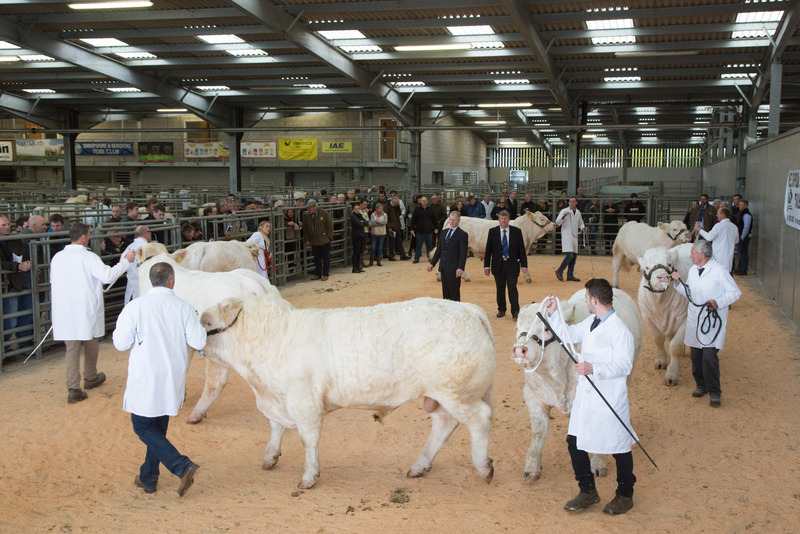 A couple of lots secured a price of 4,000gns and the first was a yellow-ticket winner from the aforementioned Esmor Evans, Mold, Flintshire. Maerdy Muir, an 18-month-old who is sired by Blelack Fabulous and out of Maerdy Eglantine, a French-bred Populair daughter, went home to Llandefalle, Powys, with CE and A Millichap. 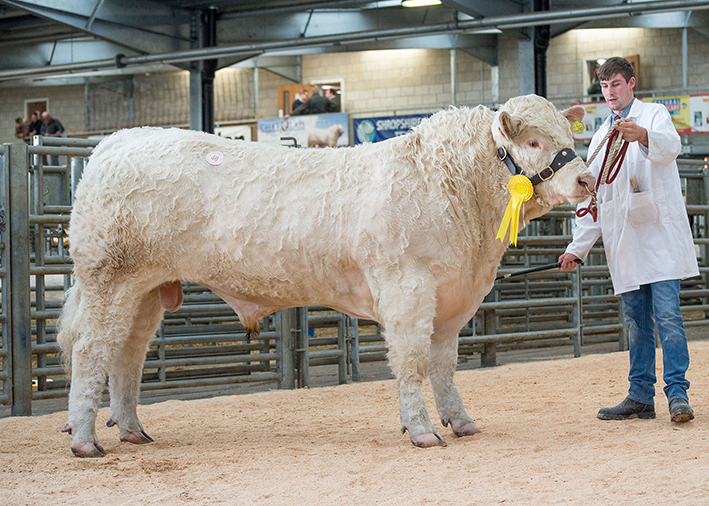 Also making 4,000gns was a class winner from Gareth Jones, Cwntrimnach, Gwynedd, who stayed local when he was purchased by E and LG Williams, Abergele, Gwynedd. 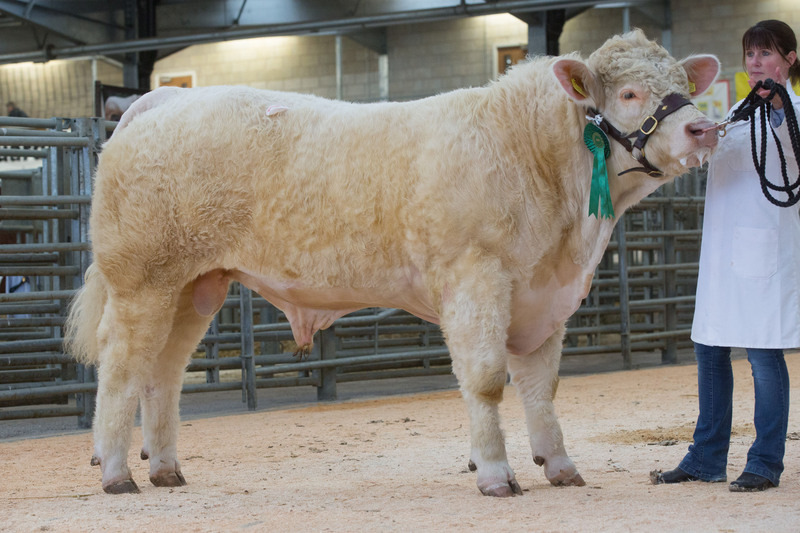 Esgob Neu, a 15-month-old by the Irish-bred Goldstar Gentleman, is out of the home-bred Esgob Helen who is turn is sired by the 26,000gns Carlisle junior champion Anside Excalibur. 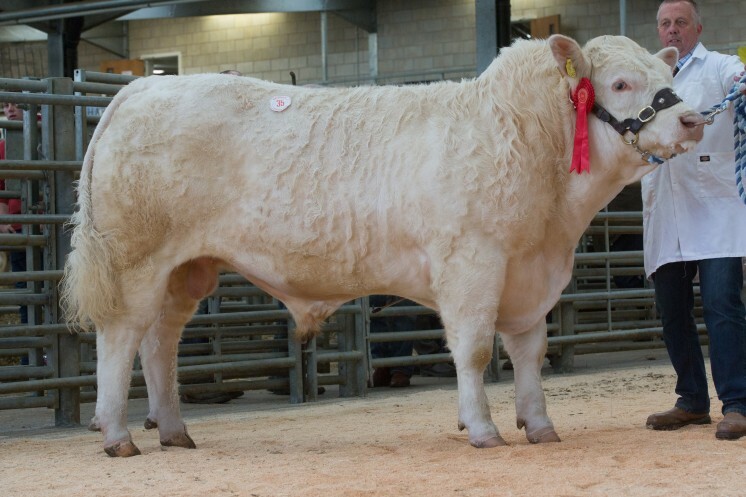 A heifer from Richard Butler, Barbers Bridge, Gloucestershire, was the only female lot of the main sale. 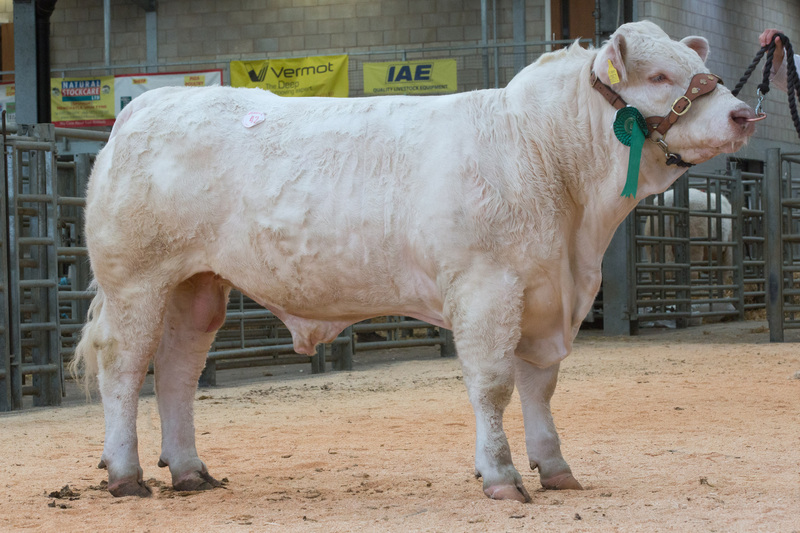 Carrigbeg Moo is a two-year-old by the 11,000gns Balthayock Adonis, whose dam Congress Isadora is a daughter 25,000gns Perth supreme champion and Highland Show junior champion Goldies Unbeatable. 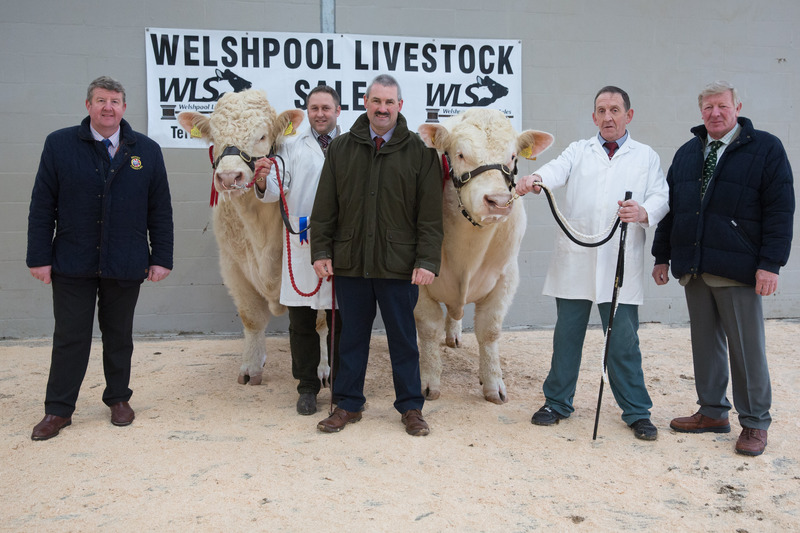 RWL and JE George, Llanfair, Caereinion, Powys, purchased her for 1,950gns. A small reduction of six cow and calves from the Harman family, Chesham, Buckinghamshire, was also featured at the sale. 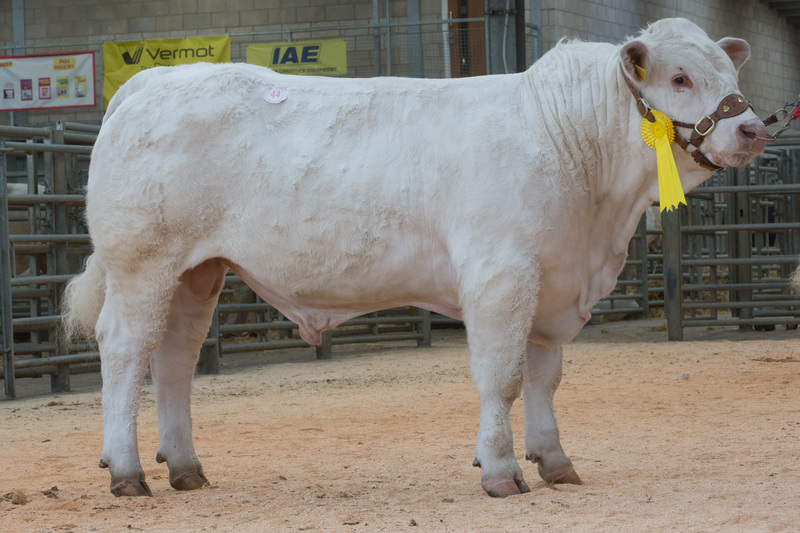 The top priced at 2,400gns was the mother and daughter duo – 2014-born Silver Janet and her four-month-old heifer calf Silver Nectar. 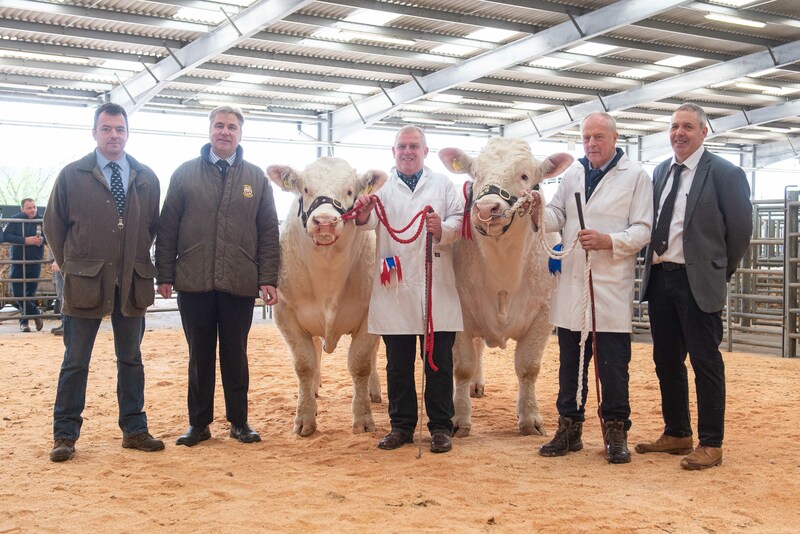 The 18,000gns Thrunton Fairfax sired Janet, is out of Silver Borghild, a Chesham Pingpong daughter, while her daughter Nectar is sired by the 14,000gns Stirling supreme champion Barnsford Jubilant. 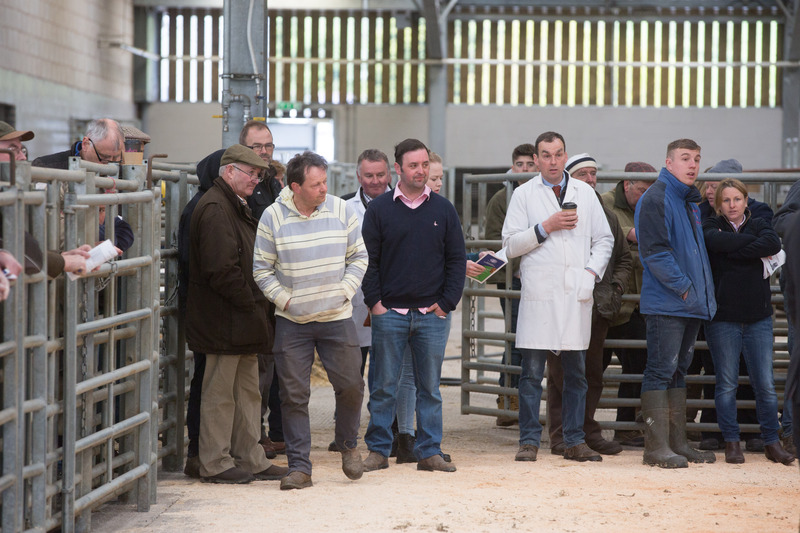 The aforementioned Hollinsworth family were the purchasers. 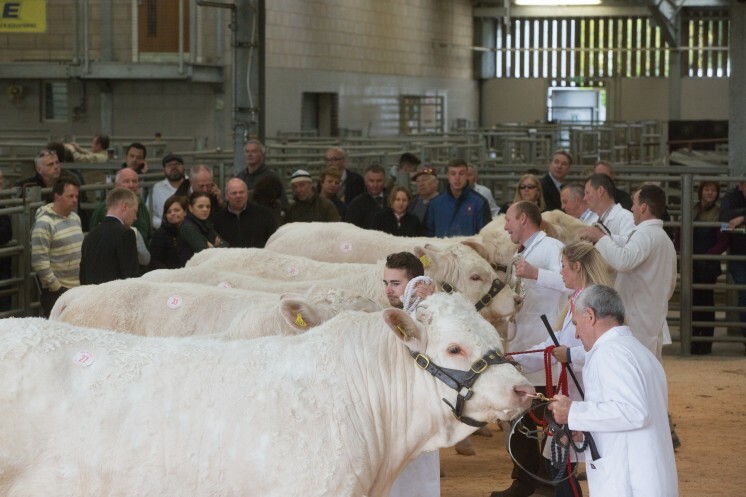 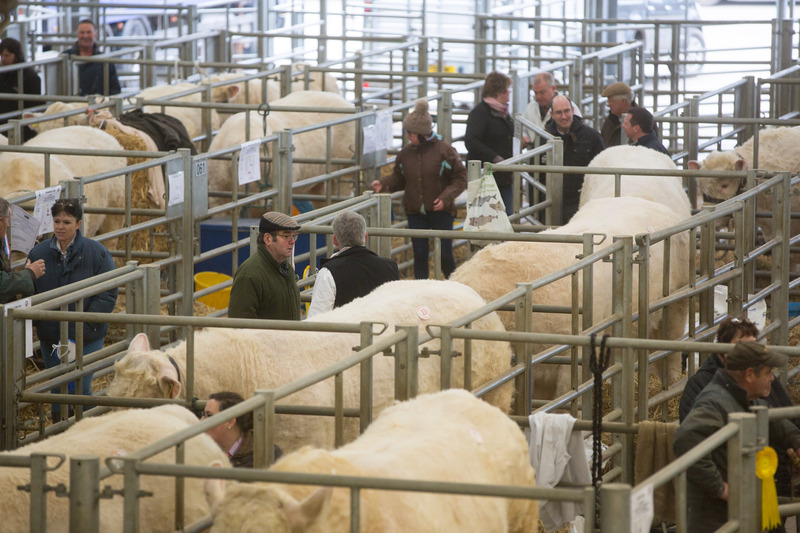 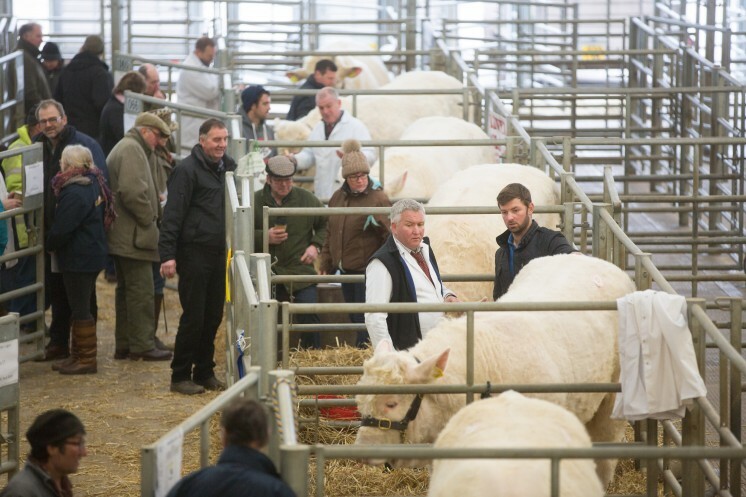 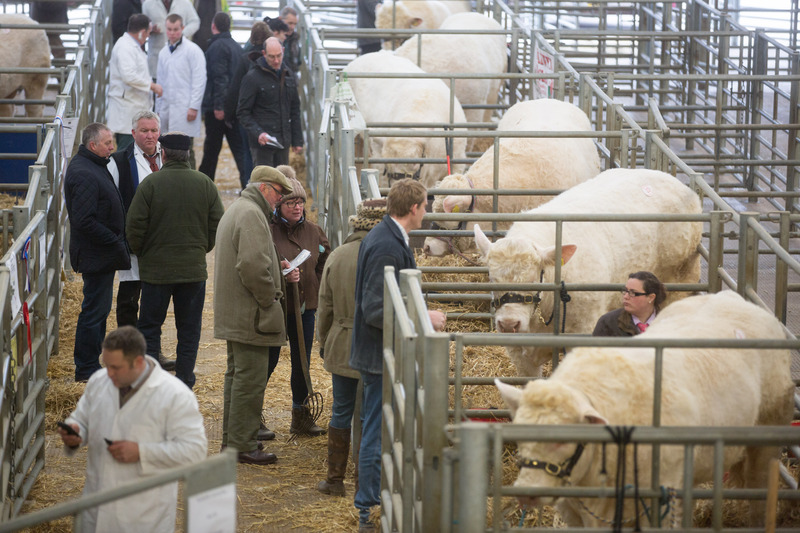 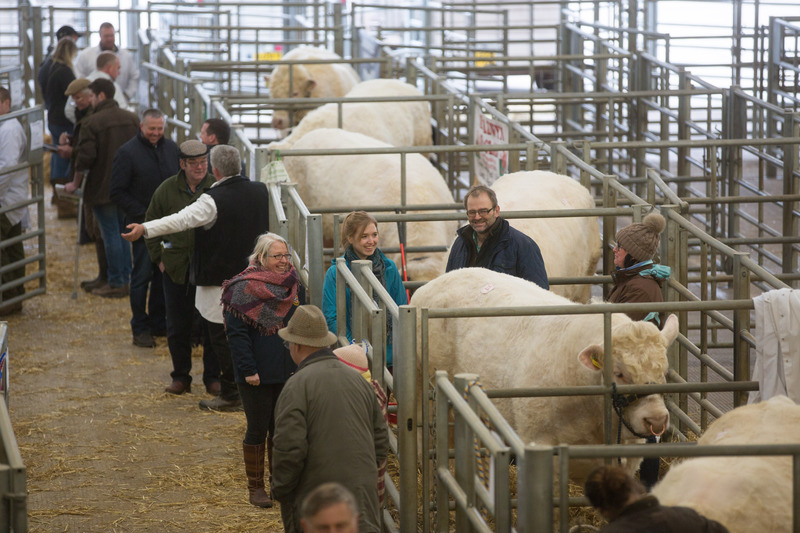 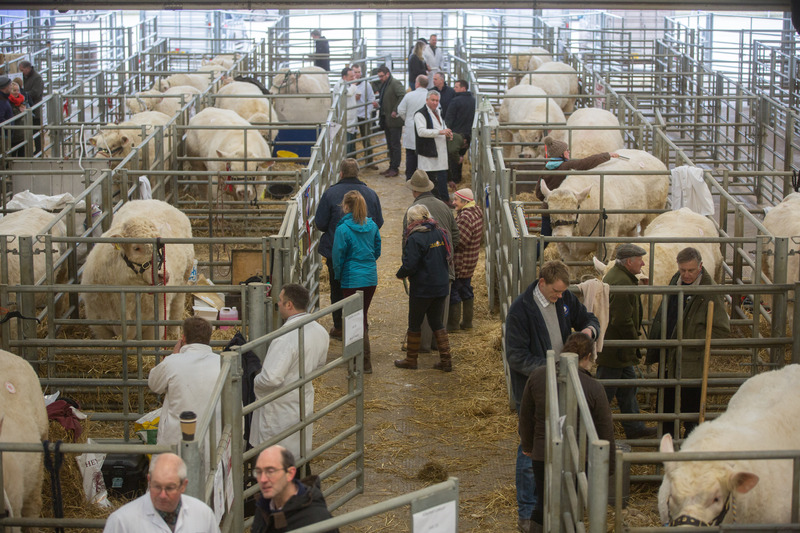 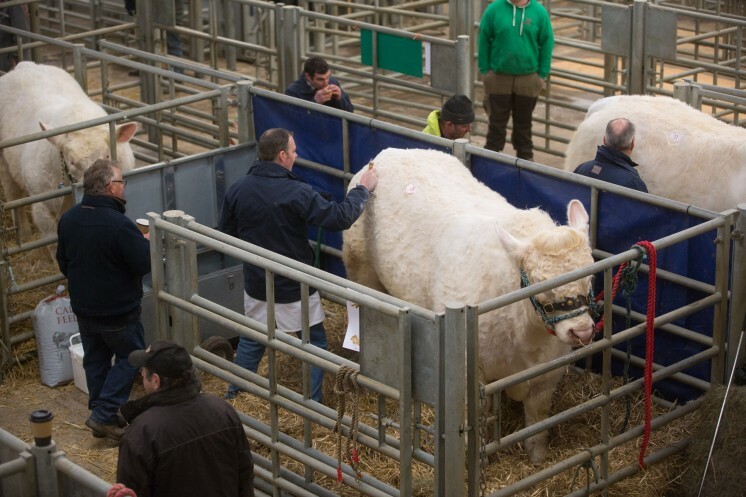 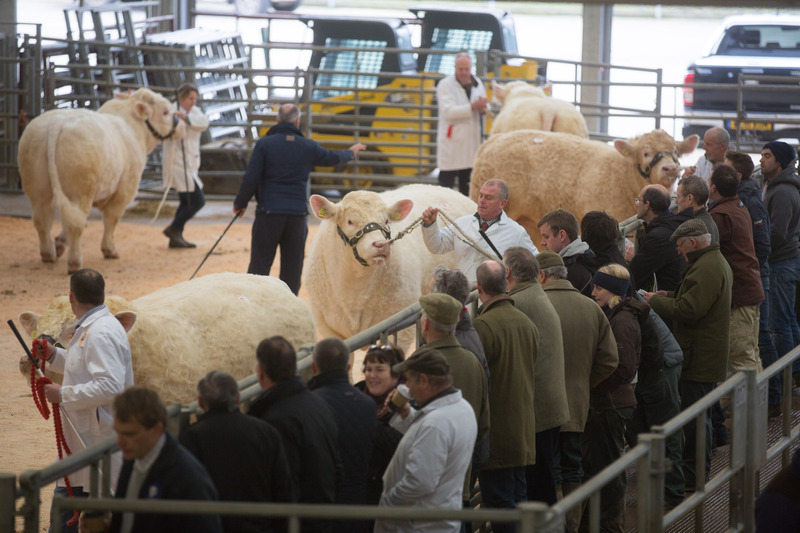 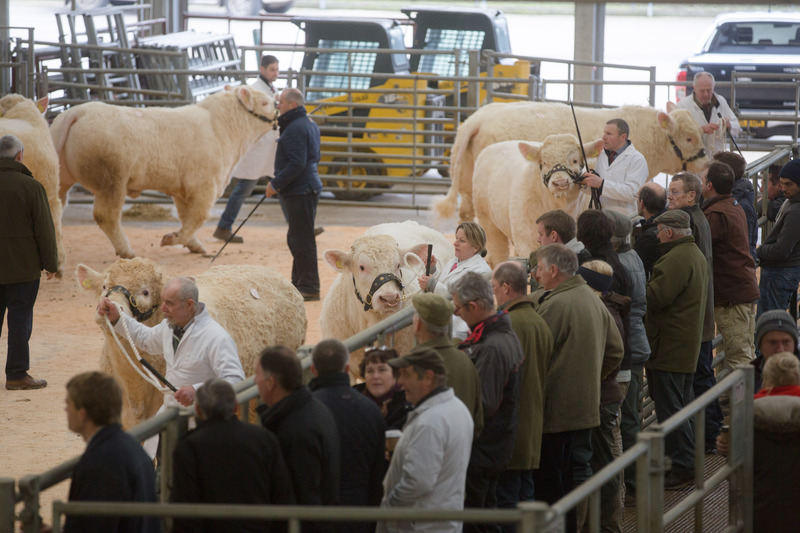 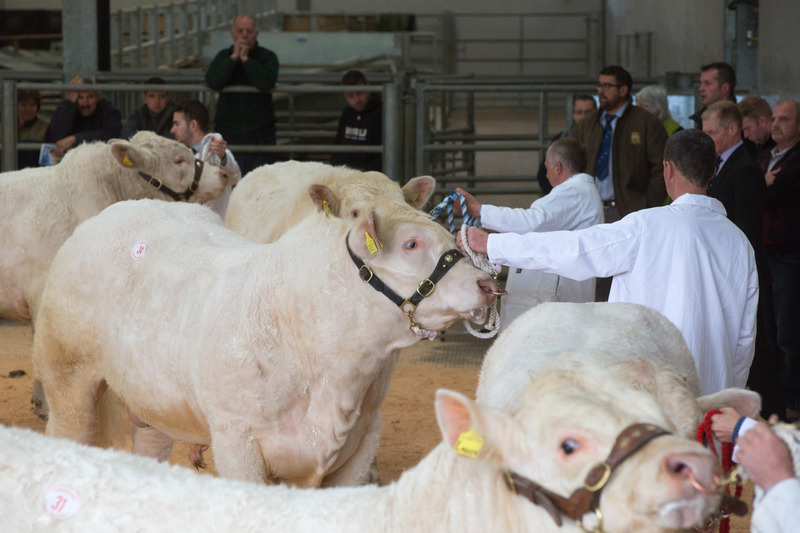 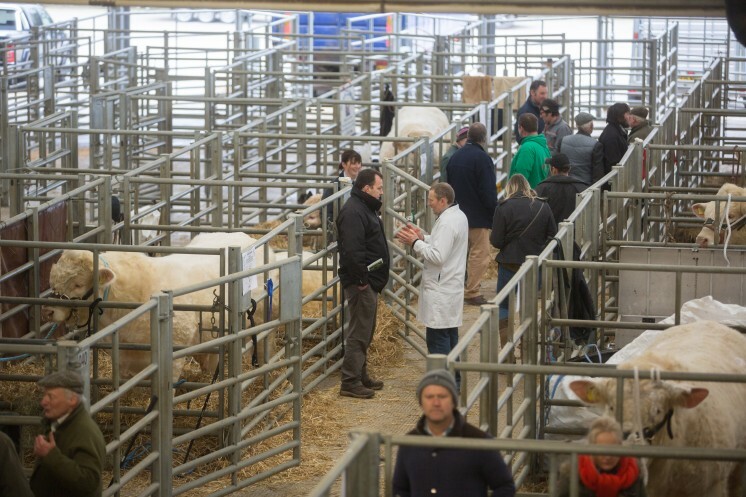 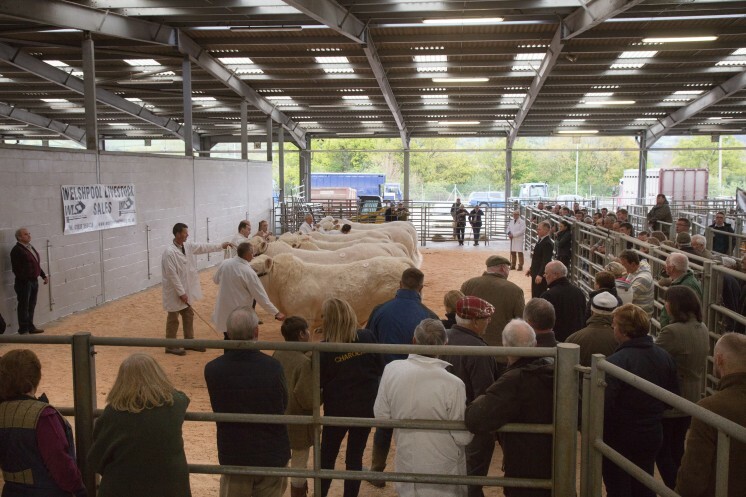 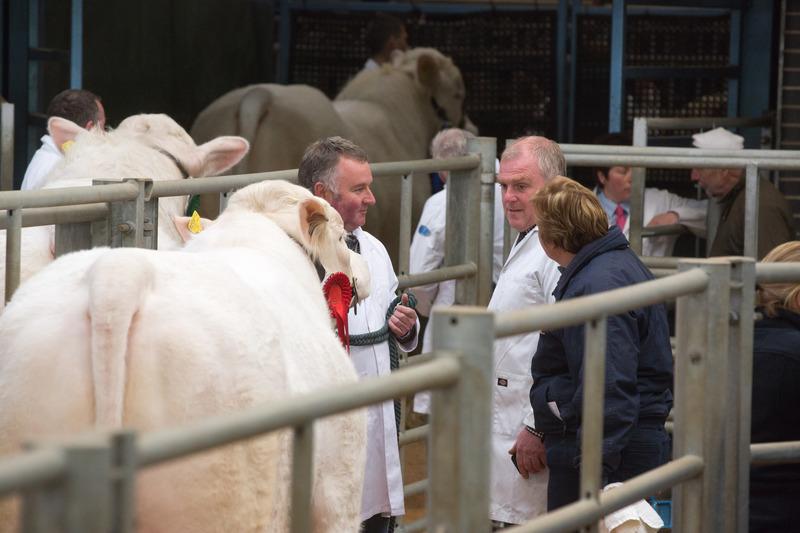 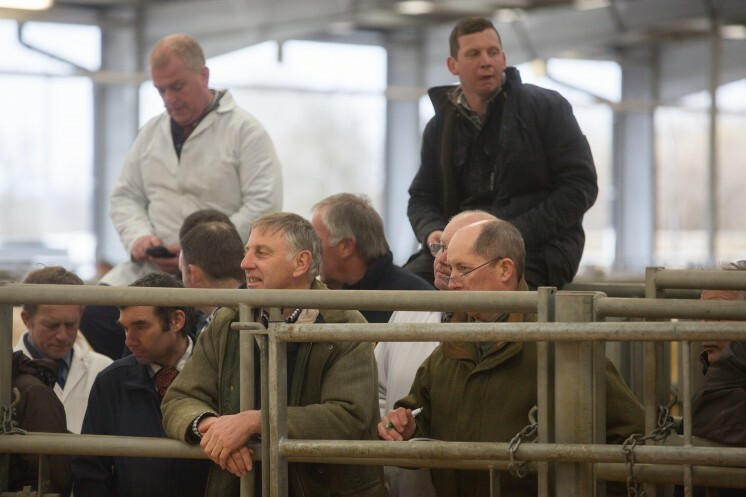 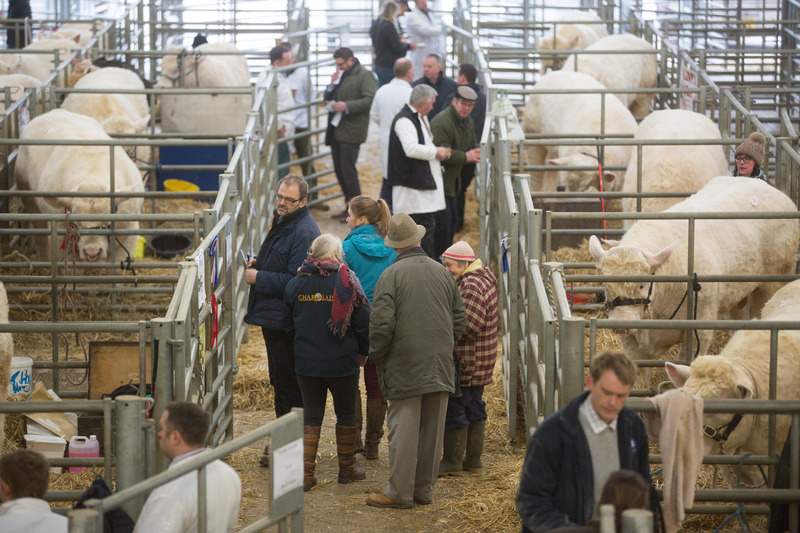 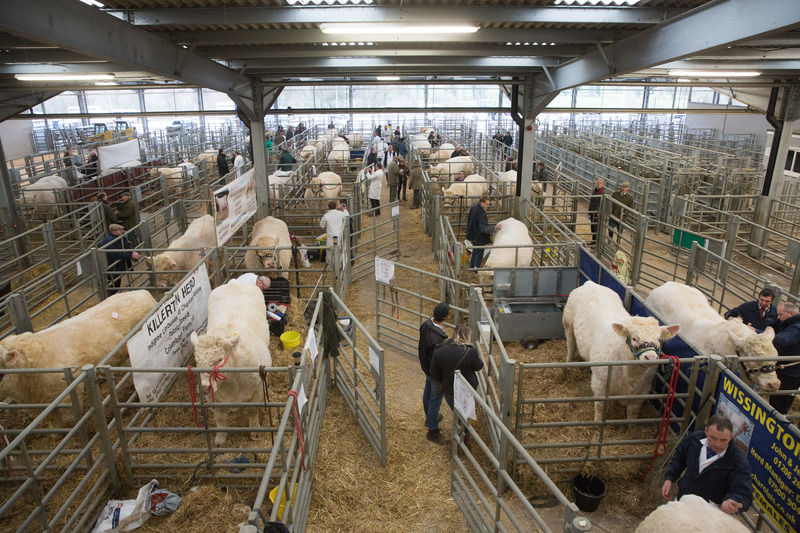 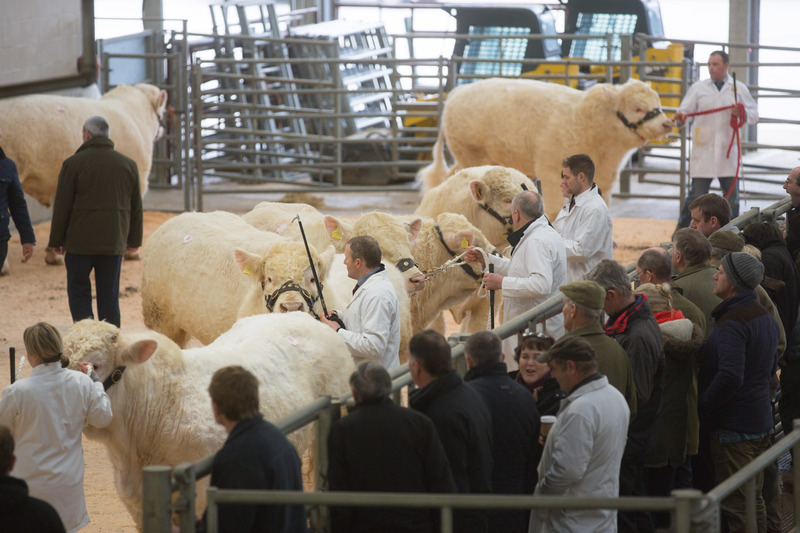 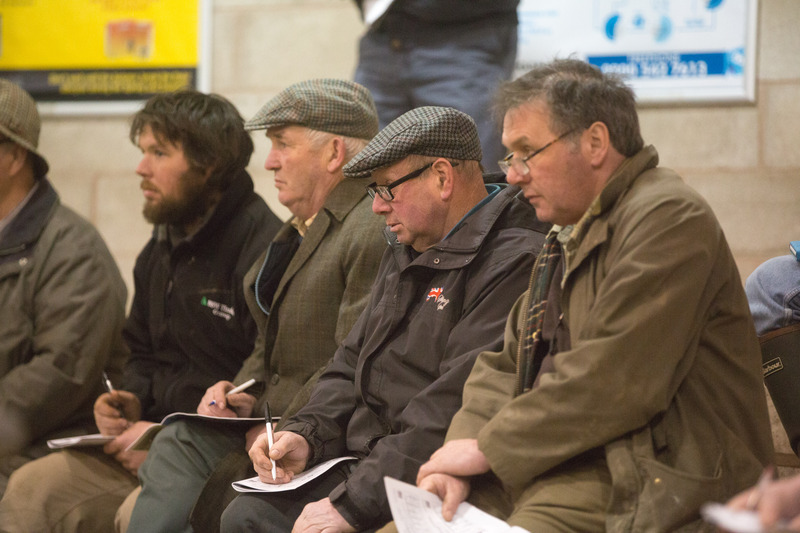 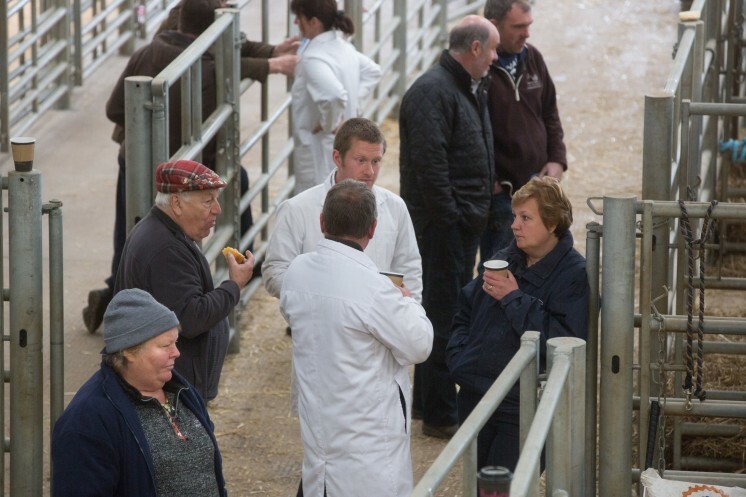 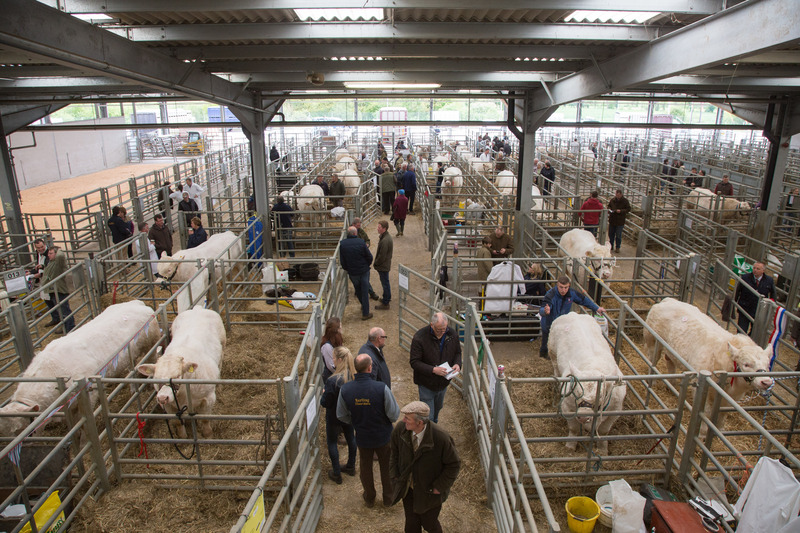 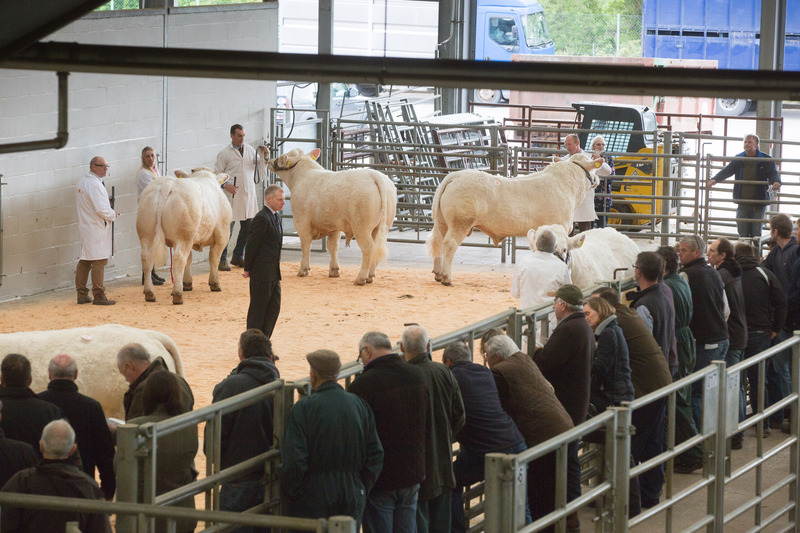 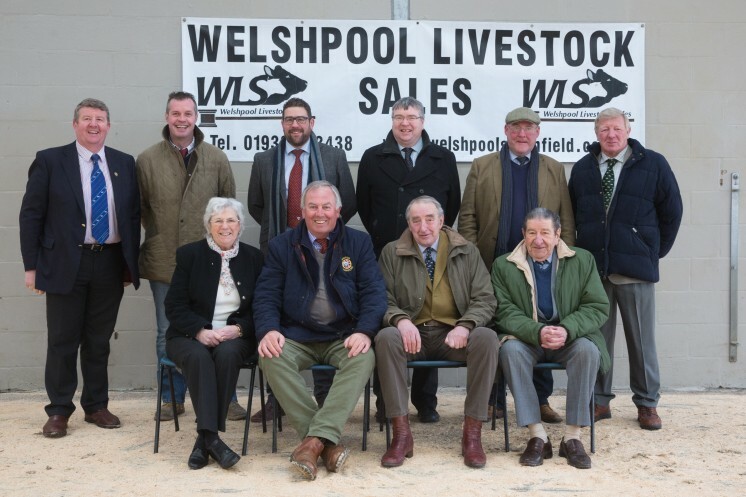 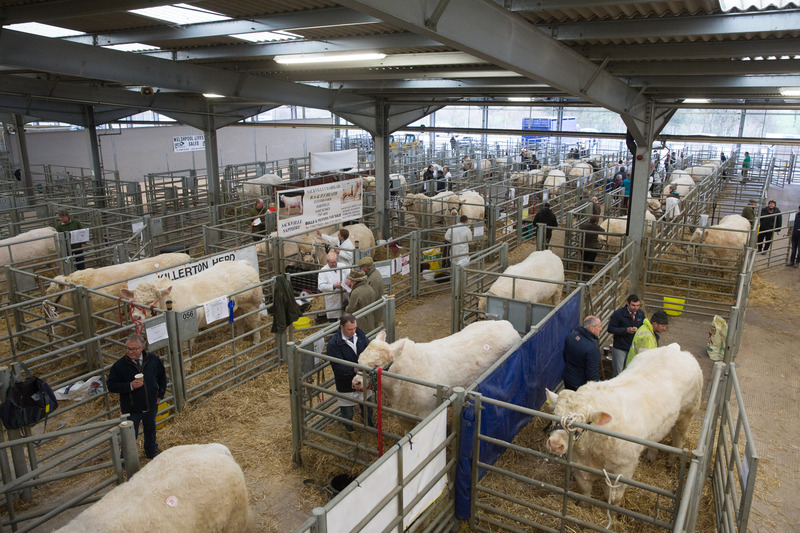 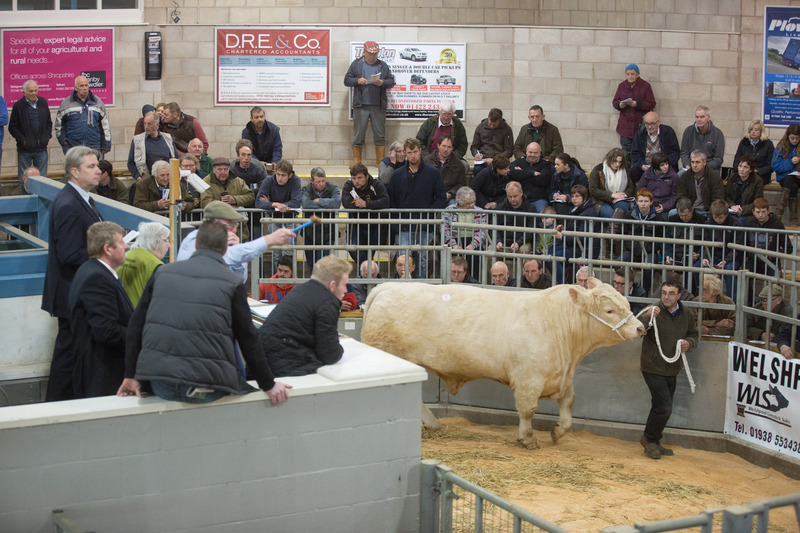 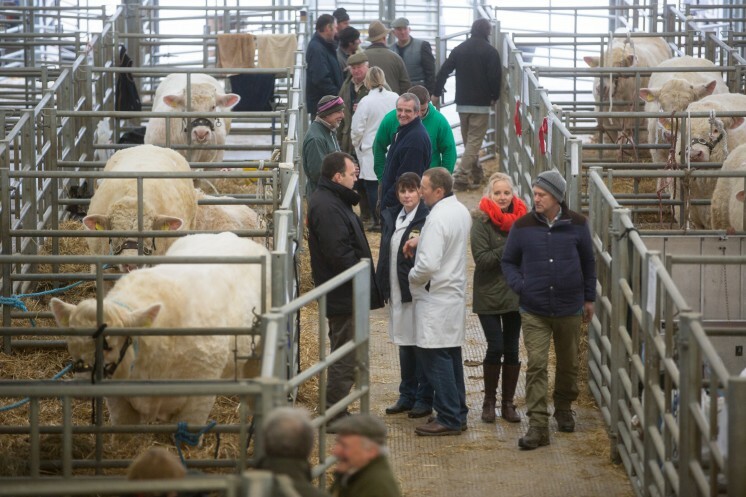 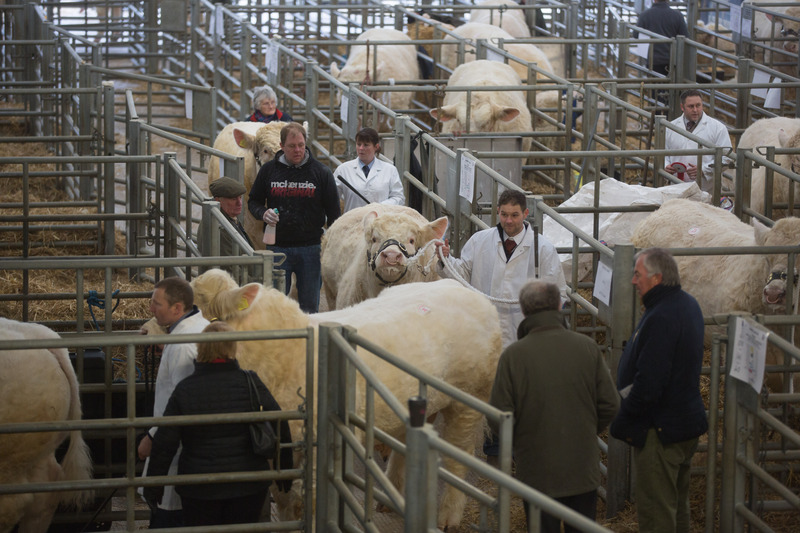 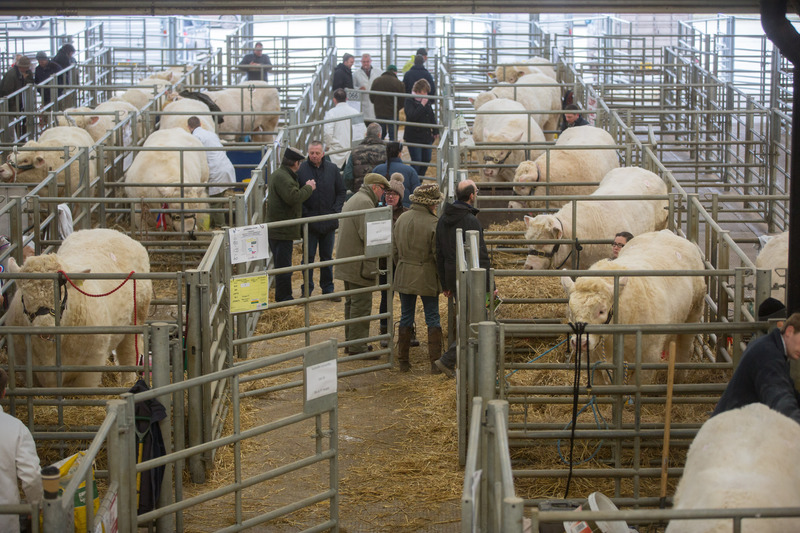 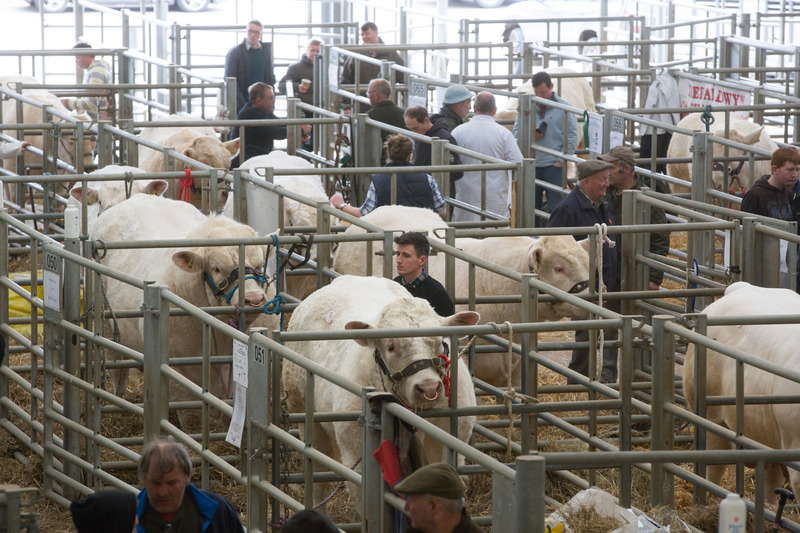 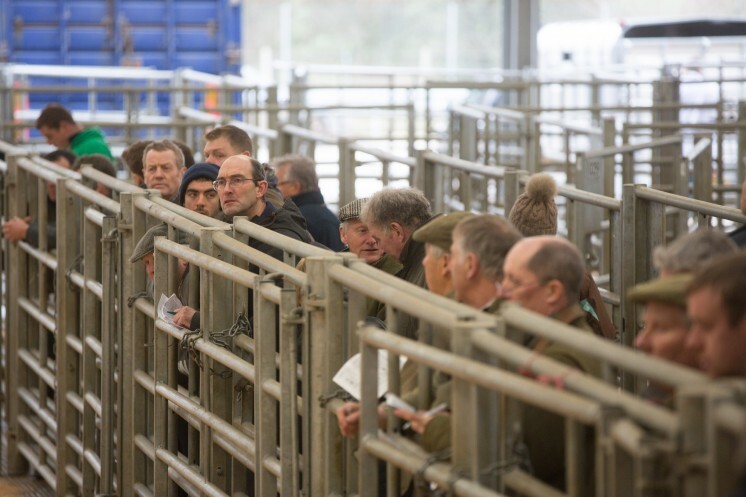 A small but high-quality offering of Charolais bulls saw a top bid of 5,800gns in Welshpool on Thursday 8 February, at the breed’s official spring sale, where 16 bulls sold to an average of £3622.50 and an improvement of 8% on last year’s clearance rate. 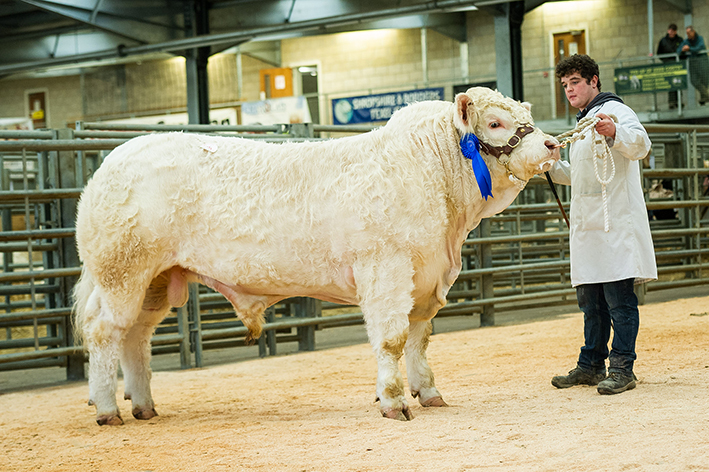 Leading the way at 5,800gns was Gareth Jones’ reserve champion from Cwmtirmynach, Bala. 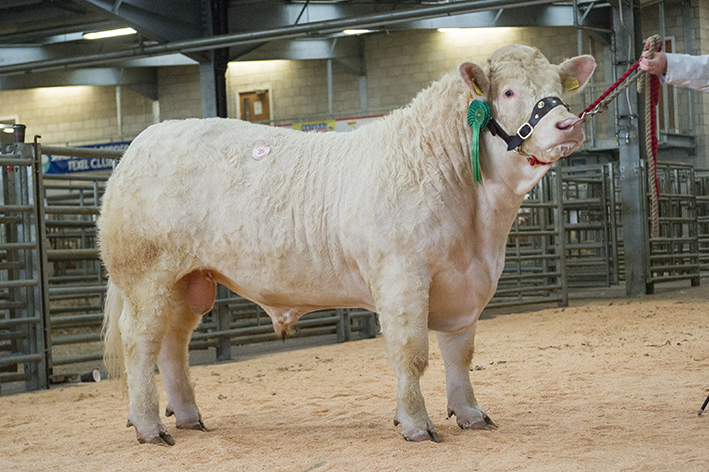 The May-2016 born Esgob Morgan who was snapped up by Edward Bros, Oswestry, Shropshire, is a son of Alwent Goldbar and the 26,000gns Carlisle junior champion Anside Excalibur daughter, Esgob Glain. Next in the trade stakes and purchased at 4,800gns by RW Owen, Garn Solbenmaen, Gwynedd for was Trefaldwyn Magnus, who had been tapped out second in his class at the pre-sale show for breeder and exhibitor Arwel Owen, Welshpool, Powys. 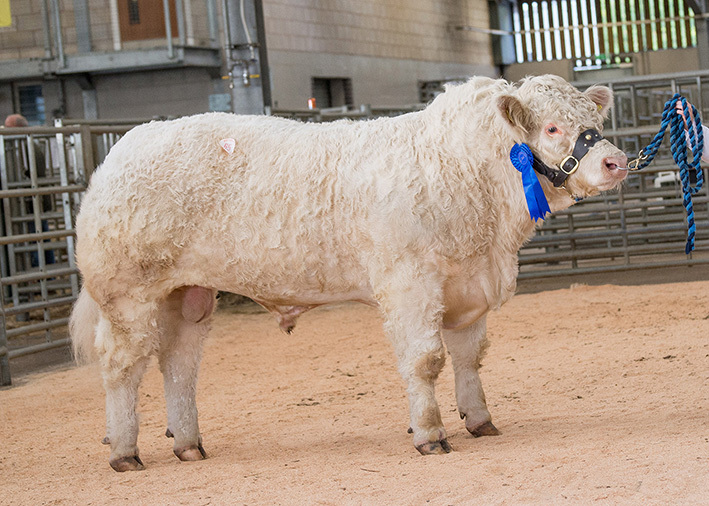 The 17-month-old Magnus boosts an impressive pedigree, being sired by the 28,000gns Perth supreme champion Brampton Nacodar and out of the 11,000gns Royal Welsh Show female champion Trefaldwyn Fancygirl, a daughter of the 30,000gns Dingle Hofmeister. 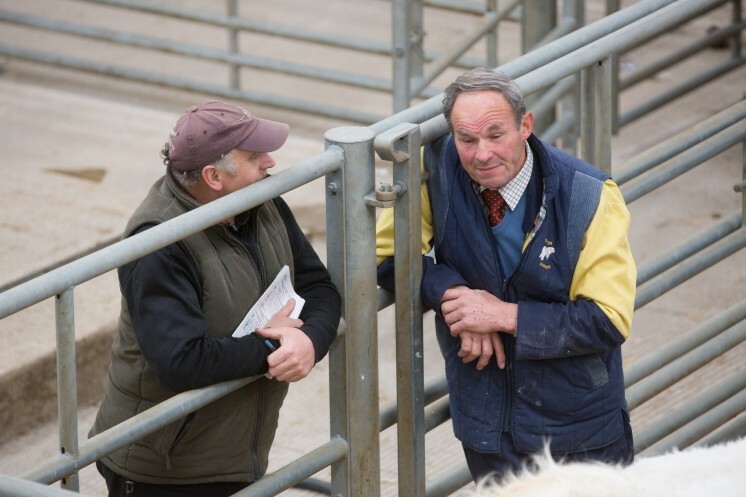 Wesley Forceful son Foxacre Miletus. 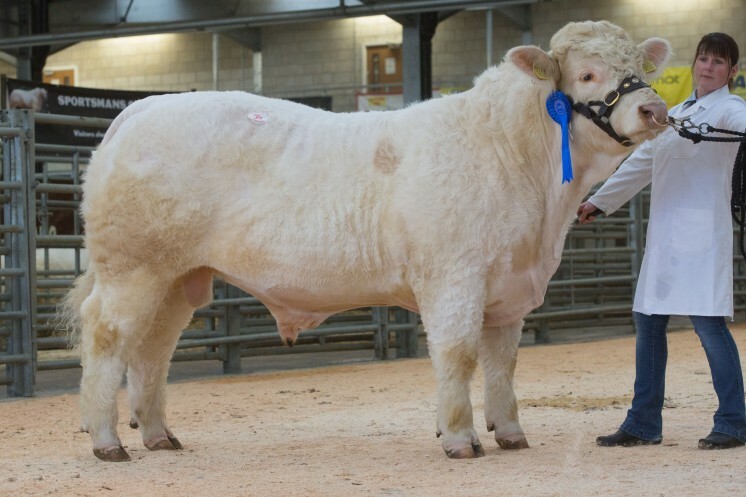 The May-2016 born Miletus is out of the Three Counties reserve junior heifer champion Foxacre Galante and goes home to work in Knighton, Powys for RP Morgan and Son. 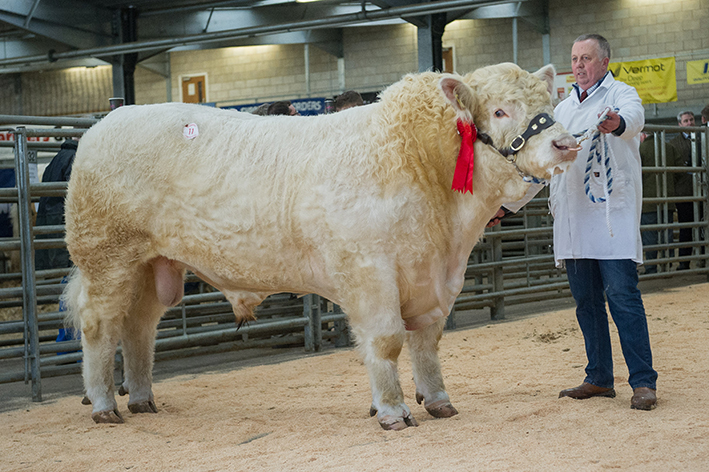 Two bulls sold for 4,500gns apiece and both were offered for sale by the aforementioned Arwel Owen. 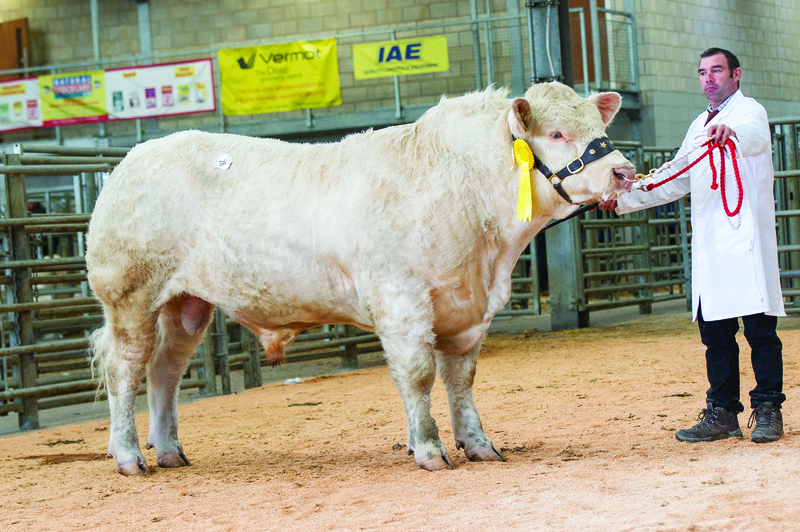 The first, Caenest Morgan who was bred by J and E Evans, Dryffryn Ardudwy, Gwynedd had also been awarded a yellow ticket at the pre-sale show. 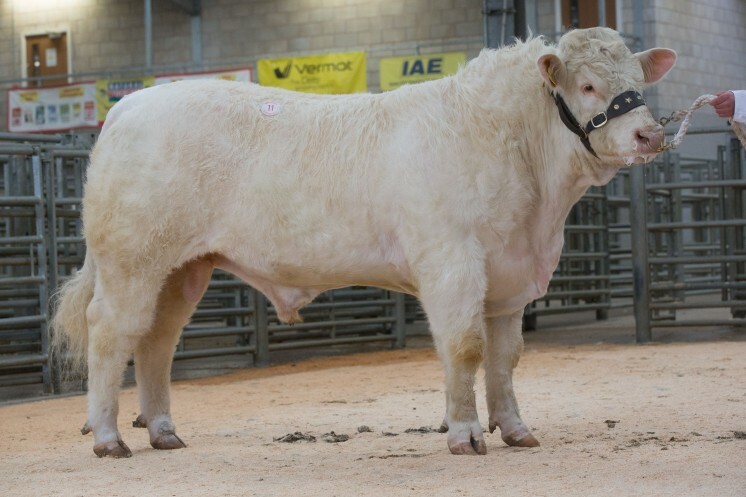 This 14-month-old who caught the eye of TT Jones and Co, Llanbrynmair, Powys, is by the proven high performing, short gestation and easy calving Blelack Digger and out of Trefaldwyn Eternity who in-turn is sired by the 30,000gns Balmyle Bollinger. 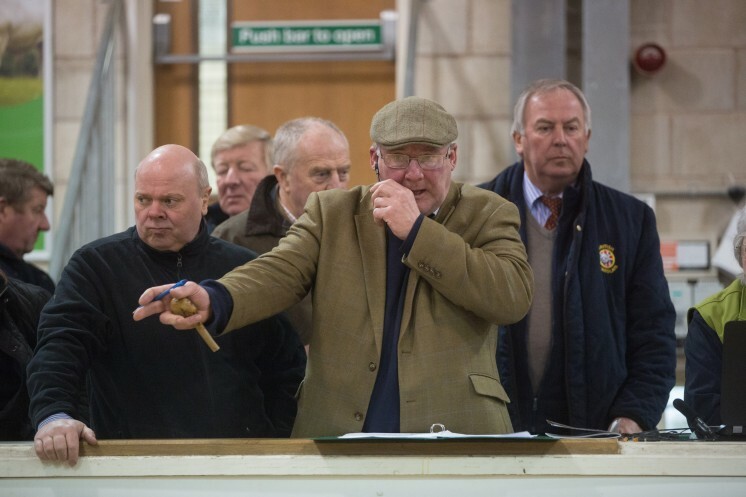 Minutes later Mr Owen’s secured another bid of 4,500gns, this time for the home-bred November-2016 born Trefaldwyn Max who is also sired by Blelack Digger. 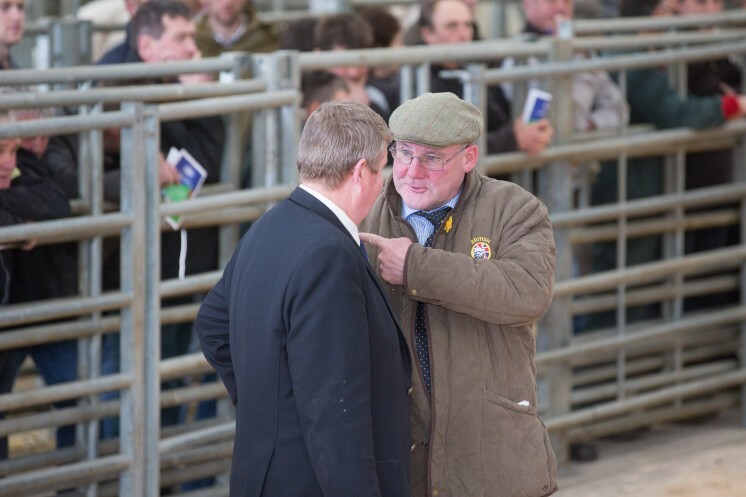 His dam is the Goldies Eddy daughter Trefaldwyn Ice and the NPTC Group, Newtown, Powys were his winning bidders. 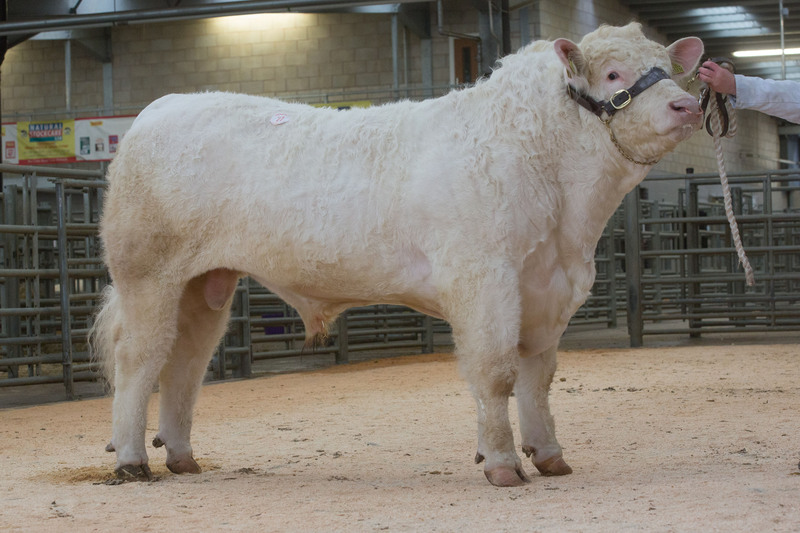 Next, the 22-month-old Montgomery Meic commanded a 3,500gns bid from Gipsy Hall Farms, Wilmcote, Warwickshire. 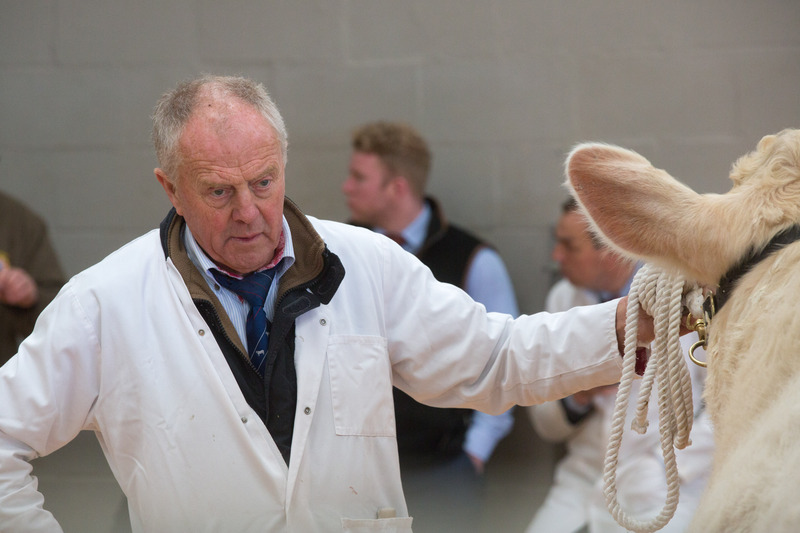 Meic who stood third in his class in the morning’s show is sired by the 9,000gns Balmyle Harlequin, out of the 30,000gns Dingle Hofmeister daughter Montgomery Iarll and was bred and exhibited by Gareth Roberts and Jones, Welshpool, Powys. The next highest priced at 3,200gns was Gwenog Musketeer, consigned by J S & P L Howells, Llanwenog, Dyfed. 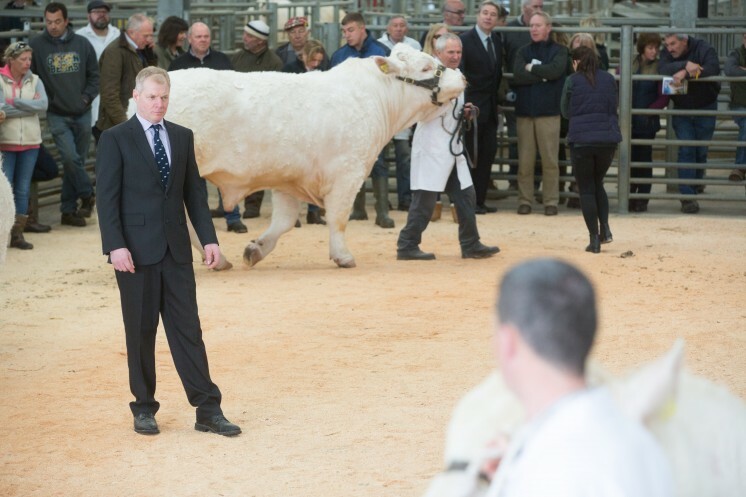 This August-2016 born son of the 12,000gns Royal Welsh supreme champion Thrunton Classic and the 18,000gns Derryharney Outstanding daughter Gwenog Trali went home with TA and ME Jones, Llanbrynmair, Powys. 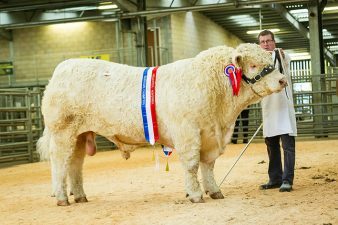 A trio of bulls were knocked down at 3,000gns a piece, with the first coming from Highfields Park Farm, Withyham, Sussex. 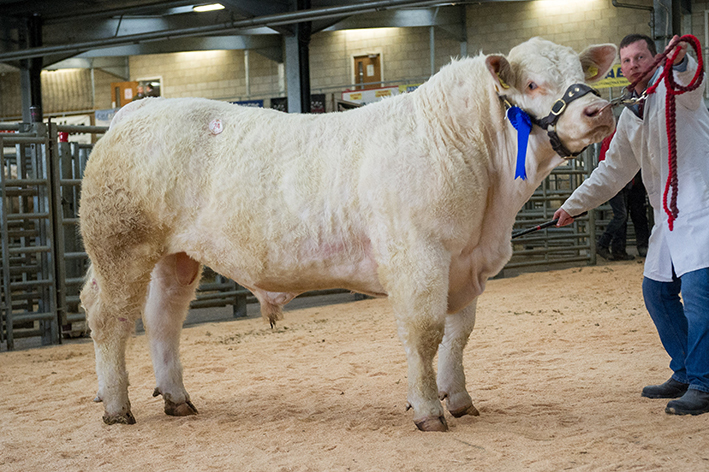 The 20-month-old, blue-ticket winning Chameran Marek who was purchased by WF Palmer and Sons, Truro, Cornwall, is sired by the 12,000gns Cumberland Show champion of champions Sandelford Harrison and out of Edenhurst Fleur – another Dingle Hofmeister daughter. 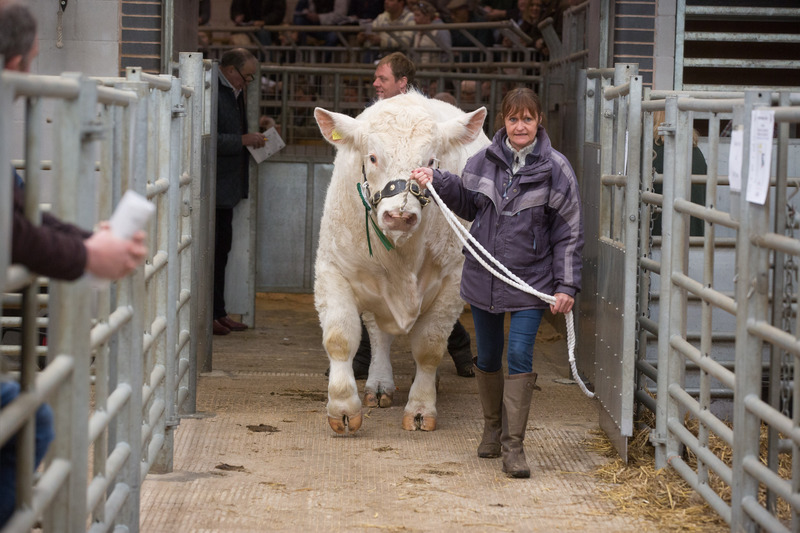 Matching the 3,000gns price tag was the September-2016 born Wissington Mickey. 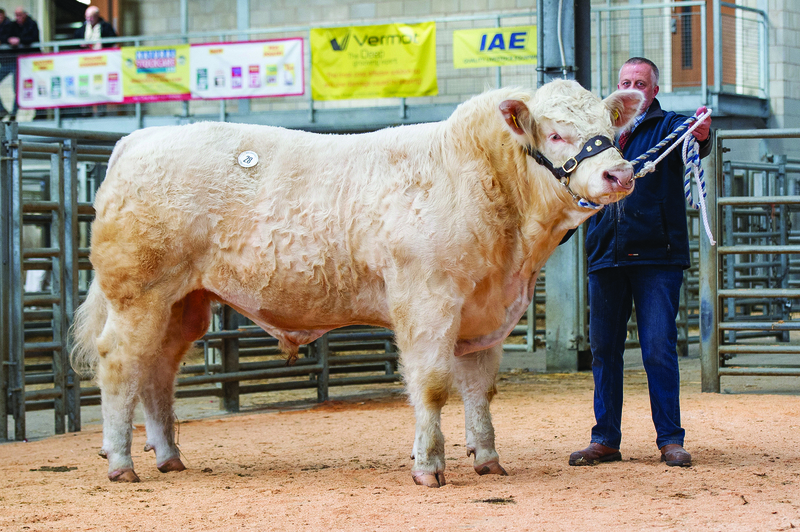 Mickey, an entry from Jenny and John Rix, Nayland, Essex who was exhibited by Darren Knox was purchased by DWR Reynolds and Son, Knighton, Powys, is by the aforementioned Blelack Digger and out of the home-bred Gretnahouse Ferdinand-sired Wissington Jolly. Also hitting the 3,000gns price tag was Esmor Evans’ 14-month-old Maerdy Mario from Mold, Flintshire. 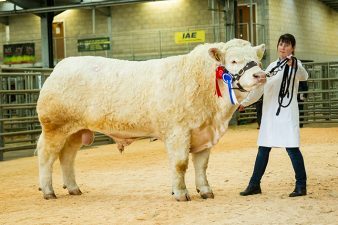 Maerdy Gwlan is out of French-bred Begonia daughter Maerdy Poem and sired by the 10,000gns Stirling reserve senior champion Blelack Fabulous. The Williams’ of Holt, were the successful bidder and take him home to their Wrexham-based unit. 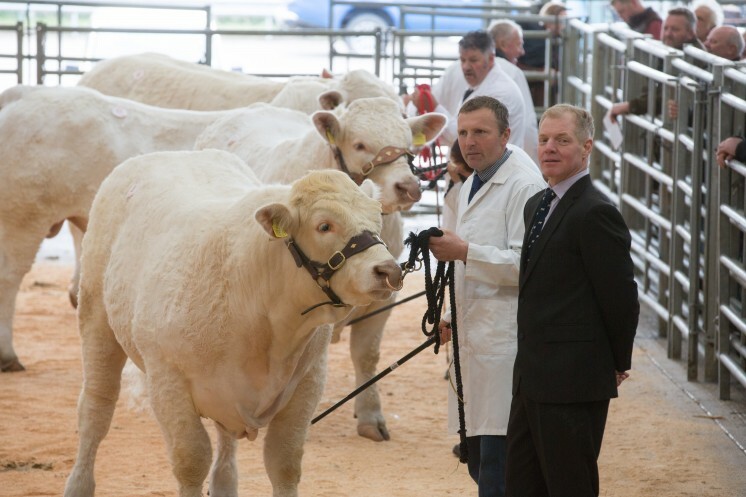 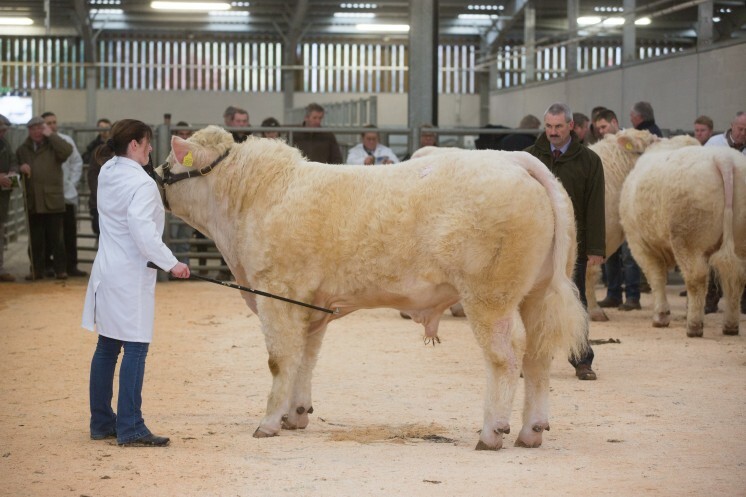 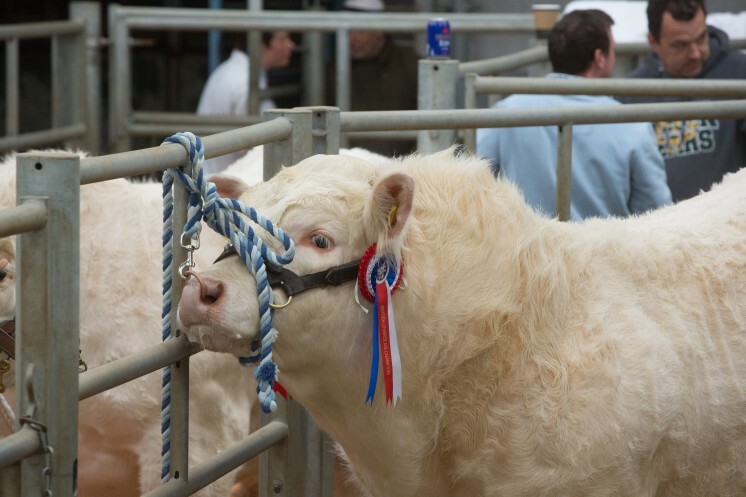 The only female of the sale was a 2-year-old entry from Mr R J Butler, Rudford, Gloucestershire. Commanding a bid of 2,100gns from C Wardle, Sandbach, Cheshire was the 15,000gns Carlisle supreme champion Burradon Talisman daughter Carrigbeg Ladyjane who sells served to Davally Illusion. 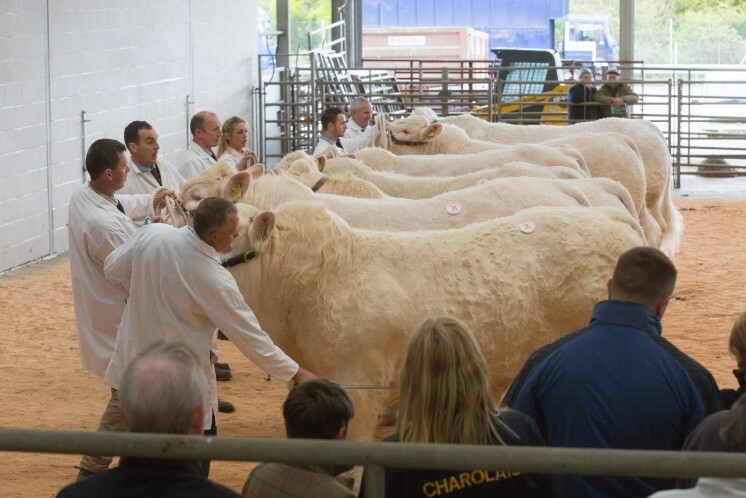 A combination of pedigree and commercial interest saw a flying trade of Charolais bulls at Welshpool on Thursday 9 November. 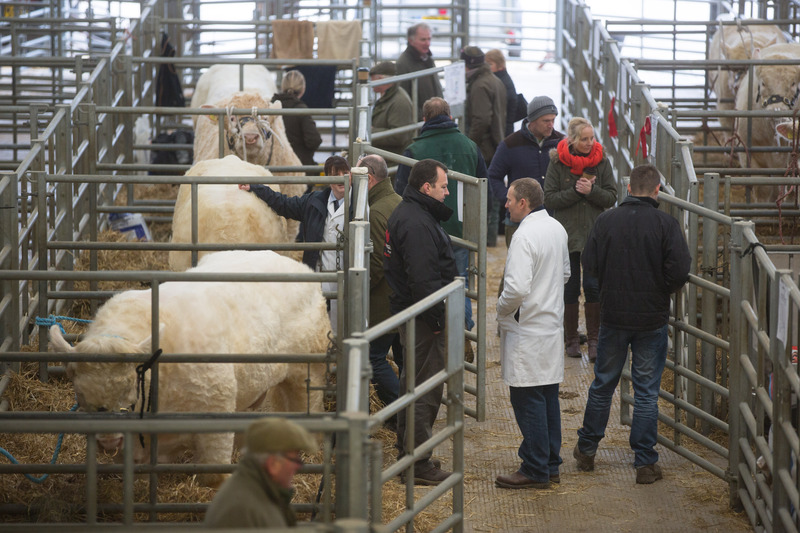 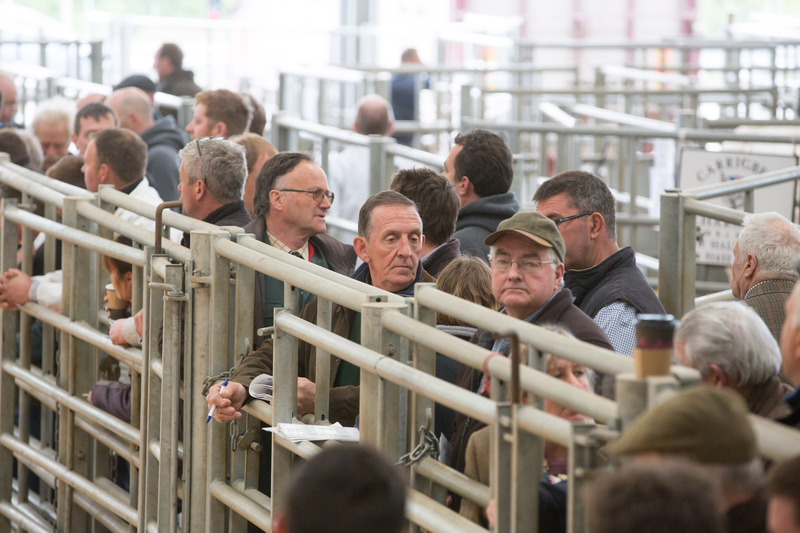 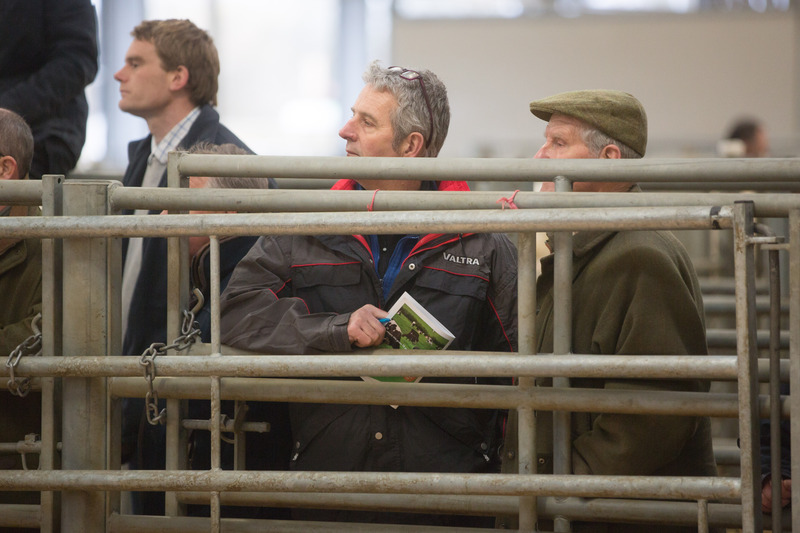 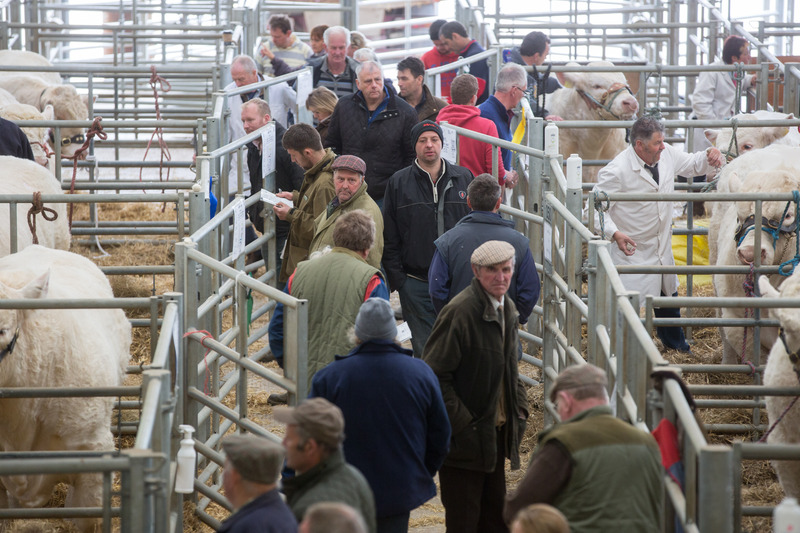 Bidding peaked at 7,200gns, while 13 lots traded at 5,000gns and above. 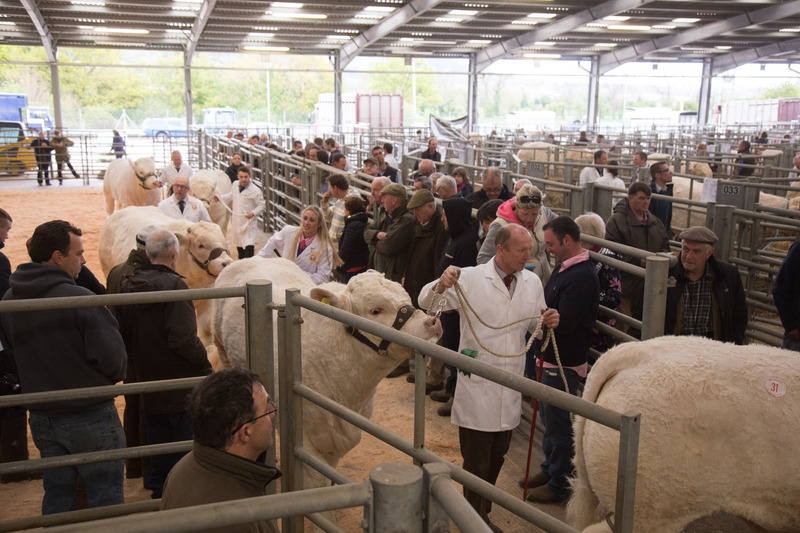 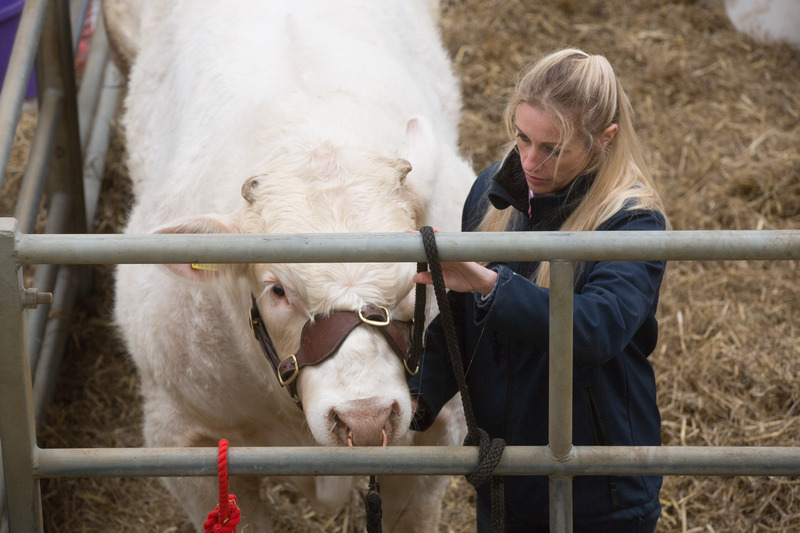 The 43 bulls sold averaged £4444.19, an increase on last year of £588 and clearance rates were also up on the year by an incredible 31% to 84%, proving that the demand for Charolais bulls is on the rise. 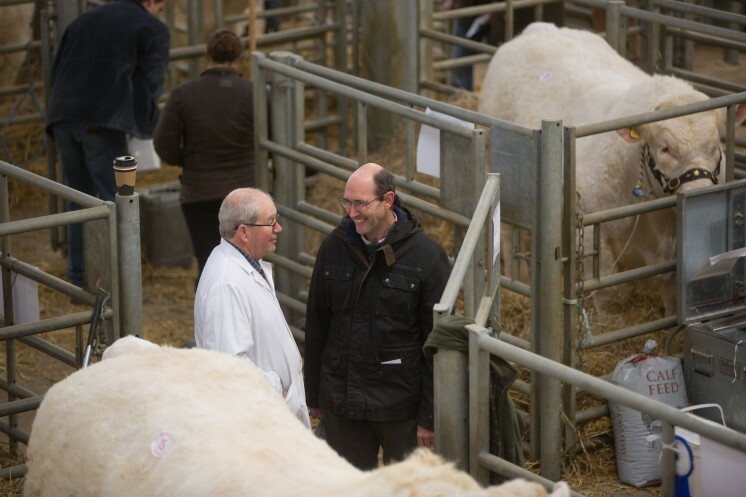 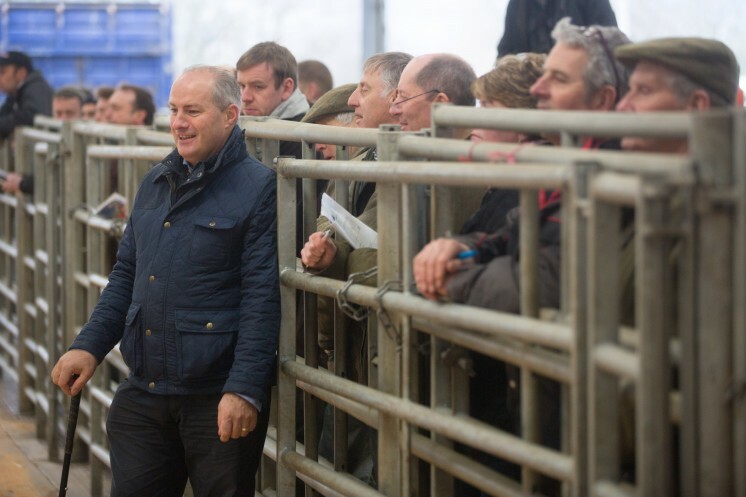 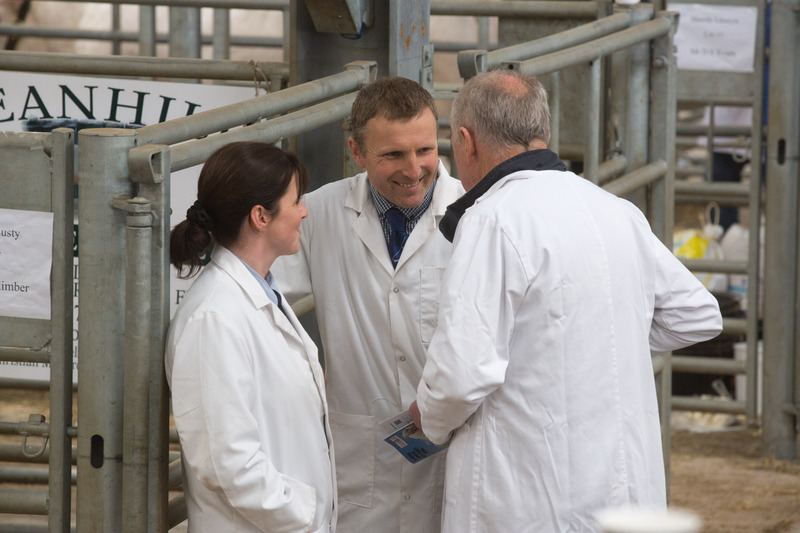 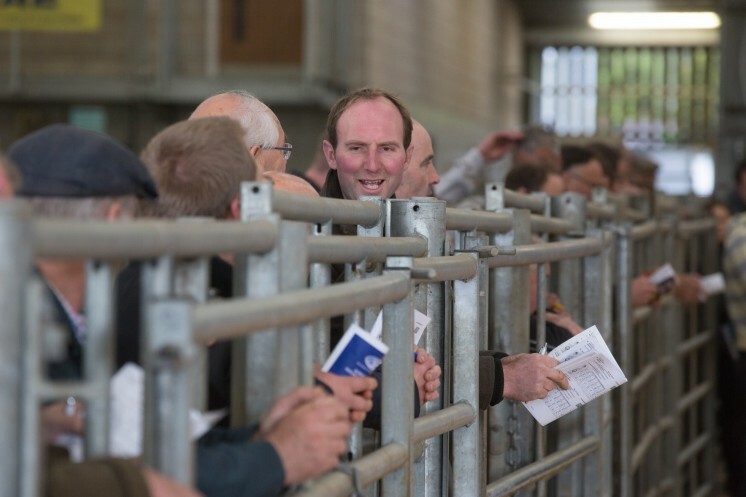 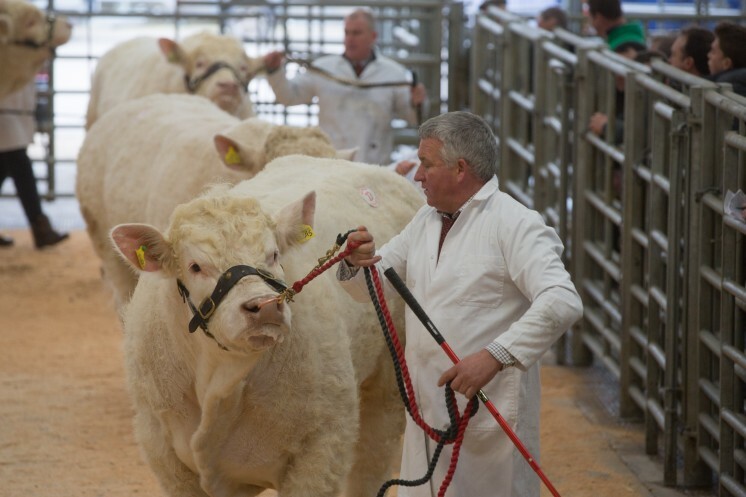 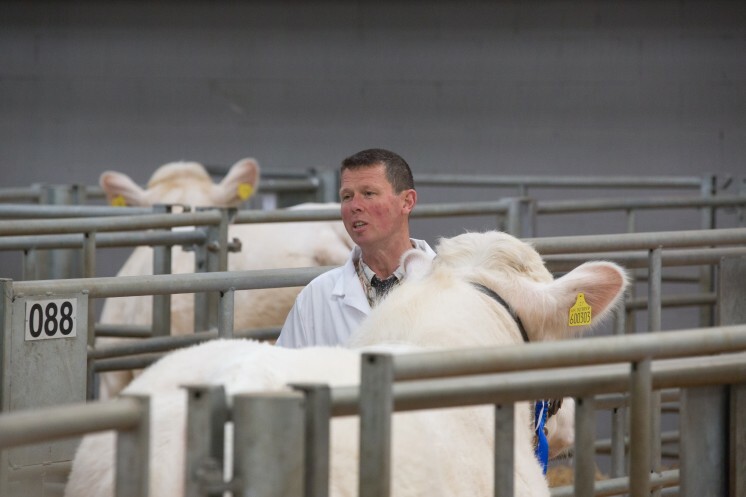 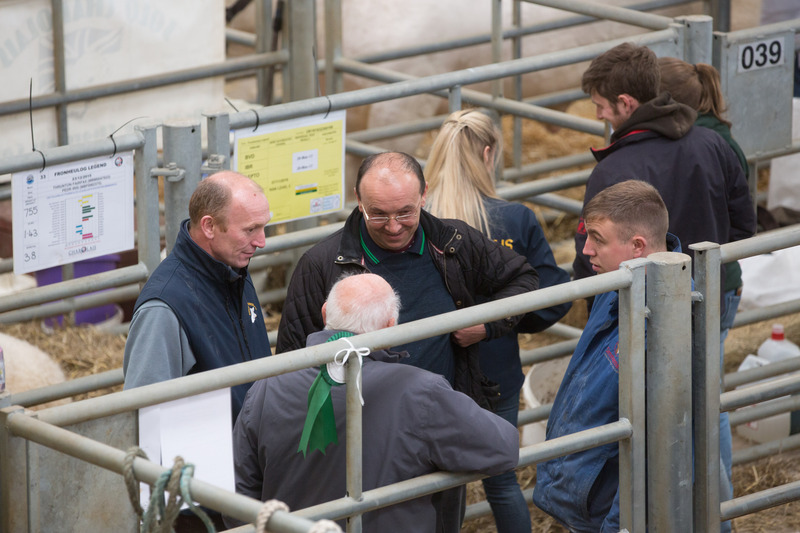 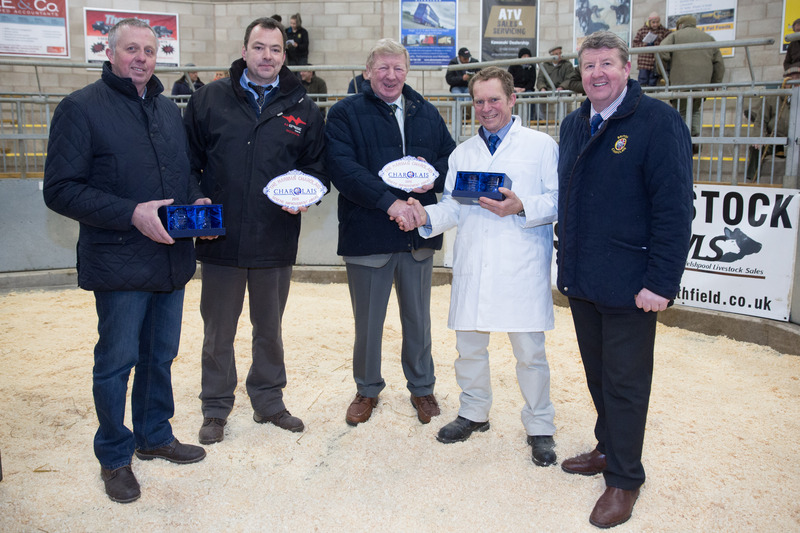 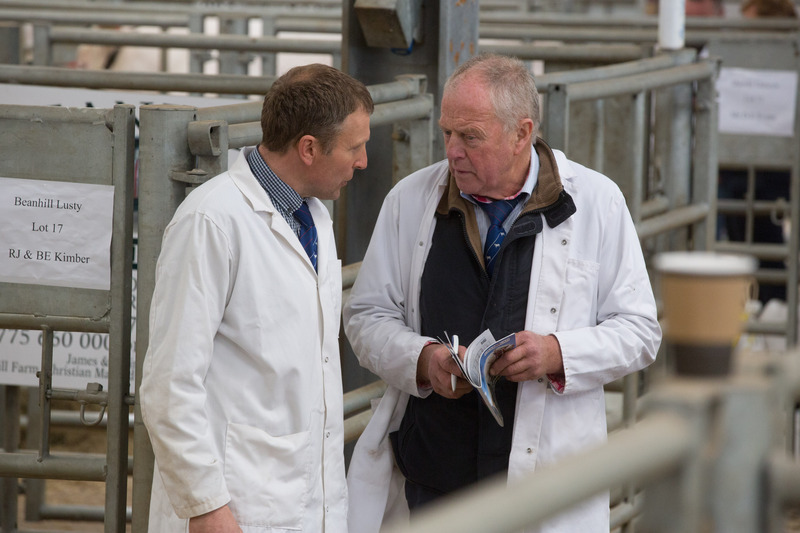 Society CEO Peter Phythian commented, “We are delighted that Charolais trade is going from strength to strength, with every Society sale this year improving on numbers sold and average prices. The commercial producers were out in force today looking to secure a Charolais bull so that they can capitalise on the recent trend in the store markets where Charolais sired suckler calves are topping the markets on weight for age”. 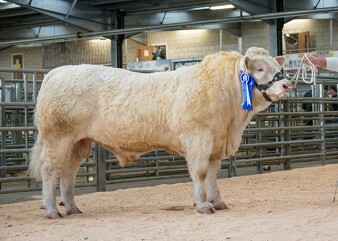 The sale leader at 7,200gns was the reserve champion Cliftonpark Madoc from Mrs JM Robinson, Tenbury Wells, Worcestershire. The March-2016-born Madoc is sired by the French bred Rosanna Fameux and out of the homebred dam Cliftonpark Irish, who goes back to the 10,000gns Carlisle reserve senior champion Thrunton Bravado. 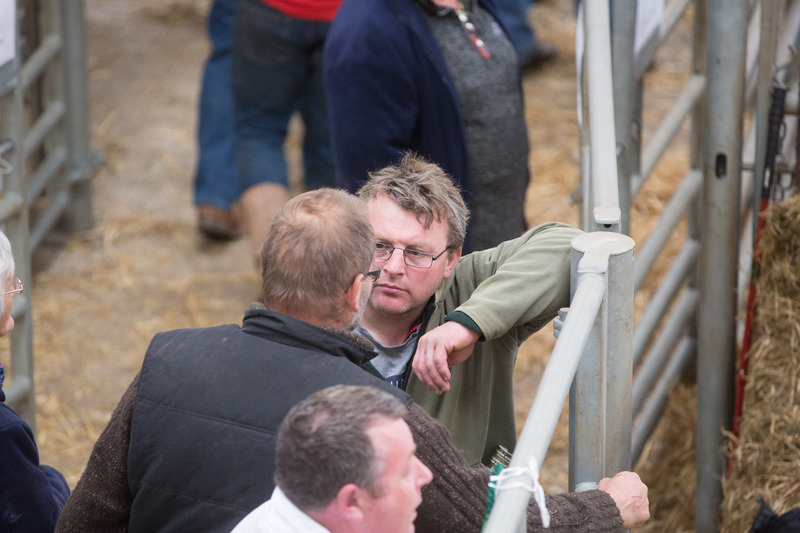 He was purchased by Messrs P and M Davies, Sennybridge, Powys. 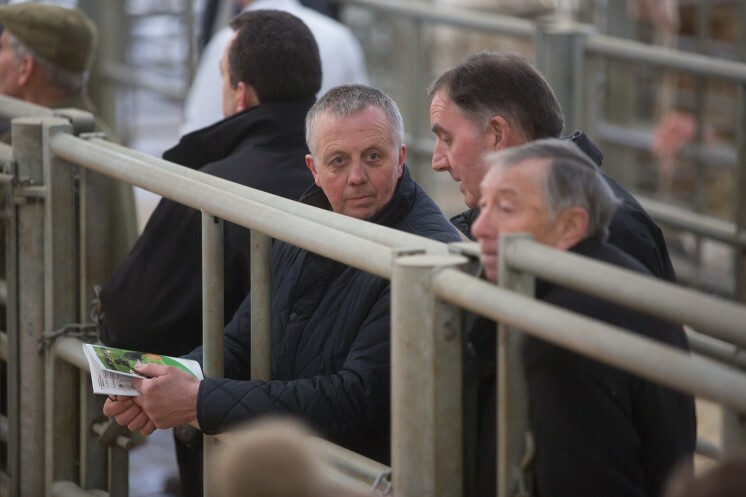 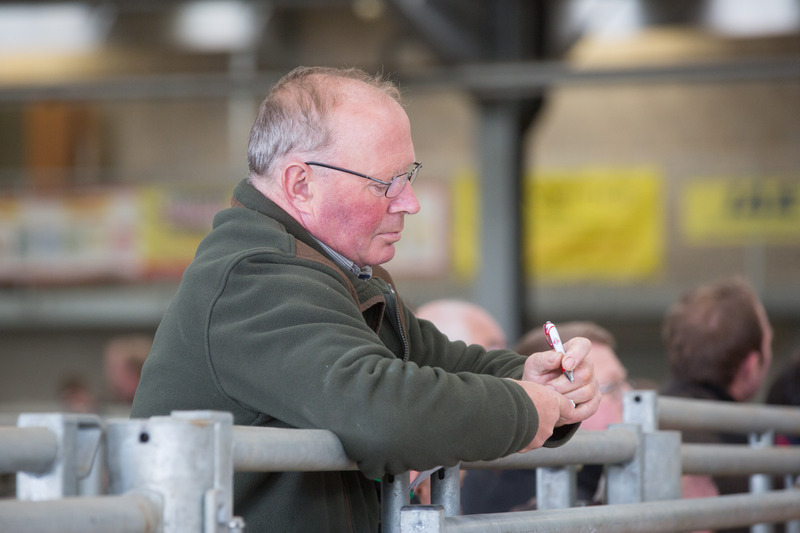 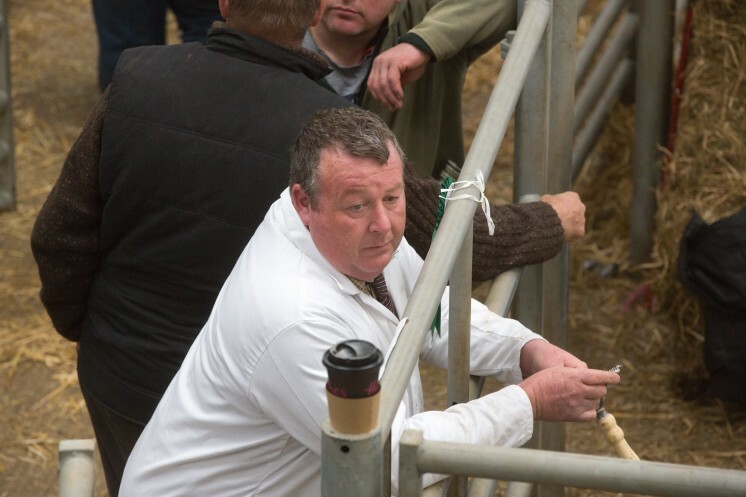 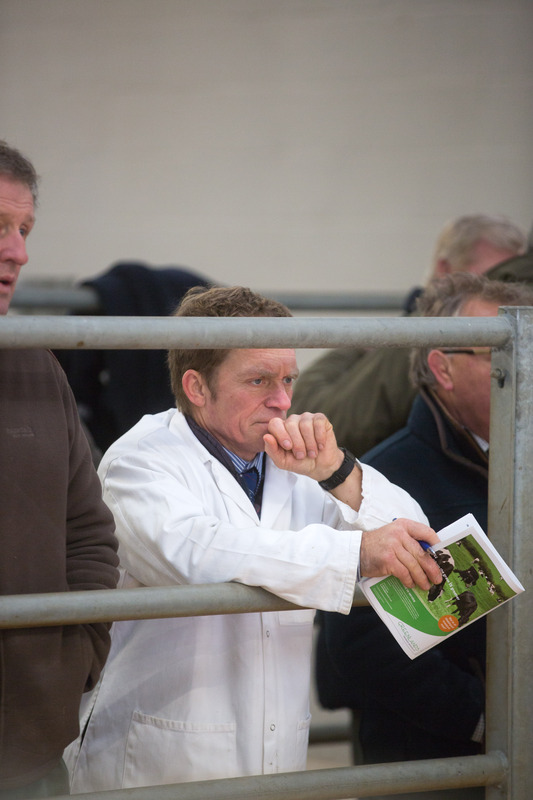 Close behind at 7,000gns and the first of three to sell for breeder and exhibitor Kevin Thomas, Capel Iwan, Dyfed – whose sales averaged £6,300 – was the 18-month-old Moelfre Maestro. Maestro who was purchased by E Jones, Caernarfon, Gwynedd, is the first bull to sell by the 12,500gns Balmyle Impression, whose daughters have been retained, while the dam is the Gretnahouse Vigorous-sired Moelfre Dollar. Also in the money for Mr Thomas was the yellow-ticket winner and April-2016-born Moelfre Major. 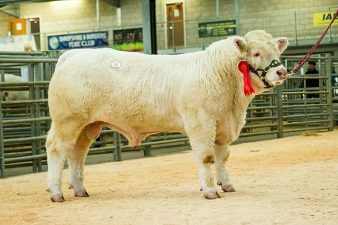 Another son of herd sire Impression, this time out of Moelfre Ianna who in-turn is sired by the 16,000gns Royal Welsh show reserve male champion Anside Foreman, he was purchased by B Bayliss and Co, Whitney-on-Wye, Herefordshire for 6,400gns. 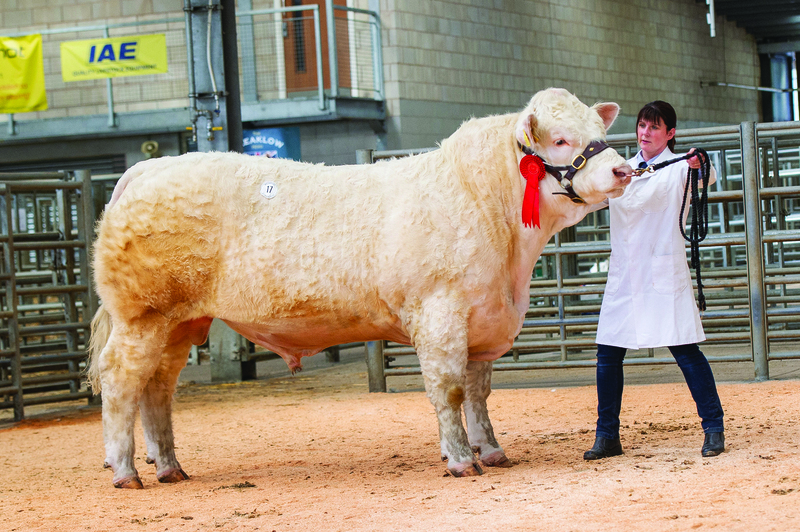 Securing 6,800gns was the April-2016-born Esgob Magnumgold, who was one of three bulls to top his class in the pre-sale show, for breeder and consigner Gareth Jones, Bala, Gwynedd, who went on to sell all three for an average price of £6,055. 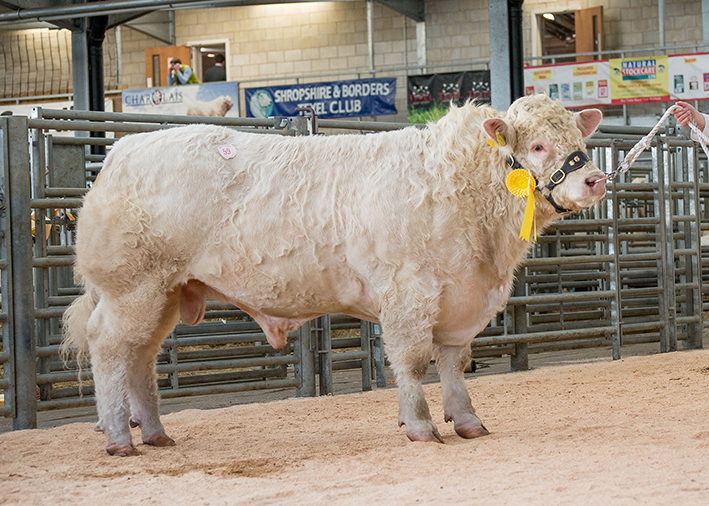 Staying local when snapped up by J Roberts, Bala, Gwynedd, Magnumgold is sired by Alwent Goldbar and his dam Esgob Gold is a former Royal Welsh Show junior female champion by the 26,000gns Carlisle reserve supreme champion Anside Excalibur. 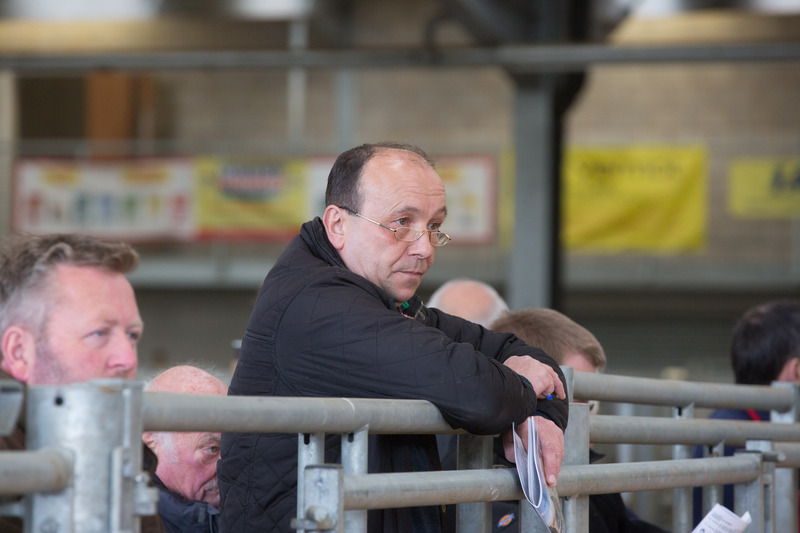 Mr Jones next highest priced offering was the red-ticket-winning Esgob Mint, who is out of another Anside Excalibur daughter, Esgob Impulse and sired by Goldies Eddy. IW Roberts, Dolwyddelan, Conwy was the purchaser of this 17-month-old at 5,500gns. 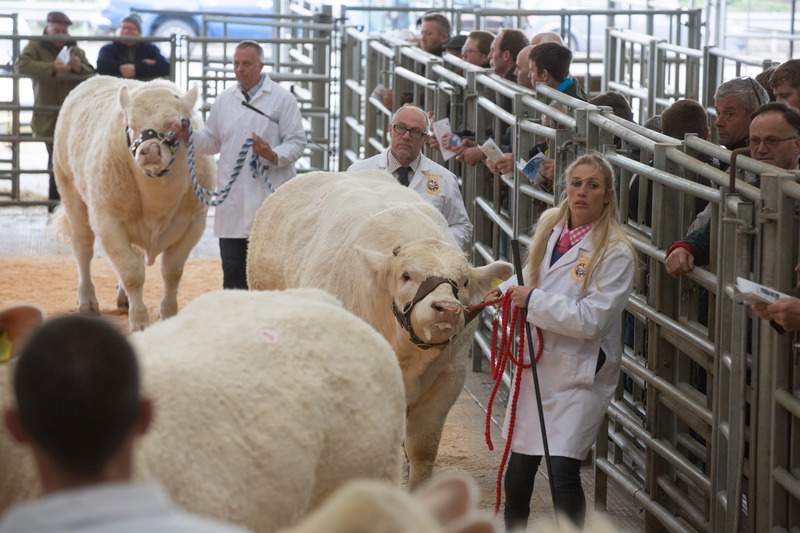 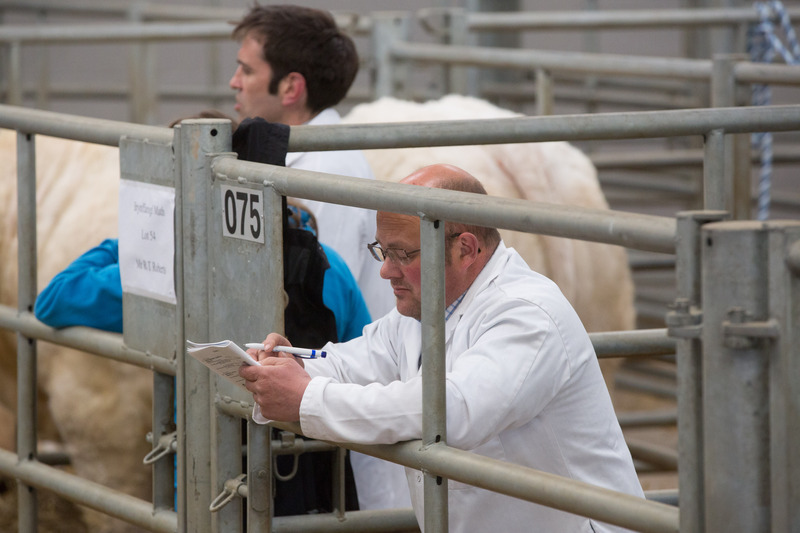 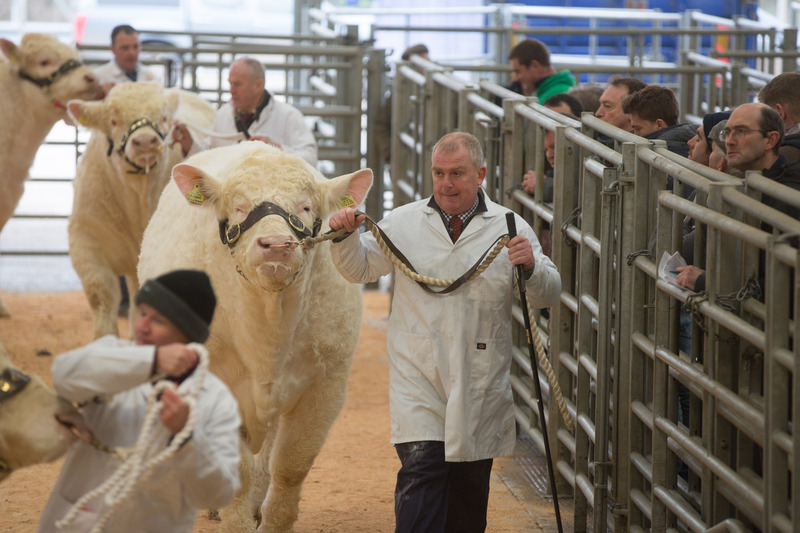 Four bulls were knocked down at 6,000gns a piece, with the first coming from JAW Rees, Llanidloes, Powys. 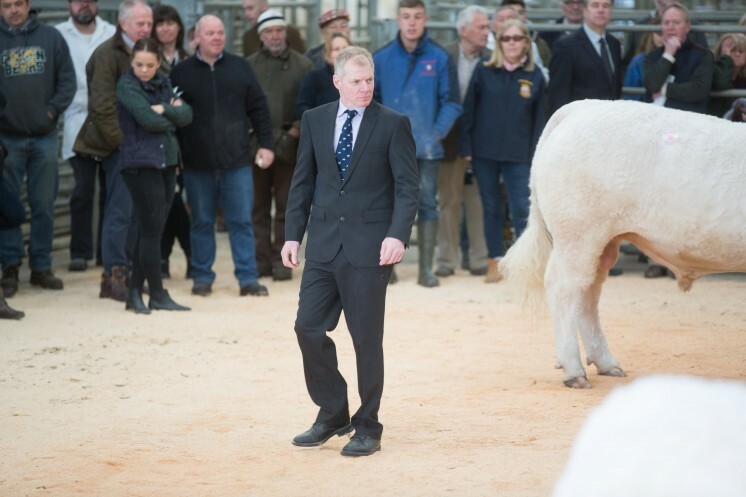 TJ and DA Stephens, Neath, West Glamorgan, were the last men in on the March-2016-born Hendy Majestic, who is sired by Tullygarley Rollerball and out of Hendy Topsy who goes back to Balthayock Matthew. 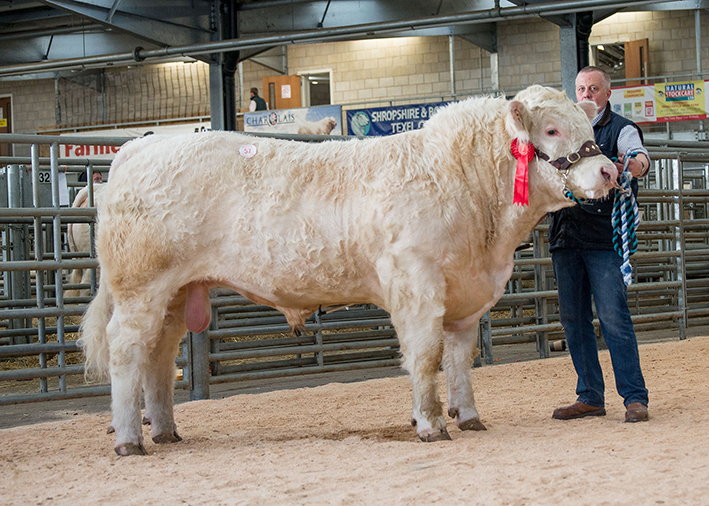 Another to bring 6,000gns when chapped down to TN Lightfoot, Callington, Cornwall, was Peter and Sheelagh Donger’s supreme champion Seawell Merlo. The 19-month-old Merlo is a son of the French bred Maerdy Flambeau and Seawell Creative who in-turn is sired by the renowned Irish AI bull Doonally New. 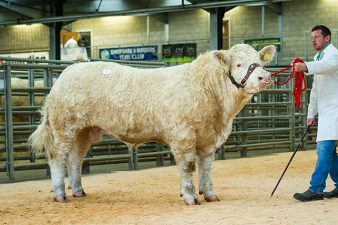 Also selling for a 6,000gns ticket price was the April-2016-born Maerdy Myfanwy who was snapped up by DT Edwards and Co, Trecastle, Powys. The breeding here includes sire the French bred Maerdy Gouverneur and dam Maerdy Glorious, a daughter of the Irish National Show champion Baladin. 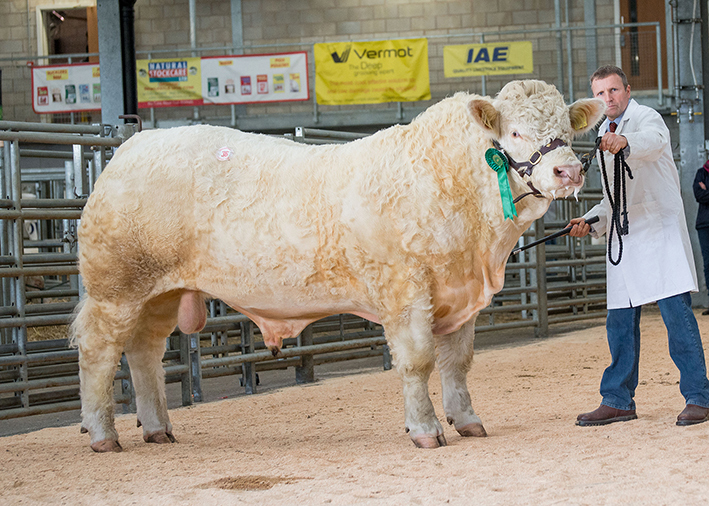 Myfanwy placed second in his class for breeder and exhibitor, Flintshire Vet Esmor Evans, who had a successful show also securing first and third places for his other entries. 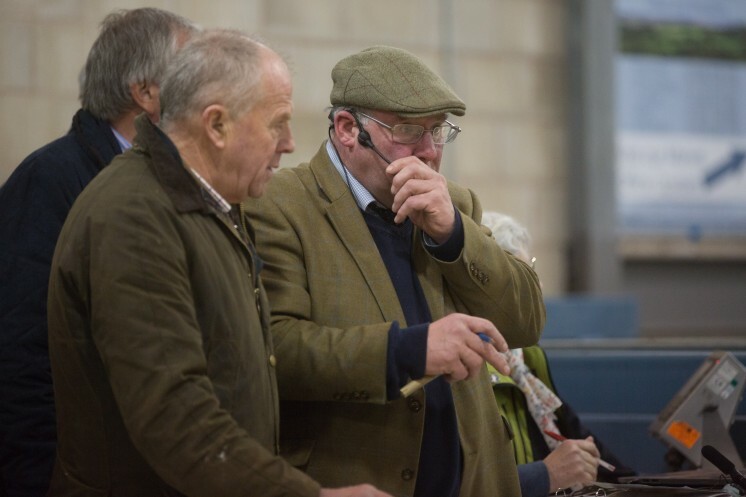 Equalling the 6,000gns price tag for Mr Evans was the 17-month-old, yellow ticket winner, Maerdy Morlo, who was purchased by Simon and Suzanne Frost, owners of his sire Vexour Freddy. 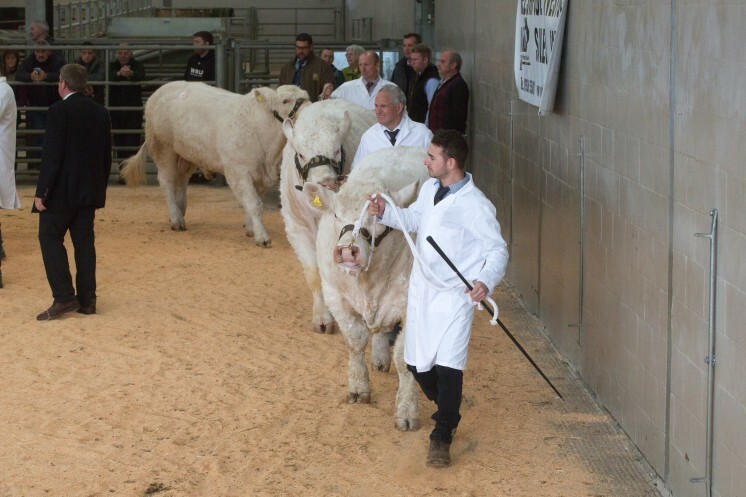 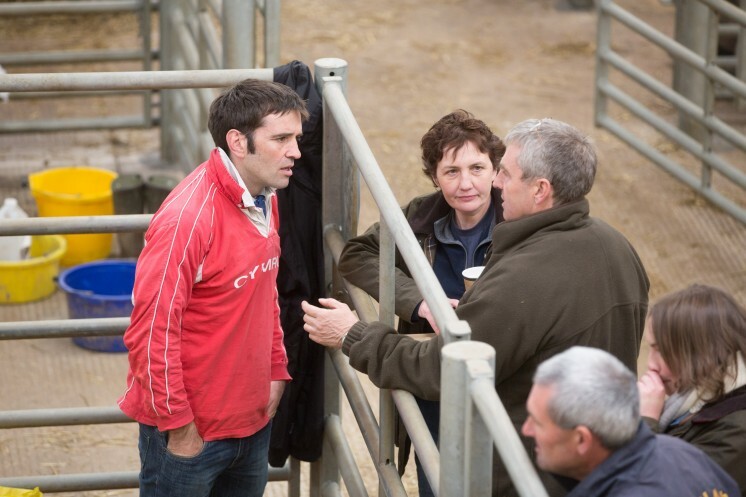 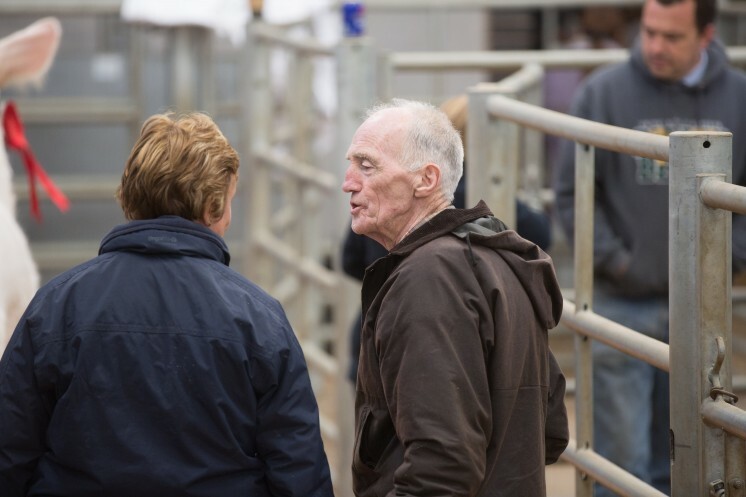 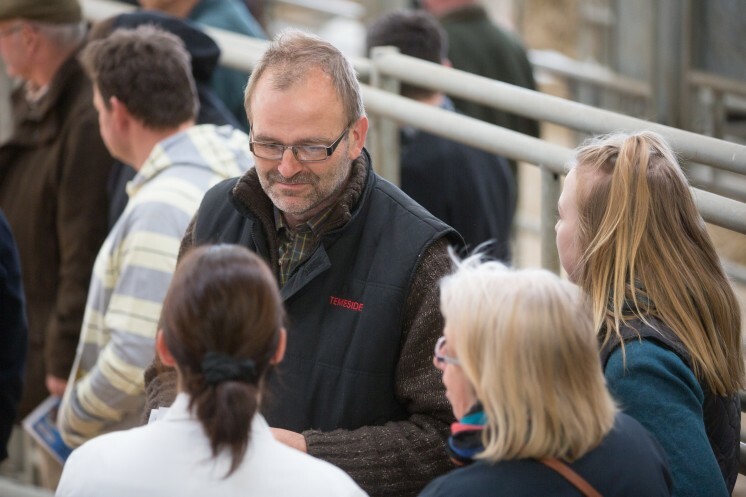 Simon who runs a 125-spring-calving suckler herd in Bakewell, Derbyshire, did his homework before visiting the sale and selects his bulls very carefully on EBV’s as well as looks commented that, “He has an undoubtedly superior carcase and he has out-scanned his intermediate figures”. 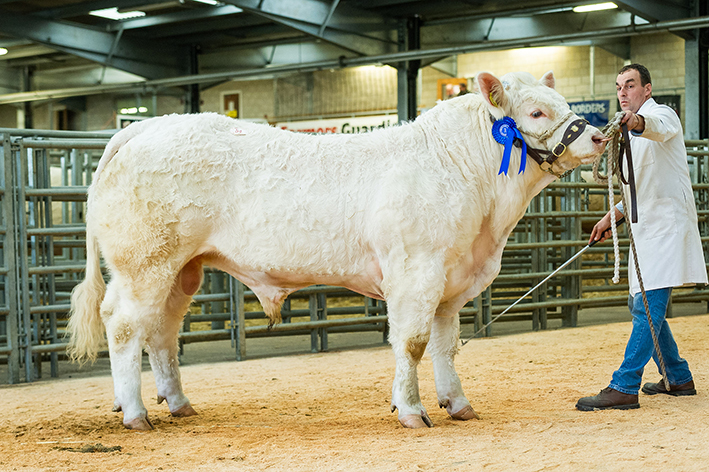 Morlo’s dam Maerdy Gwin is sired by the proven high performing short gestation and easy calving Blelack Digger. Commanding a 5,600gns bid from Tynybryn Farms, Tregynon, Powys, was the April-2016-born Caylers Maverick. 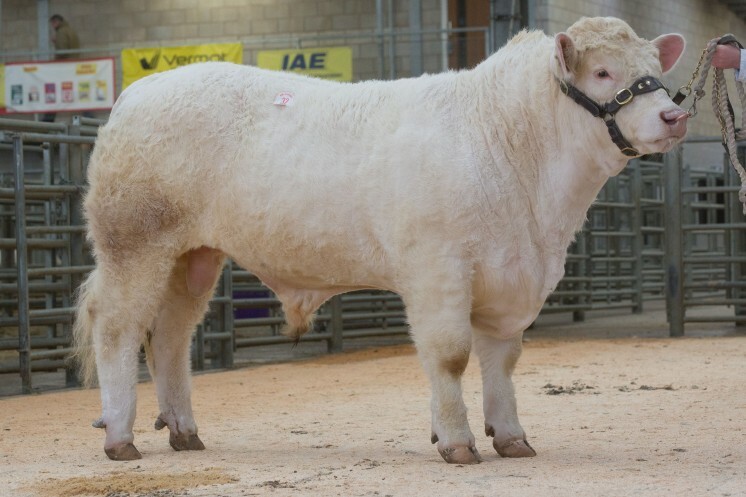 Sired by the Irish bred Rosanne Jupiter and out of the Maerdy Uniroyal sired Caylers Ella, Maverick was bred and exhibited by the Barker family of Caylers Charolais, Nuthampstead, Hertfordshire. Next in the trade stakes at 5,500gns was a 16-month-old bull offered by the Corbett family, Felindre, Powys, and purchased by Messrs Evans, Pwllhelli, Gwynedd. 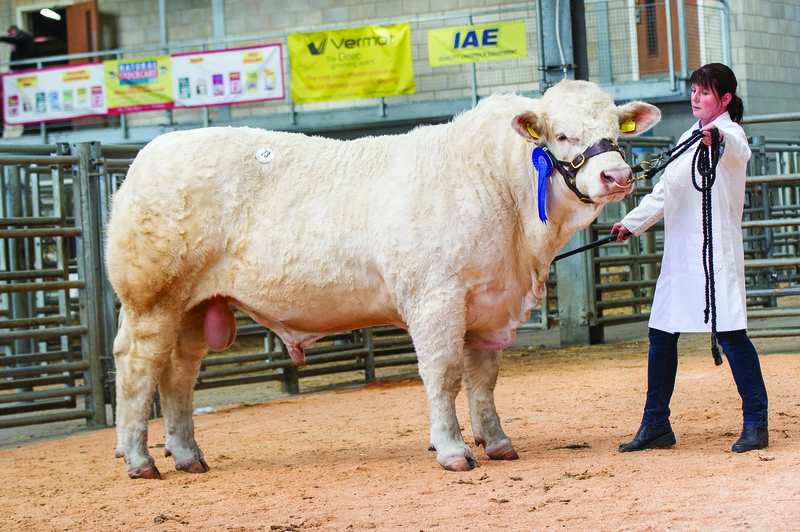 Teme Magnum who had been tapped out second in his class at the pre-sale show, boasts some top-class pedigree breeding behind him. 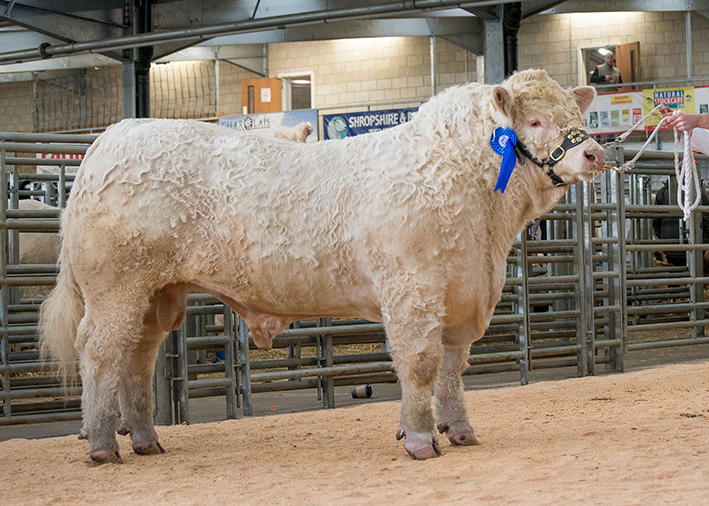 His sire is the 70,000gns Royal Welsh supreme champion Barnsford Ferny, while his dam Pedr Indigo – who can count breed champion awards at both the Shropshire and Oswestry show amongst her many ring successes – is sired by the 12,000gns Royal Welsh show supreme champion Thrunton Classic. The females on offer met with a ready trade, with all six finding new homes and averaging £2,826.25. Leading the bids at 4,000gns was the female champion from Gerwyn Jones, Nebo, Conwy. The March-2015-born Graiggoch Lucy, is a daughter of the 16,000gns Stirling junior champion Clyth Diplomat and the 25,000gns Perth supreme champion Mowbraypark Orlando sired Thrunton Starband. She was purchased by Kevin Thomas who was in the mood to spend after doing so well with his bull sales earlier in the day. The 18-month-old reserve female champion from EH Pennie and Son, Montgomery, Powys was next in the trade stakes at 3,100gns. 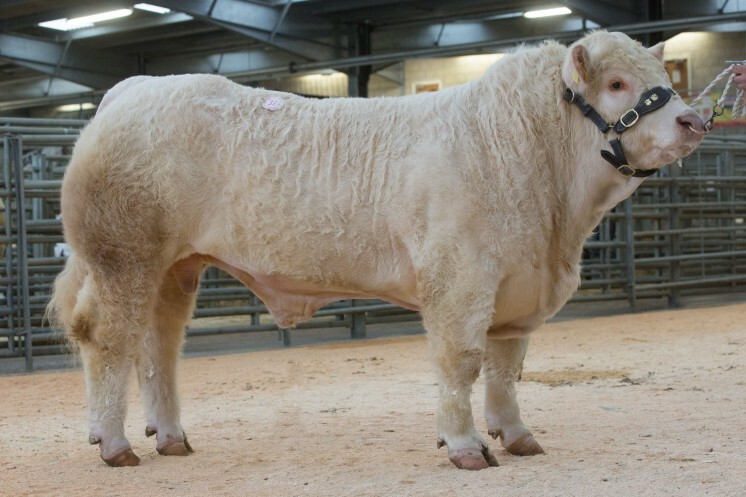 Sarkley Marianna who was purchased by T Rich, Mold, Flintshire, is sired by Lisnagre Hansome and out of Sarkley Brianna who goes back to Roundhill Rocky. Finishing off the female trade and trading for 2,700gns apiece, were a pair of two-year-old Anside Excalibur daughters, bred and exhibited by the aforementioned Gareth Jones. Esgob Lollypop and Esgob Lea who sold served to the 12,000gns Caylers Hustler, both took the fancy of Mr D Owen and went on home with him to Aberdovey, Gwynedd. 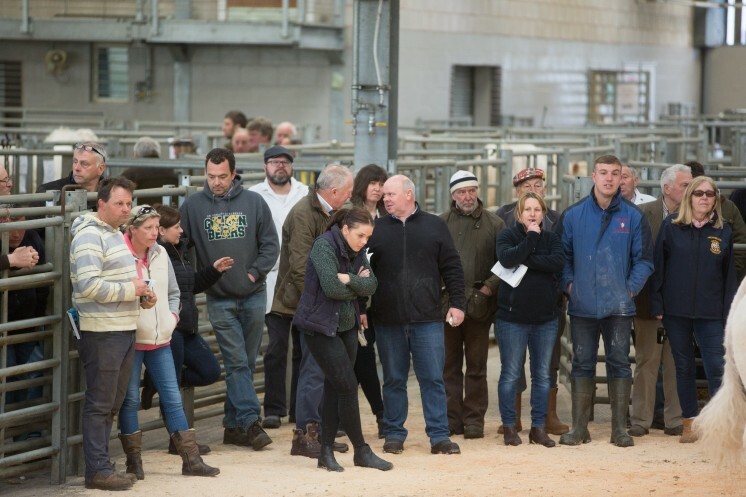 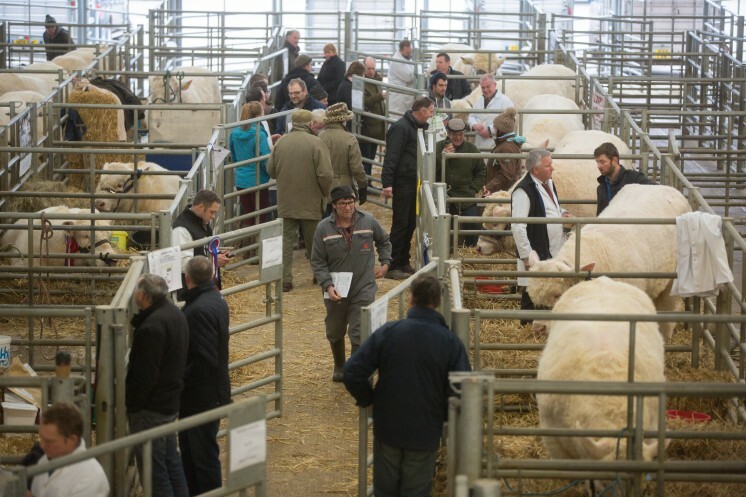 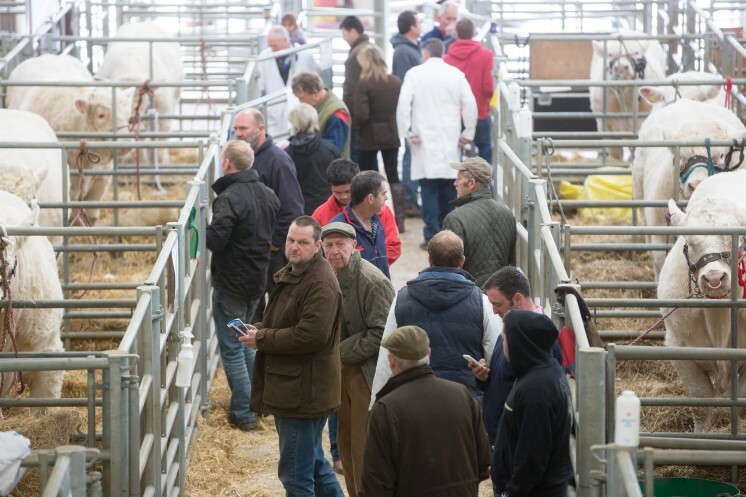 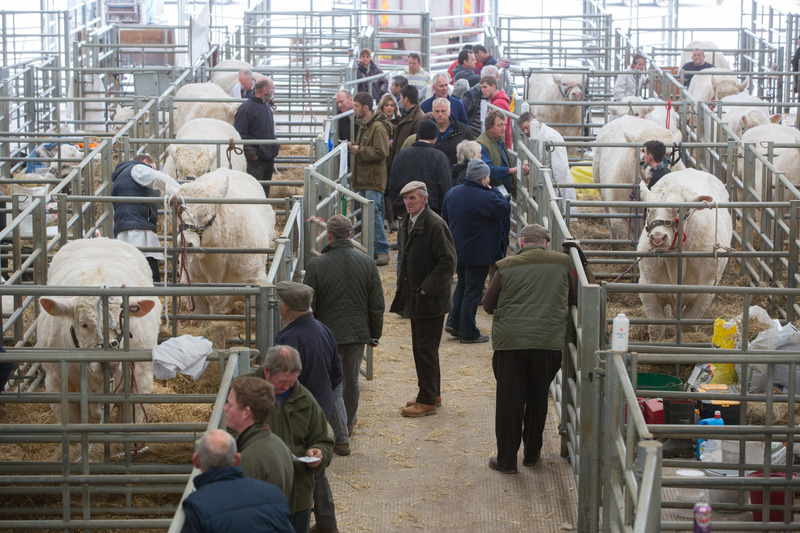 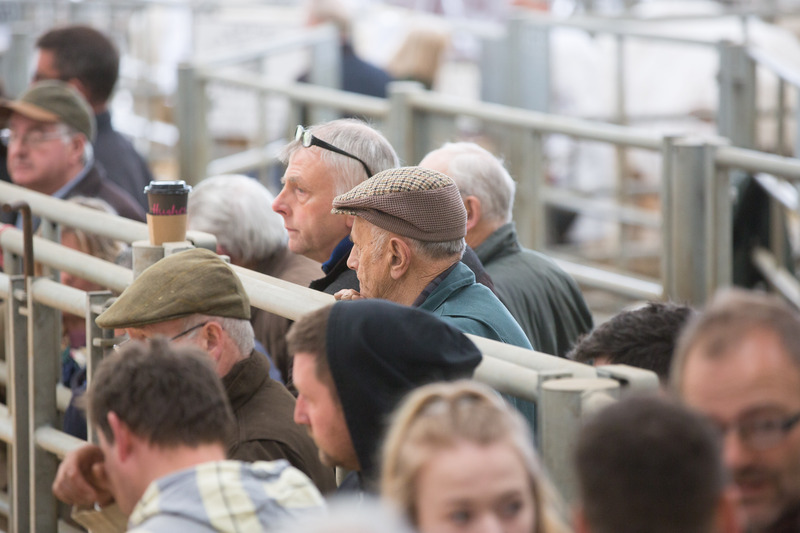 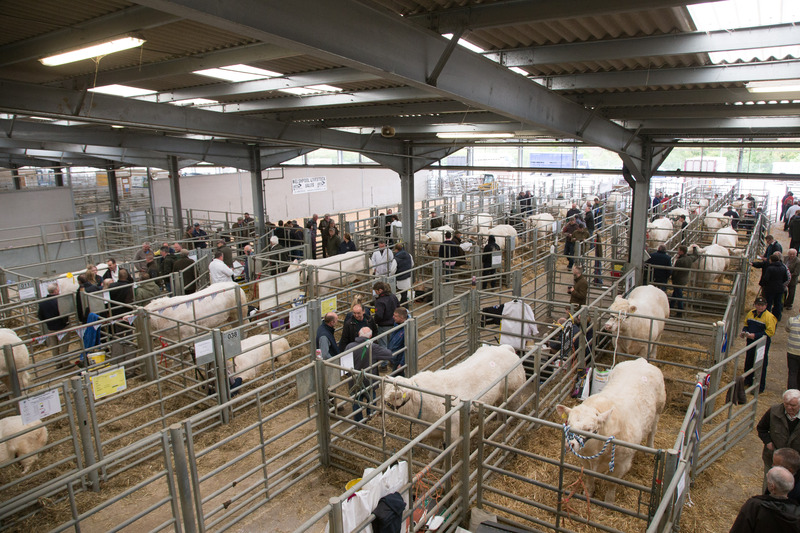 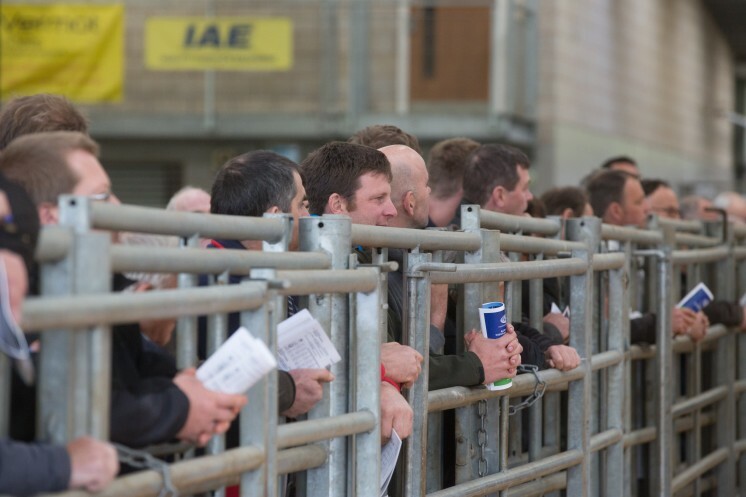 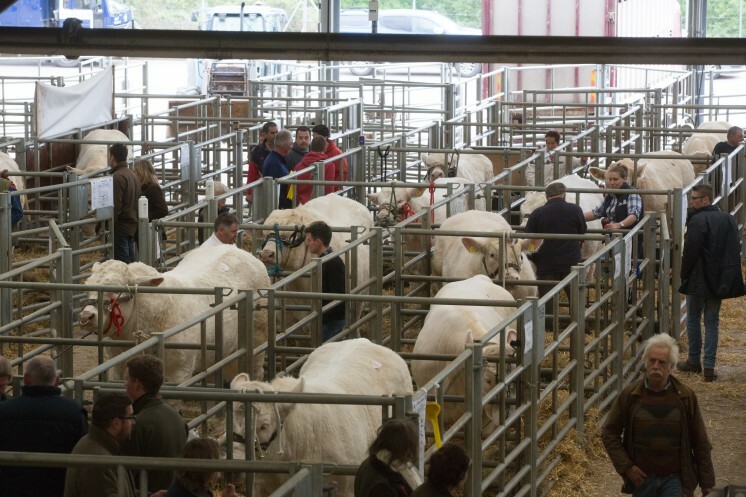 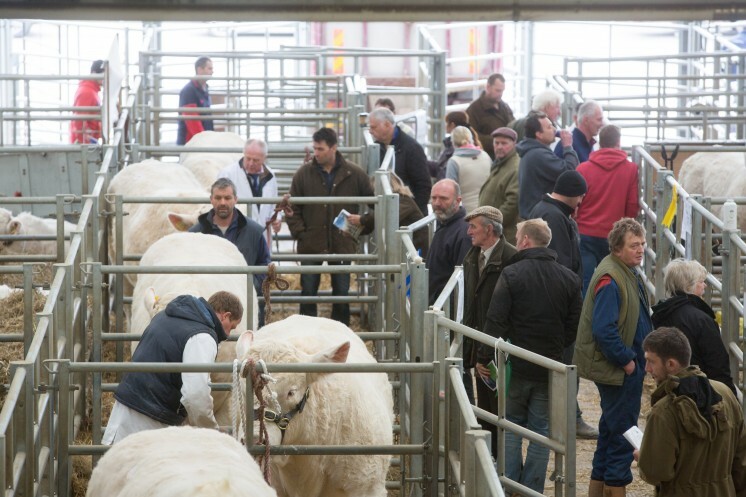 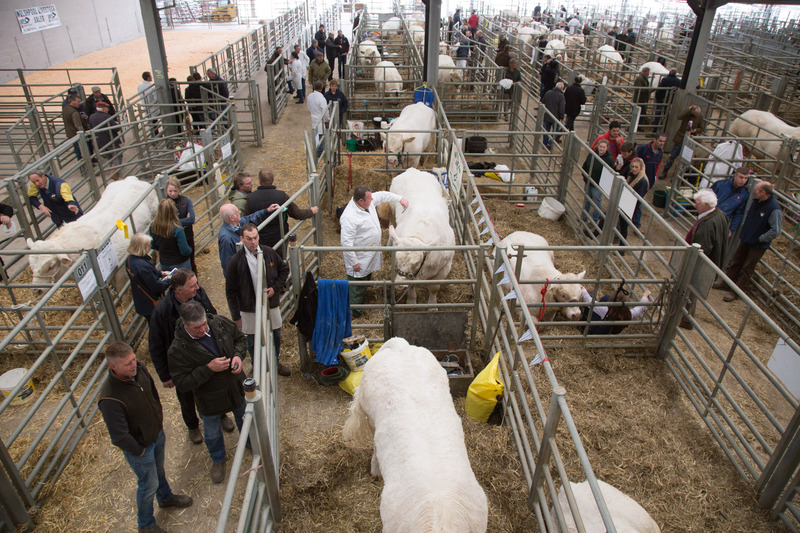 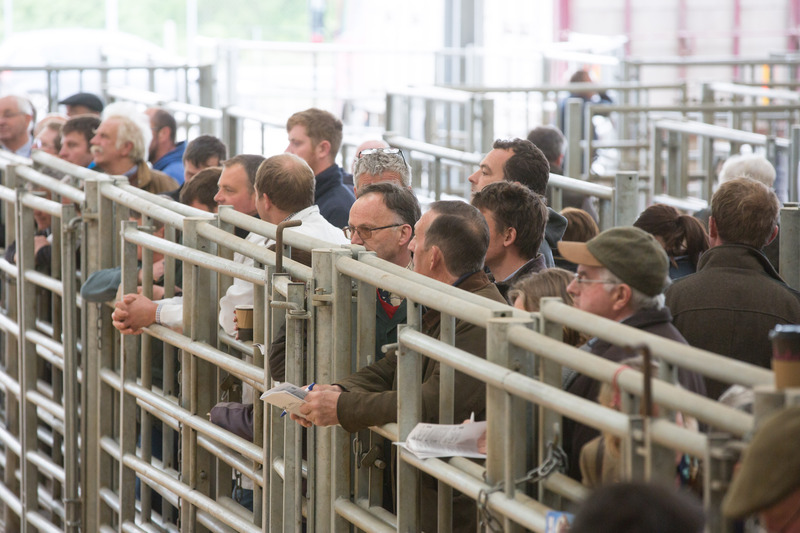 The ring was packed to the brim for the Charolais sale at Welshpool on Saturday April 29 driven by the Charolais success in the store ring here on Tuesday. 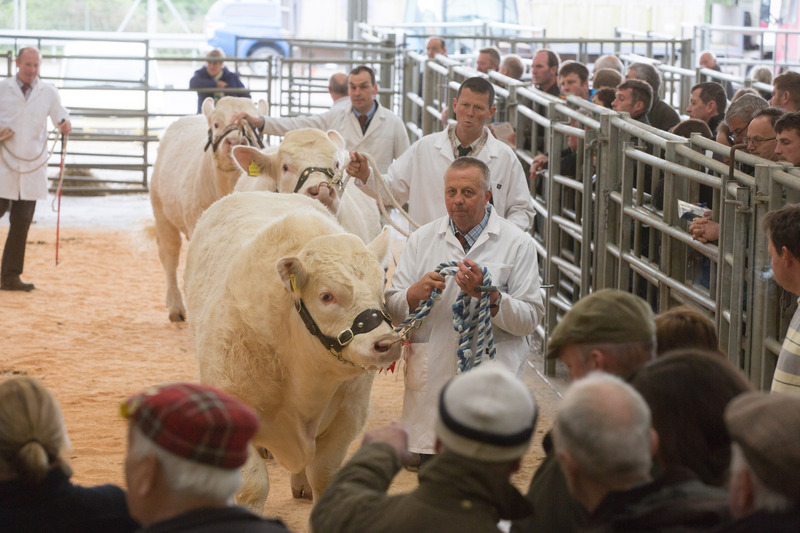 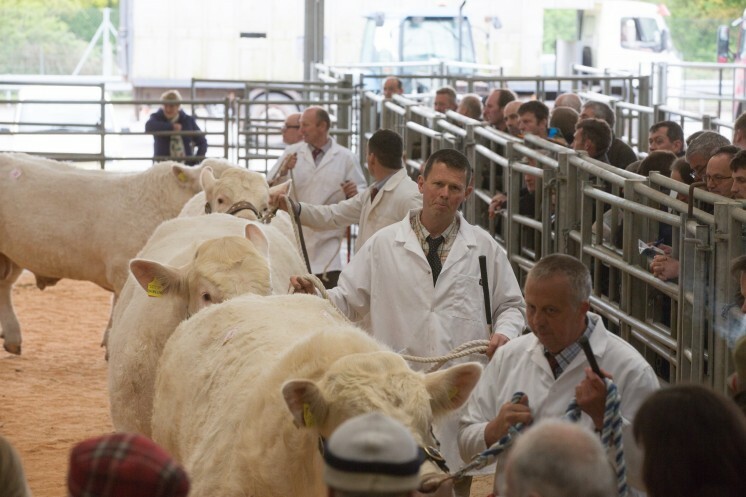 Bulls averaged £4417.50, an increase on last year of £288 and clearance rates were also up on the year by 9% to 85% with 11 bulls selling for 5,000gns and above. 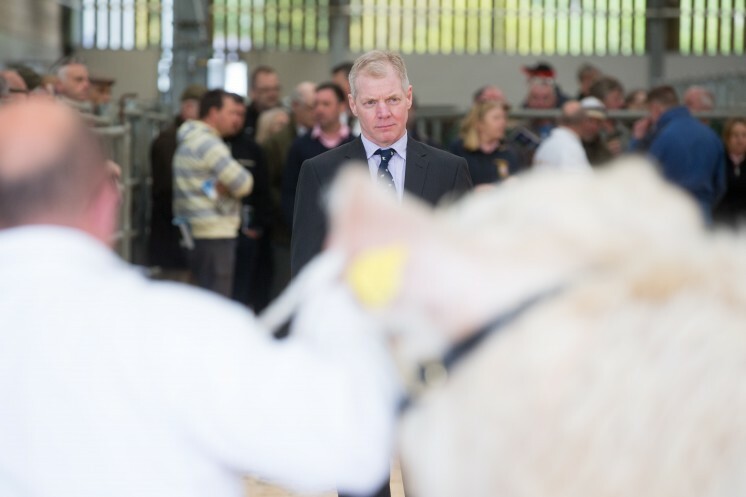 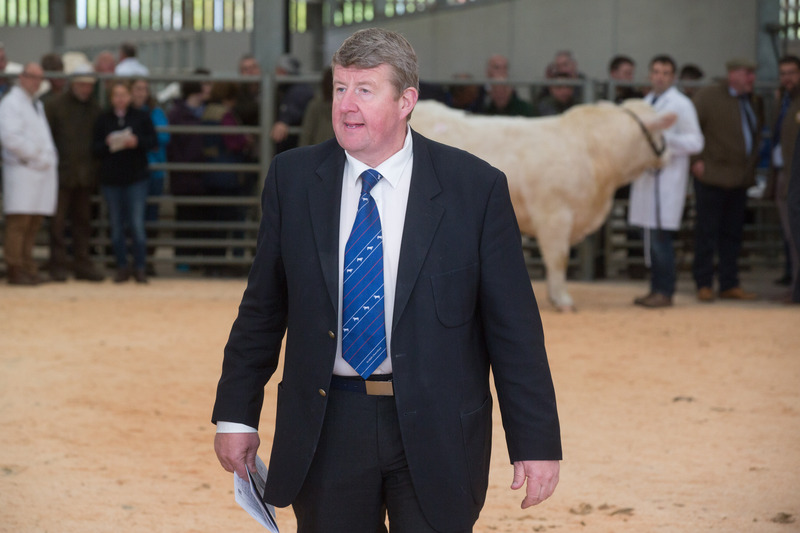 Society Chairman Andrew Hornall commented, “The commercial traders were out in force today looking to secure a Charolais bull which reflects the recent trend in the store markets where Charolais sired suckler calves are topping the markets on weight for age”. 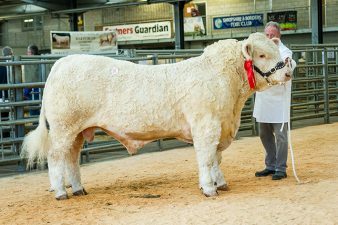 The sale leader at 6,400gns was the reserve champion Brynffanigl Math from the delighted Bob and Huw Roberts, Abergele, Clwyd. 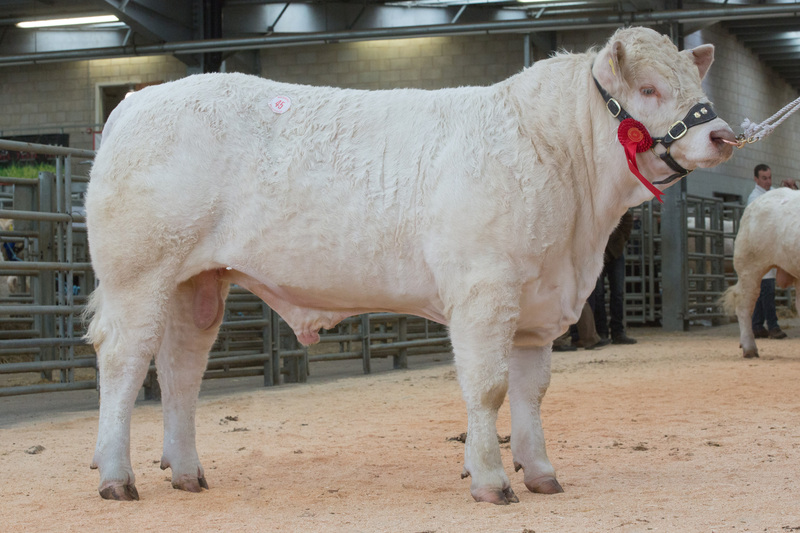 Math was the youngest lot at the sale at just 13 months old, is sired by the 22,000gns Newhouse Bigal and out of the homebred dam Brynffanigl Fion who goes back to the 17,000gns Alsnow Almighty and whose last calf sold for 4,400gns this time last year. 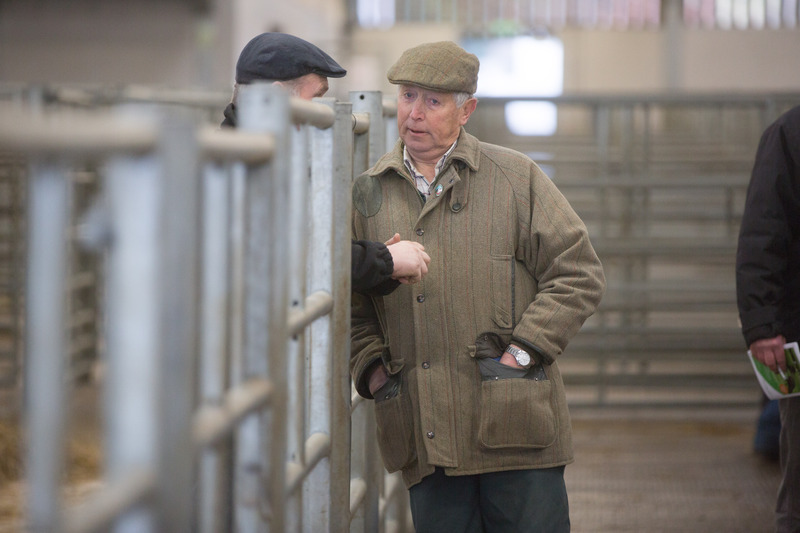 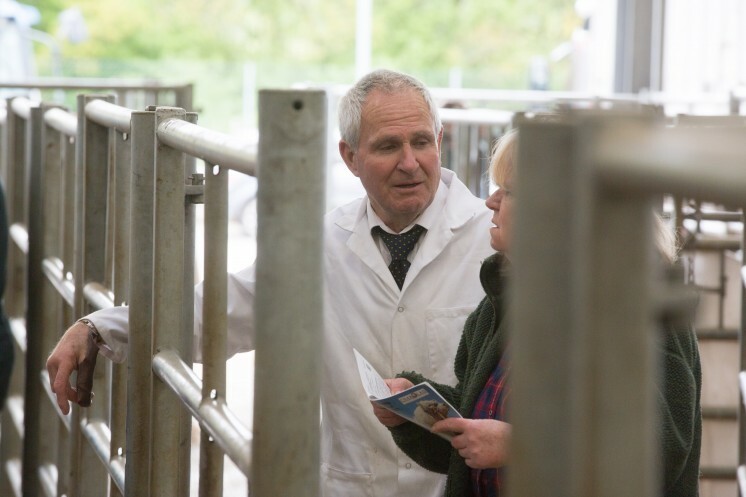 Math stays local as Arthur Williams of DC Evans and Co, takes him back to work at his 120 strong suckler herd in Abergele, Clwyd. Close behind and the first of two to sell at 6,000gns was the day’s champion. 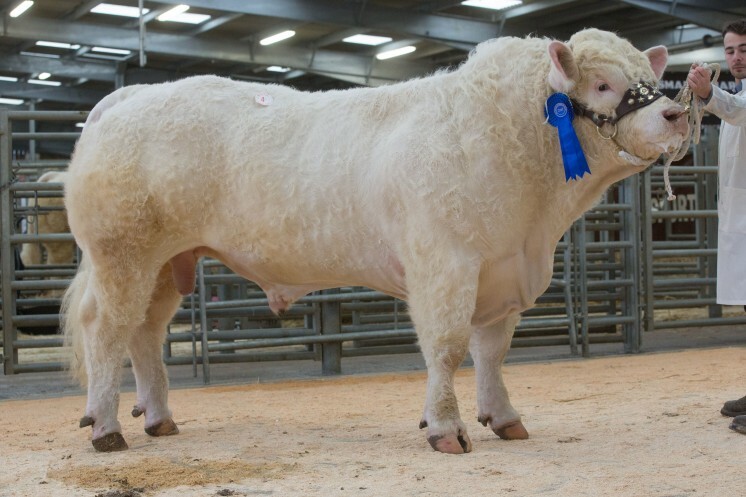 Bred and exhibited by Mr Gareth Jones, Cwmtirmynach, Gwynedd, the December-2015 born Esgob Lionking is sired by the proven high performing short gestation and easy calving Blelack Digger and his home-bred dam is sired by the 26,000gns Carlisle junior champion Anside Excalibur. 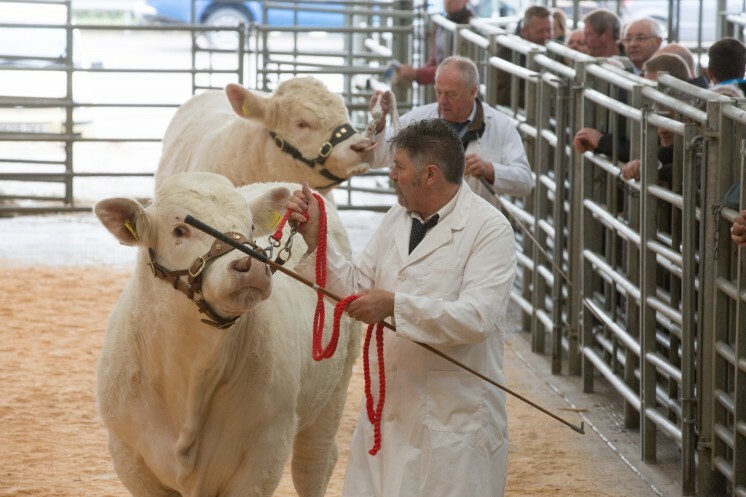 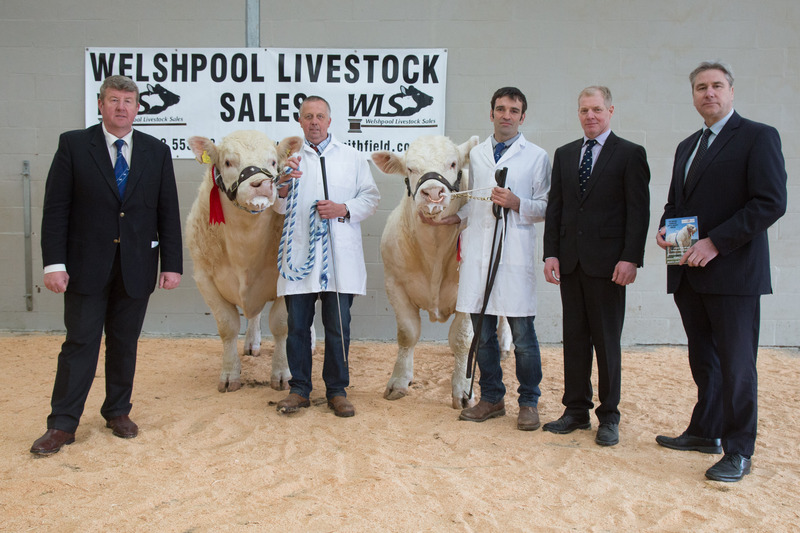 Purchasers TWA Jenkins, Llandysul, Ceredigion agreed with the show judge Ian Goldie who had selected Lionking as champion and commented that “He is a very correct fleshy bull with good character”. Also selling for a 6,000gns ticket price was the 21-month-old Maerdy Llawes who was snapped up by DS Tudor, Corwen, Clwyd. 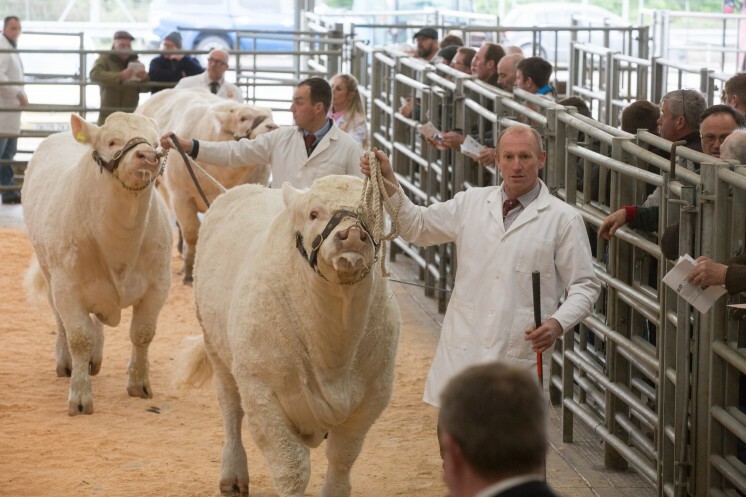 The breeding here includes sire the 26,000gns Maerdy Hearthrob and dam Maerdy Happiness, a daughter of the 13,000gns Highland Show junior champion Kelton Trident and Llawes was bred and exhibited by Flintshire Vet Esmor Evans. 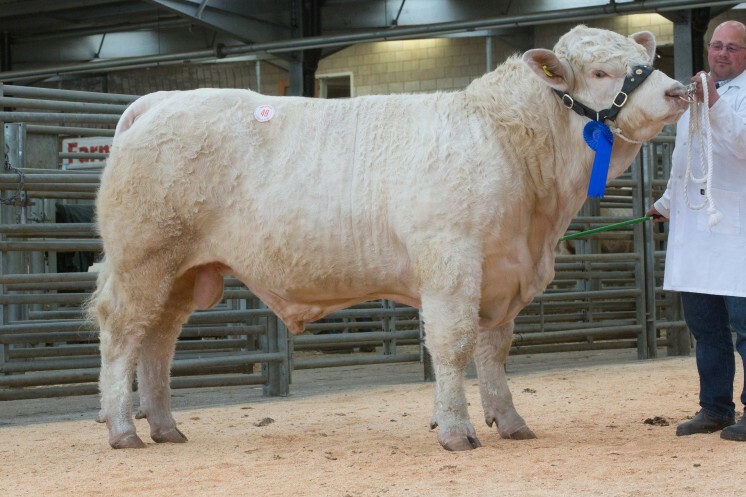 Mr Evans had another in the money later in the sale with his February-2016 born class winner Maerdy Mastermind who is sired by the French born Maerdy Gouverneur. 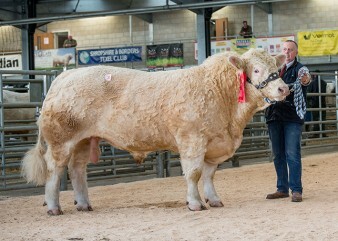 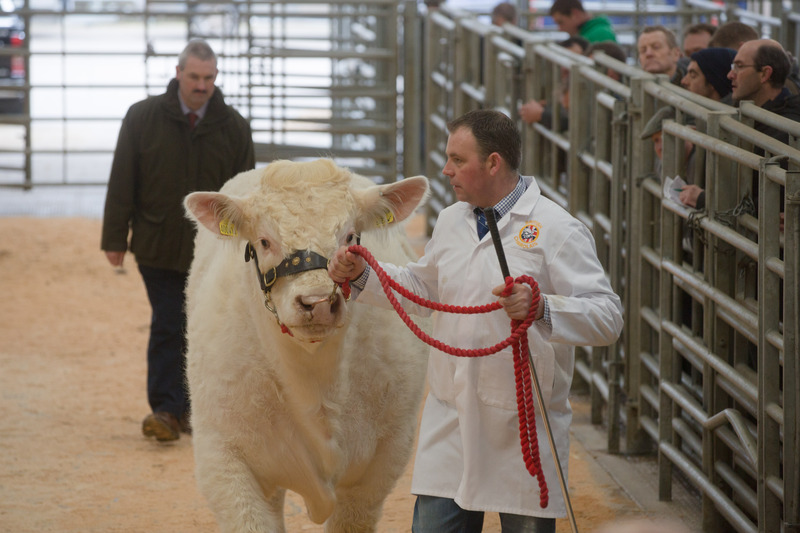 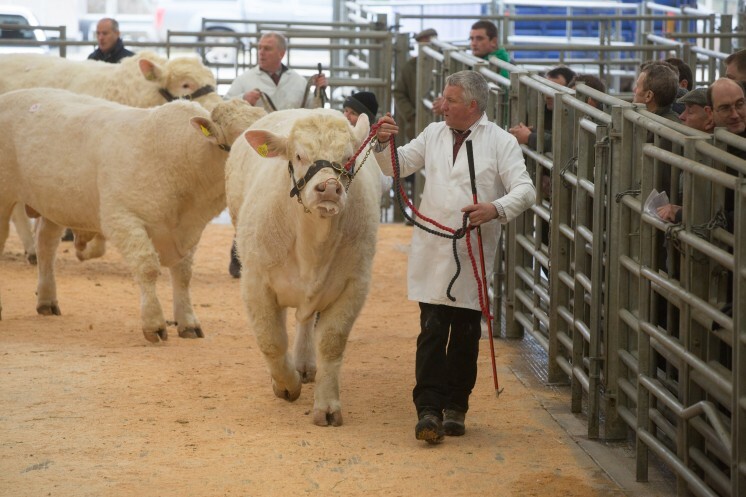 JR Jones, Caernarvon, Gwynedd was the man with his hand in the air as the hammer went down at 5,300gns on this one. 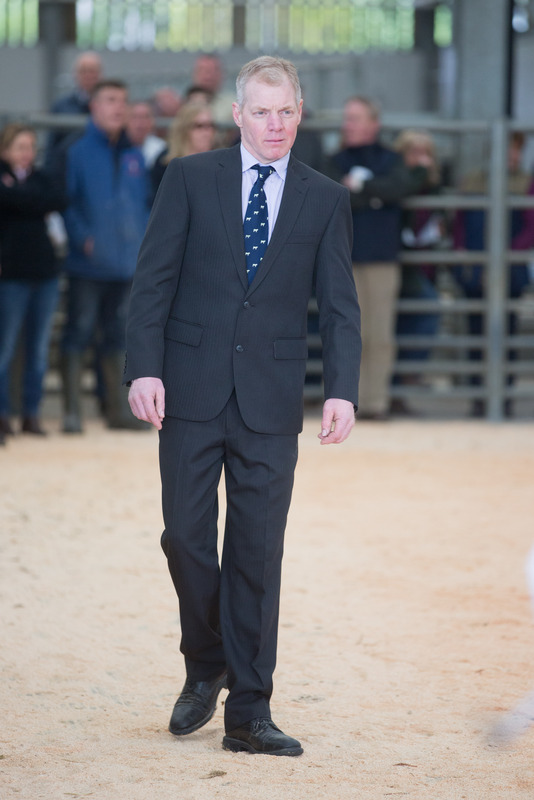 Dan Harman, Chesham, Buckinghamshire also had a profitable day selling two of the top priced lots both sired by the 12,000gns Wesley Equinox. 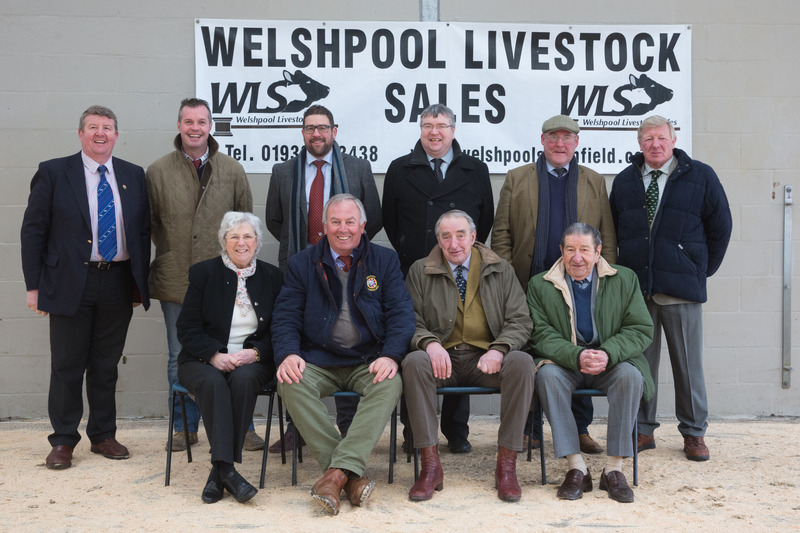 The highest priced at 5,600gns was Silver Montecristo, a 14-month-old whose home-bred dam goes back to the 13,000gns Blelack Crusader and was purchased by M Griffiths and Co, Pwllhelli, Gwynedd and minutes earlier M Jones, Lledrod, Aberystwyth paid 5,400gns for the 15-month-old Silver Maximus. Two bulls sold for the next highest price of 5,200gns. 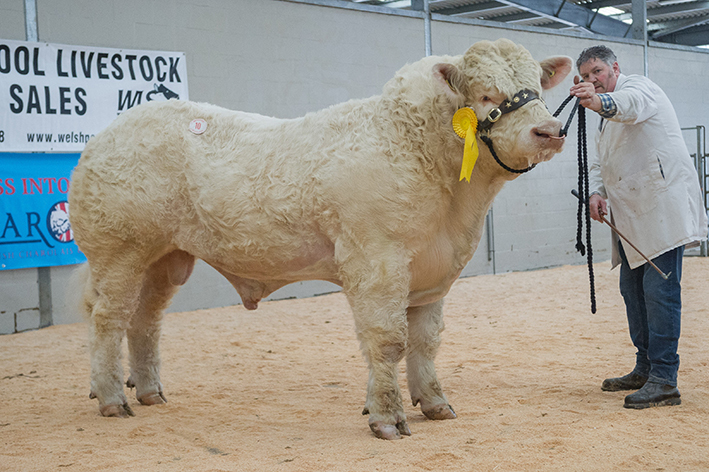 The June-2015 born Trannon Likelylad from John Williams, Caersws, Powys was the first, he had been awarded a yellow ticket in his class at the pre-sale show and DM Jerman and Co, Llanidloes, Powys were the purchasers of this Wesley Evolution son. 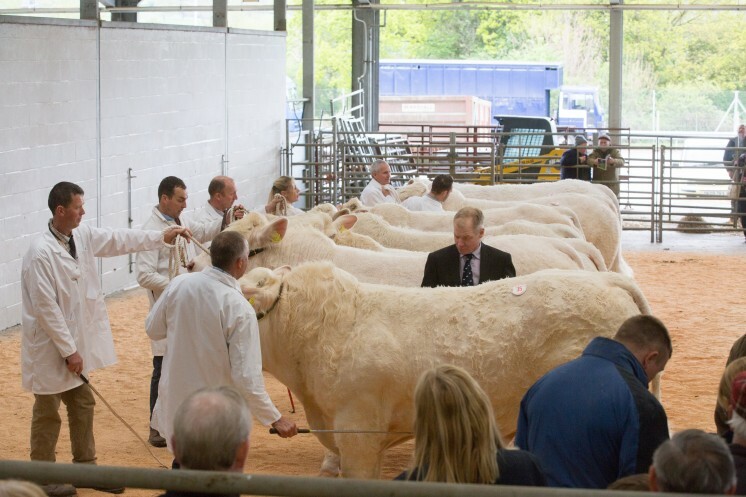 Then David and Bernadette Stacey, St Austell, Cornwall also secured 5,200gns from DA Jones and Co, Llanidloes, Powys for their 14-month-old entry. Polgoda Mackenzie who had placed second in his class earlier in the day is sired by the Cornwall Show champion Balbithan Eria. Three bulls were knocked down at 5,000gns a piece with the first coming from Billy and Sarah Turner, Skelton on Ure, North Yorkshire. 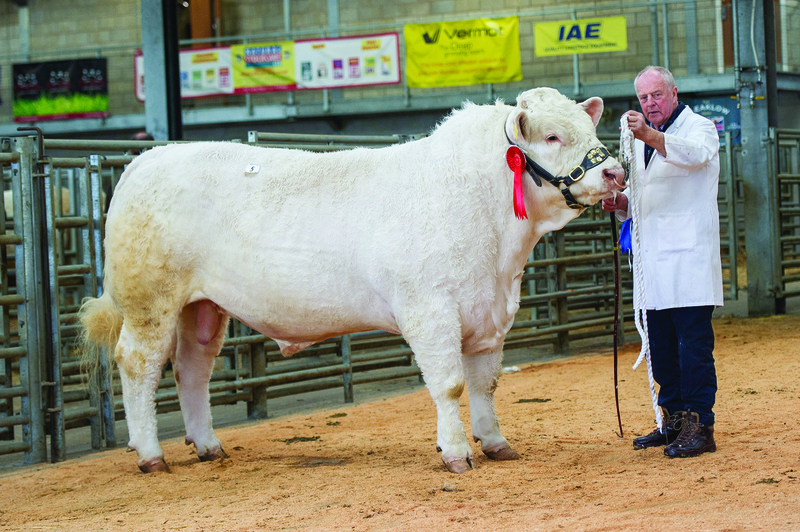 Brampton Limelight, a March-2015 born son of the 22,000gns Burradon Goldenballs caught the eye of AK Watkins, Kentchurch, Herefordshire. 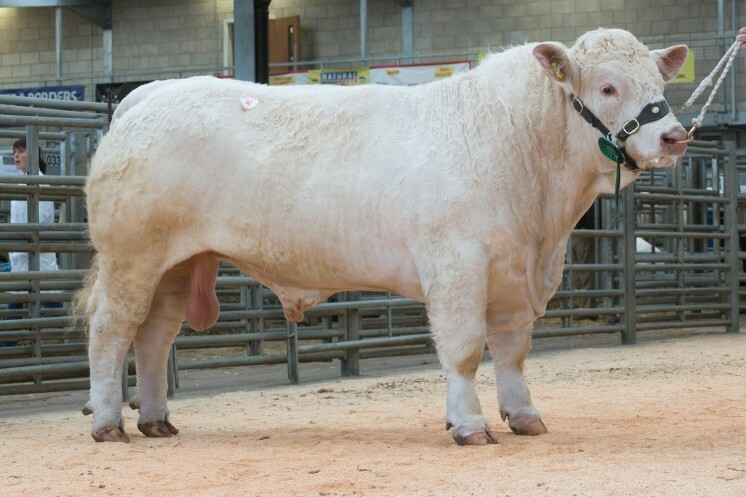 The second to sell for 5,000gns, this time going home with Premier Barton Farms to work in Exeter, Devon, was the 23-month-old 10,500gns Midas Furious son Brestbaily Legend from WJ Lewis and Son, Brecon, Powys. 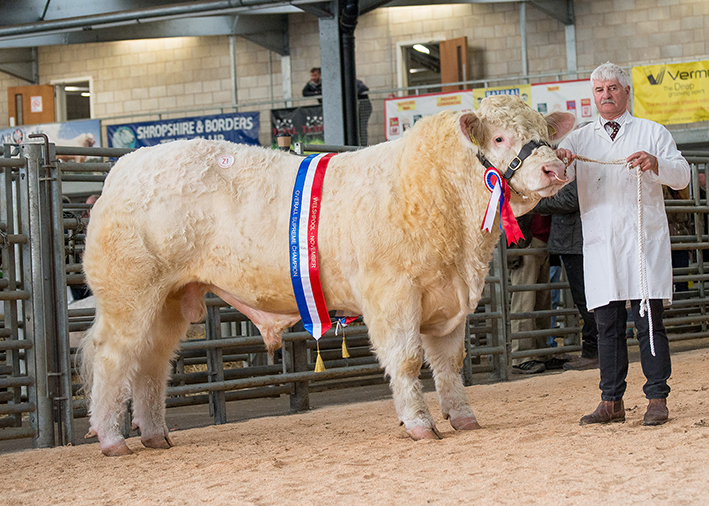 Matching the 5,000gns price tag was Carrigbeg Longjohn from exhibitor Richard Butler, Barbers Bridge, Gloucestershire and JT Davies, Llandrindod, Powys were the purchasers of this November-2015 born 18,000gns Thrunton Fairfax son. 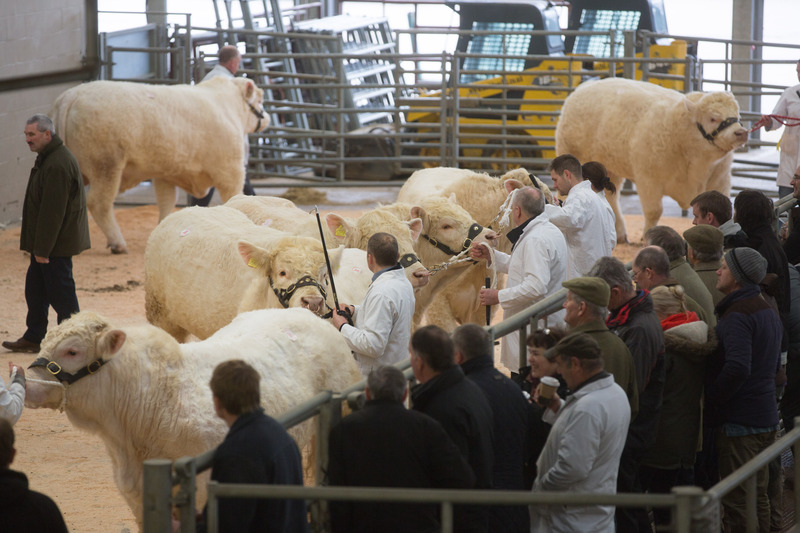 Charolais bulls met a strong commercial demand at Welshpool on Thursday 9 February, topping at 5,500gns with 18 bulls selling at an average of £3675 – up £225 on the year. 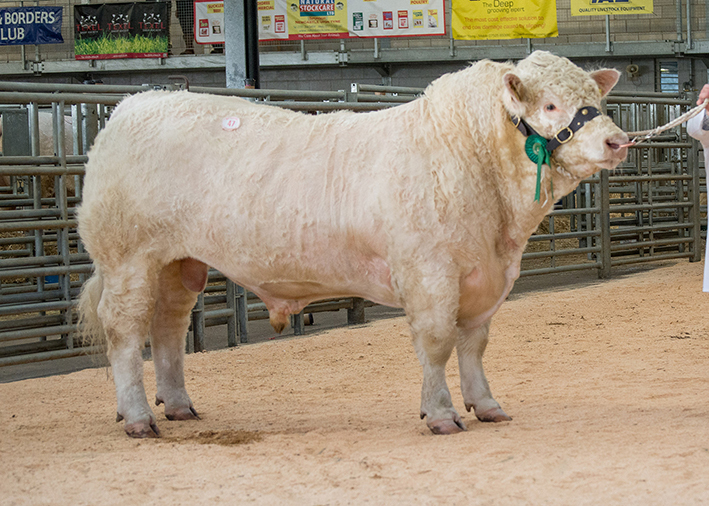 Topping the lots and securing a price of 5,500gns from Mr HT Jones, Cardigan, Ceredigion, was the 16-month-old Trefaldwyn Laird who was the first of four of the top lots to be sired by the renowned easy calving and short gestation bull Blelack Digger. Laird who is out of the home-bred dam Trefaldwyn Brilliant going back to the 25,000gns Perth supreme champion Mowbraypark Orlando, was bred and exhibited by Arwel Owen, Welshpool, Powys. 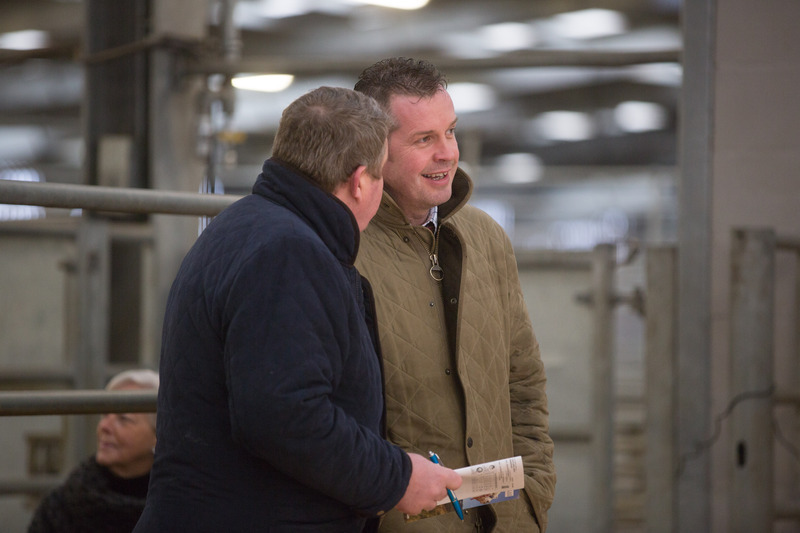 Earlier in the day Mr Owen sold the 17-month-old Trefaldwyn Leader, another Digger son this time out of the 10,000gns Trefaldwyn Usk daughter Trefaldwyn Dream. He was knocked down at 4,200gns to DLG Price and Co, Llandiloes, Powys. 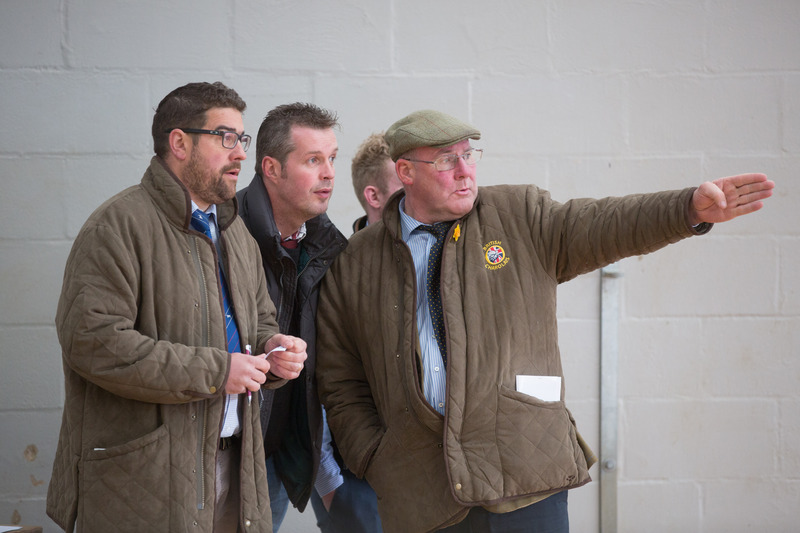 The second highest price of the day of 5,400gns was secured by Messrs Boden and Davies, Mellor Cheshire for their blue ticket winner and February-2015-born Sportsmans Luthur, a son of the 70,000gns Royal Welsh supreme champion Barnsford Ferny and a homebred dam going back to the 55,000gns Perth intermediate champion Thrunton Voldemort, who took the fancy of Carl Thomas, Montgomery, Powys. 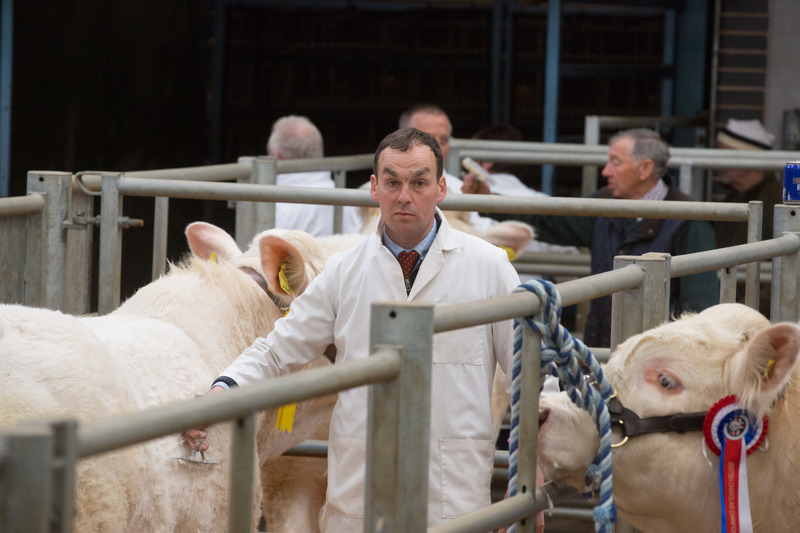 Flintshire vet Esmor Evans was also in the money with bulls making 5,000gns and 4,400gns respectively. 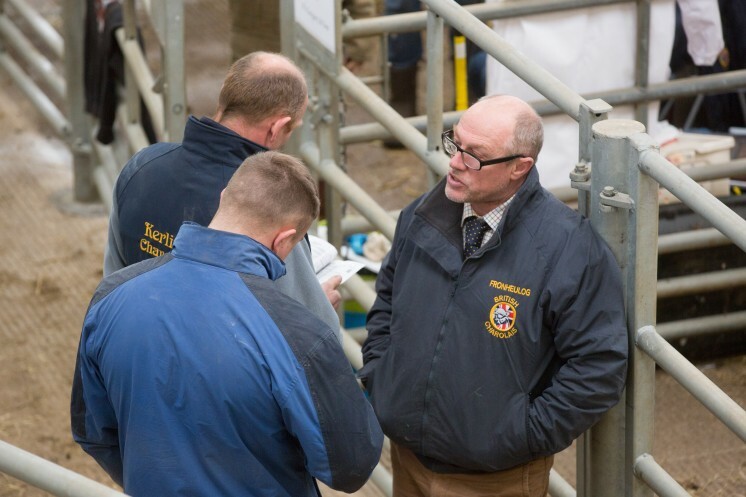 His highest priced was purchased by DG and E Williams, Welshpool, Powys was the 15-month-old Digger son Maerdy Lofty, who was tapped out first in his class earlier in the day. 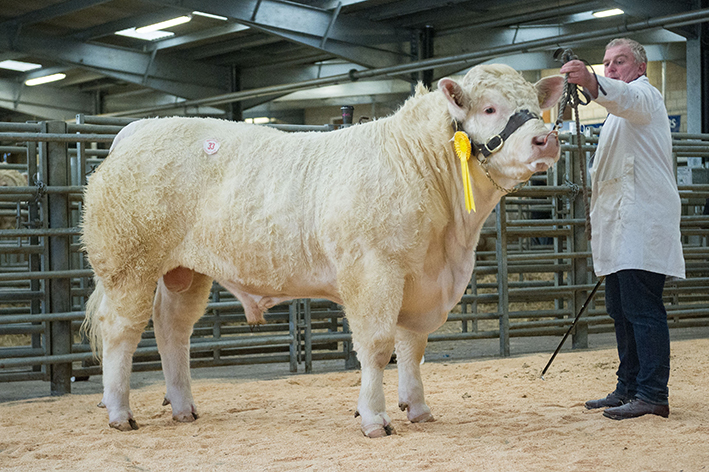 Then moments later Maerdy Lleuad sired by the Royal Welsh supreme champion Maerdy Ulm was snapped up by RI and G Davies, Wells, Powys. Commanding a 4,200gns bid from TW Jones and Son, Knighton, Powys was Caylers Lennox, another sired by Digger. 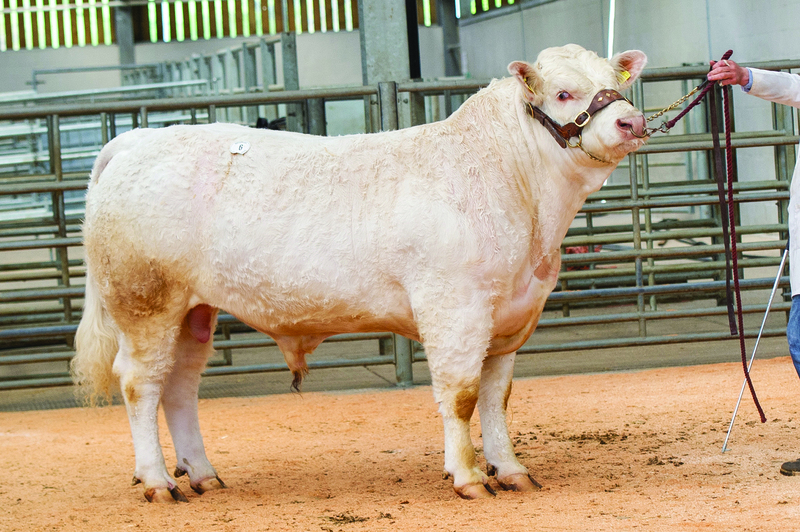 This November-2015-born lad was bred and exhibited by Caylers Charolais, Nuthampstead, Hertfordshire. 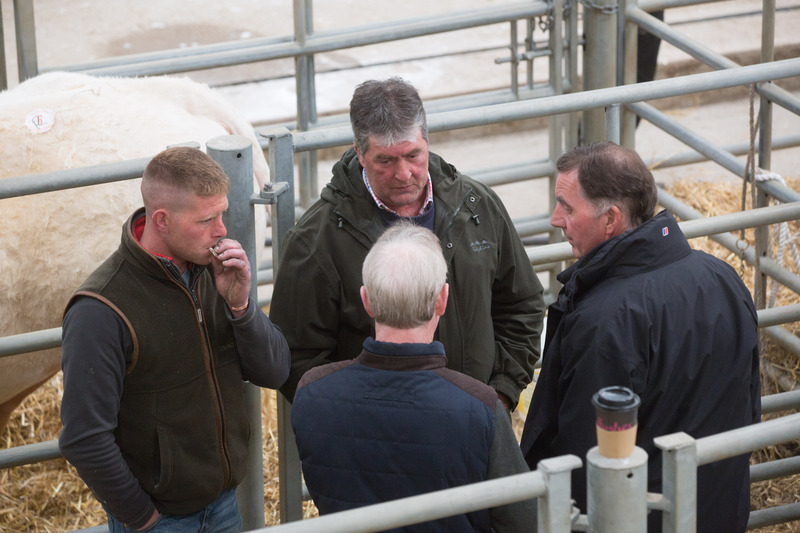 The Caylers team went on to sell Caylers Longbow, a 15-month-old son of the 10,000gns Thrunton Goldeneye and Caylers Ballerina, a daughter of Doonally New. 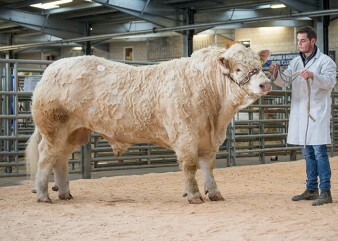 KR Williams, Camborne, Cornwall liked the look of Longbow and purchased him for 3,800gns. Next at 4,000gns was the 21-month-old Moelfre Liam who was placed second in his class at the Royal Welsh Show last year. 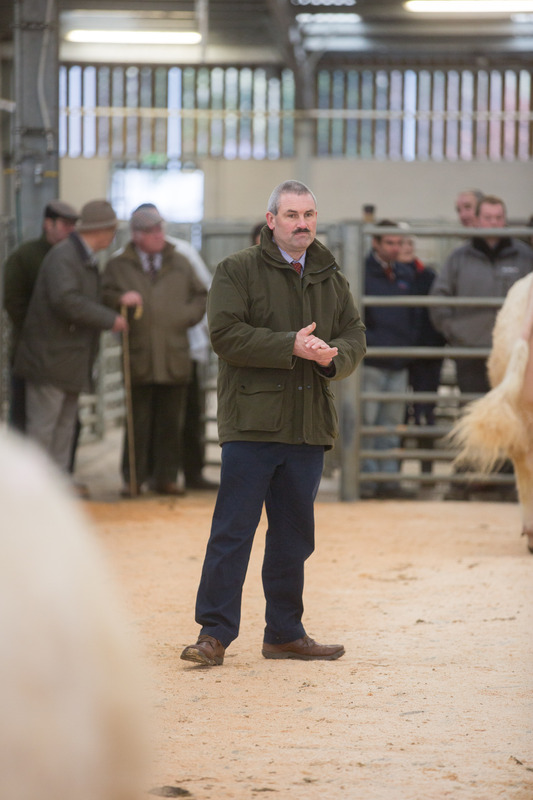 Kevin Thomas, Castlenewydd Emlyn, Carmarthenshire was the breeder of this Goldies Eddy son who goes on to work at Welshpool, Powys for Tirnewydd Farms. 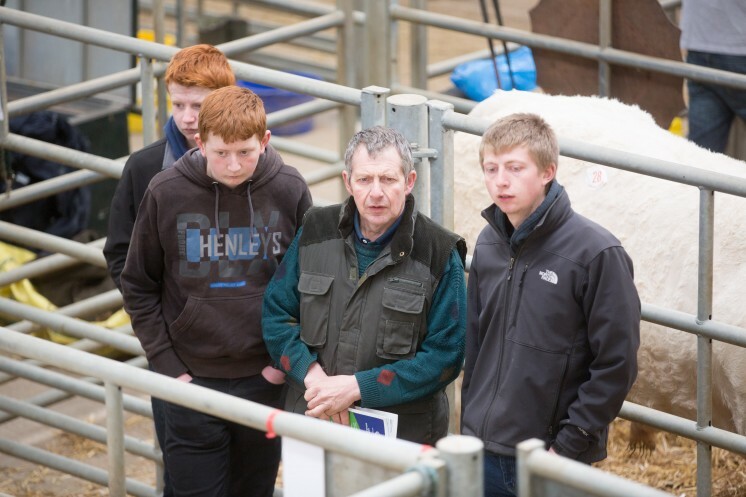 Making 3,200gns was a lot exhibited by Wyn Rees, Llandiloes, Powys. 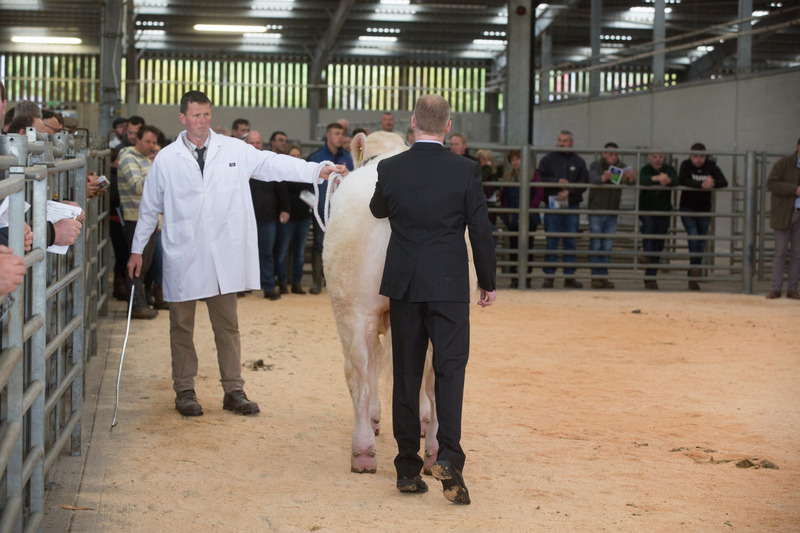 The May-2015-born Hendy Logic sired by Sandelford Gucci went home with GW Roberts, Criccieth, Gwynedd. 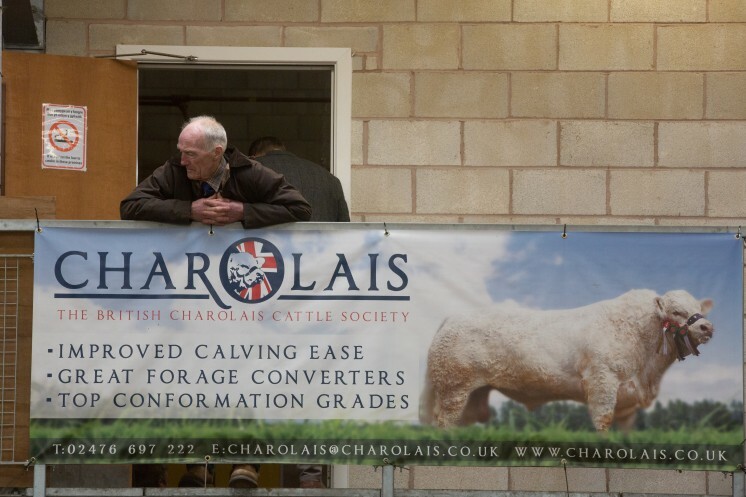 Another to bring 3,200gns when chapped down to RH Phillips and Co, Claines, Worcestershire, was Killerton Lawyer. 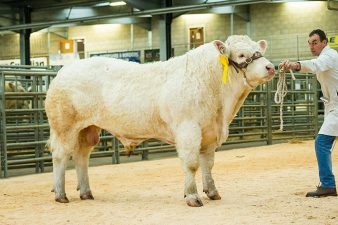 The 20-month-old Lawyer was crowned 2016 Beef South West young continental bull of the year for breeder and exhibitor Patrick Greed, Exeter, Devon and is sired by Alwent Goldbar. Just behind at 3,000gns was Wissington Lemonade consigned by John and Jenny Rix, Nayland, Essex. 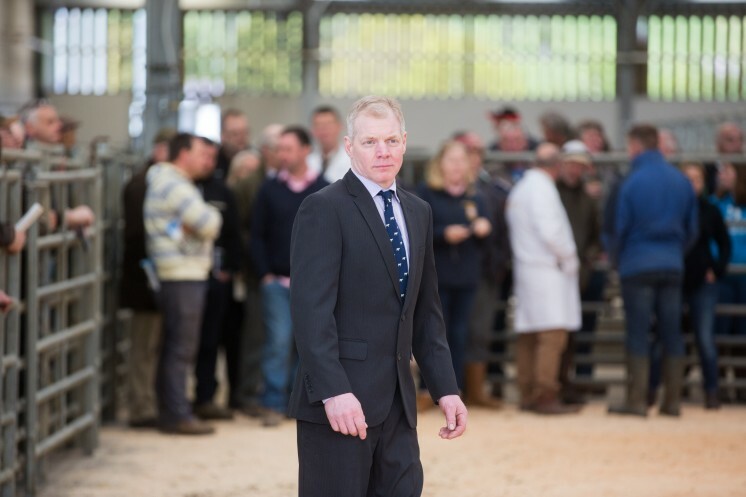 The man behind the money on this September-2015 born, Thrunton Hammerstein son was BM Robinson Jnr, Tenbury Wells, Worcestershire.